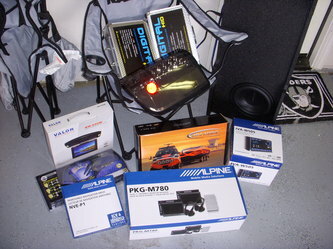 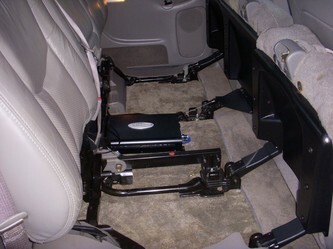 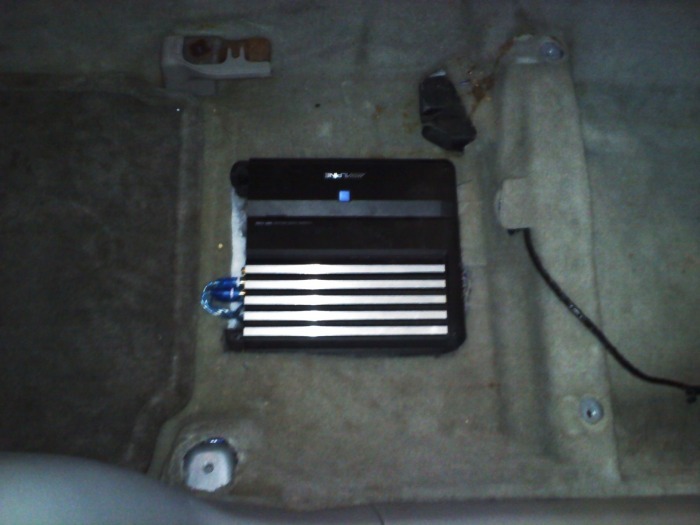 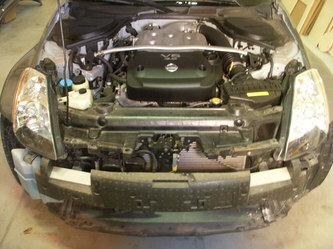 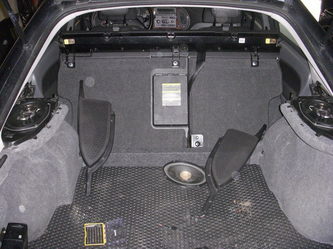 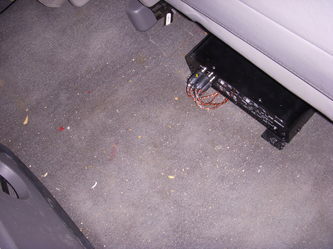 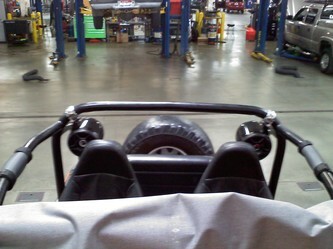 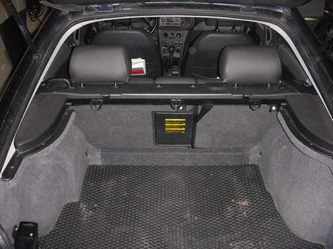 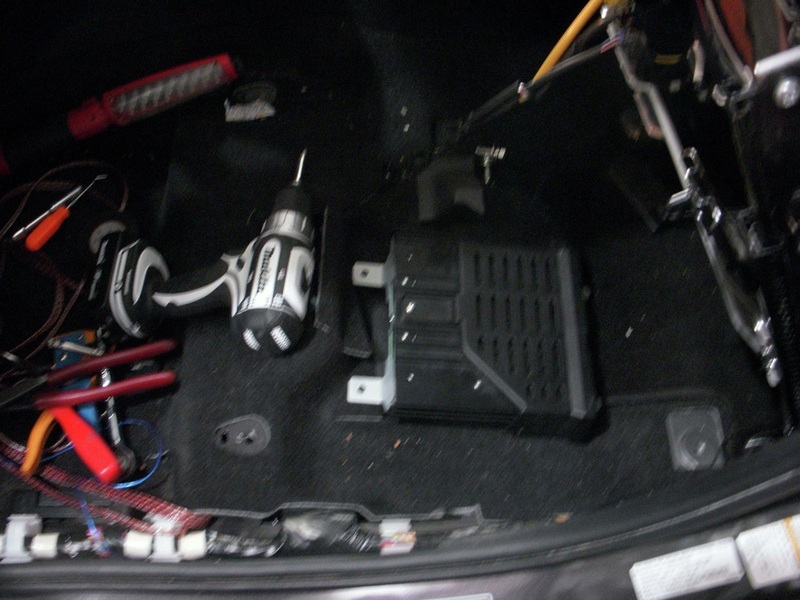 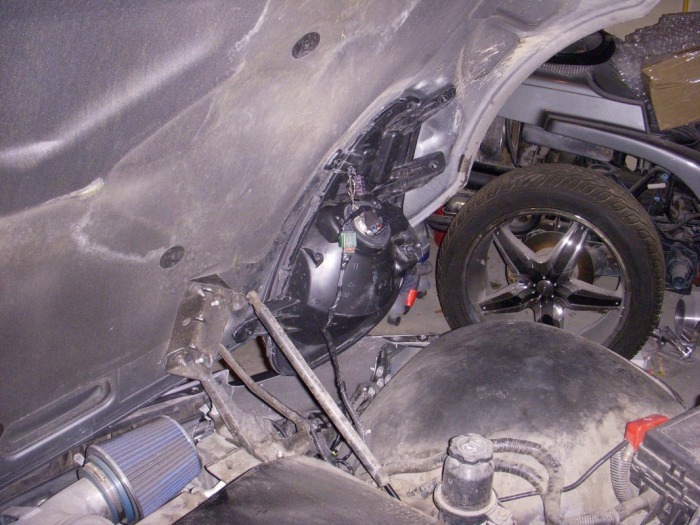 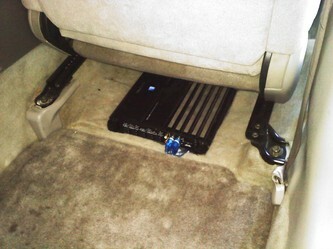 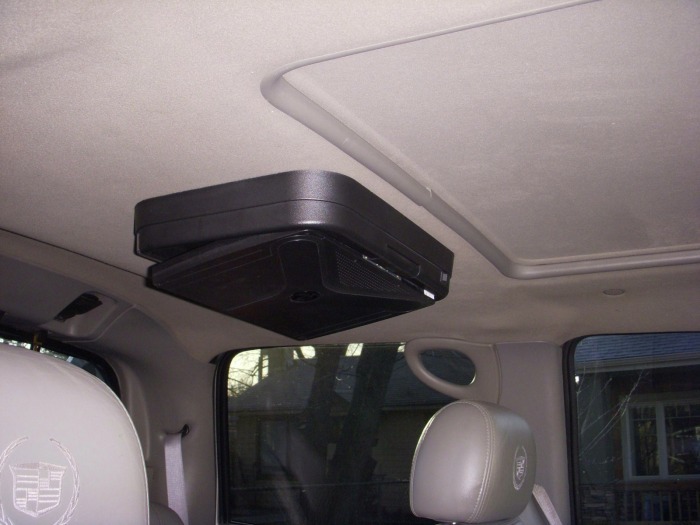 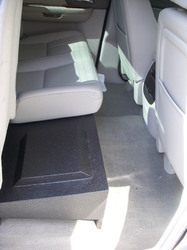 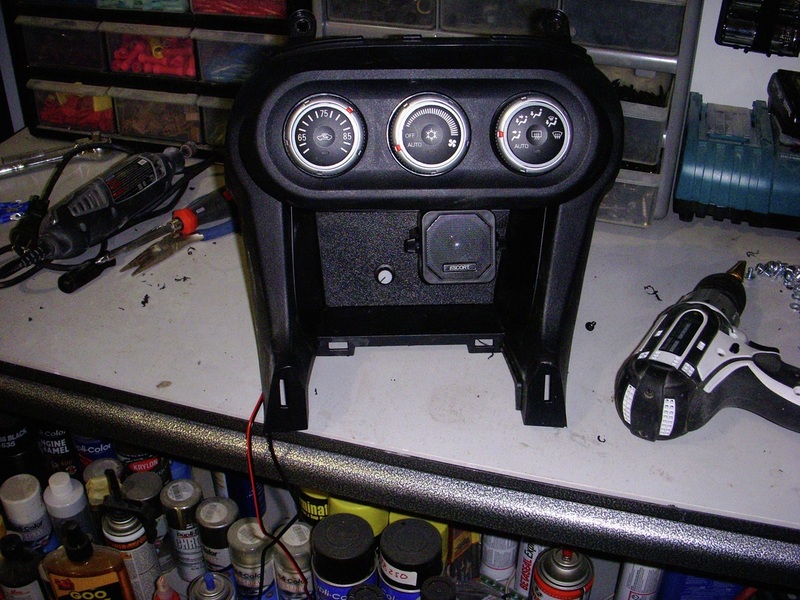 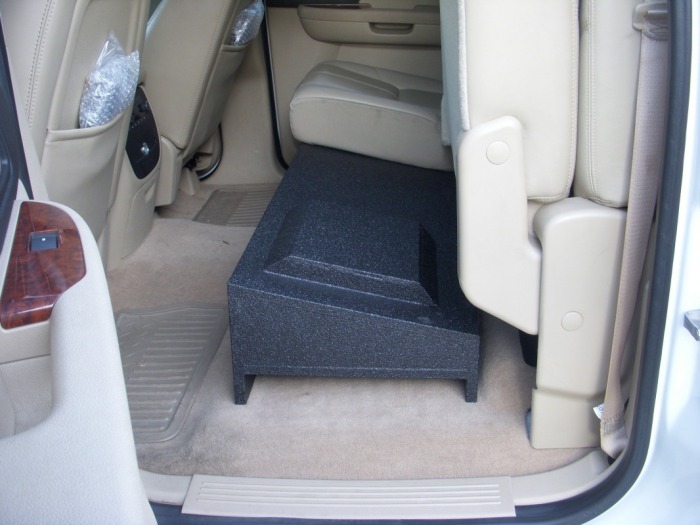 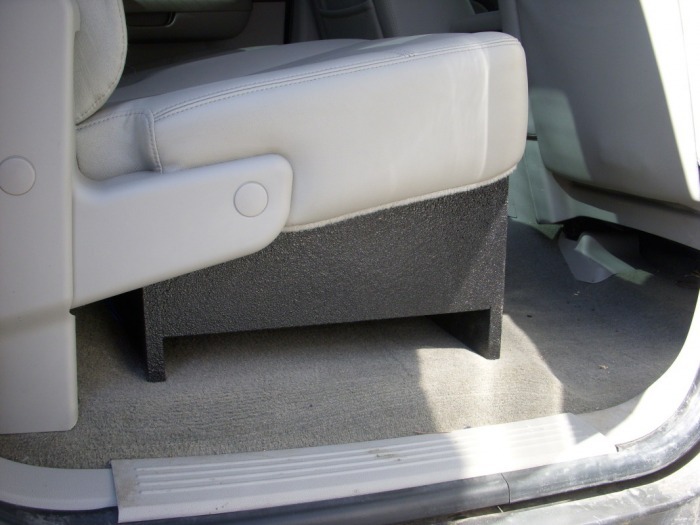 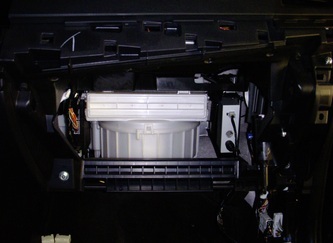 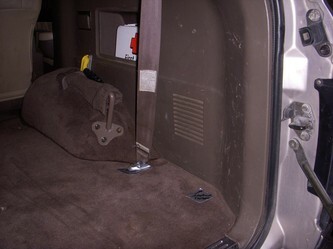 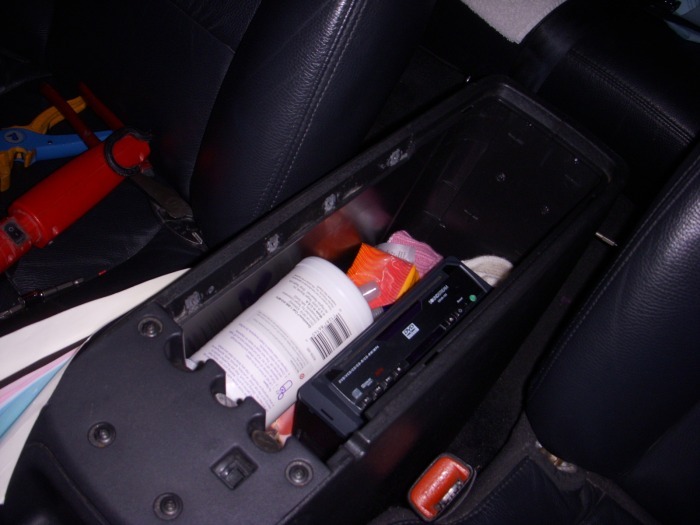 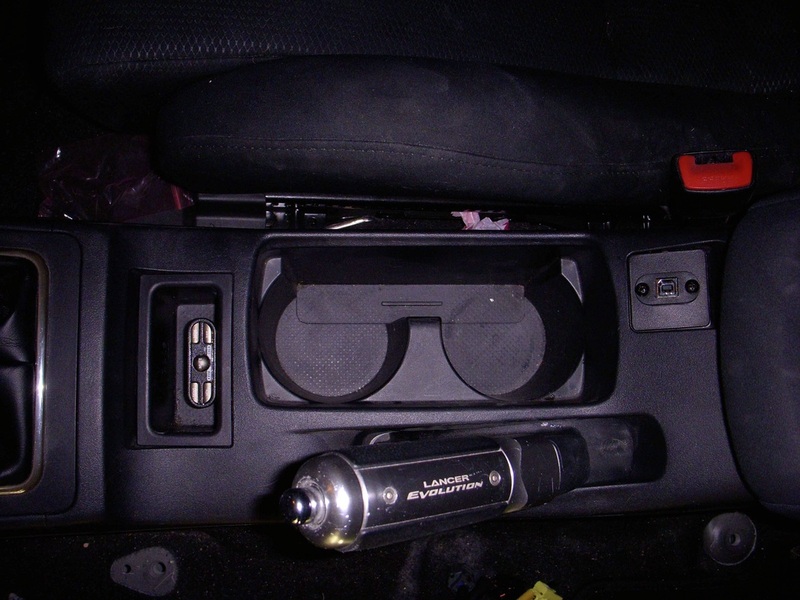 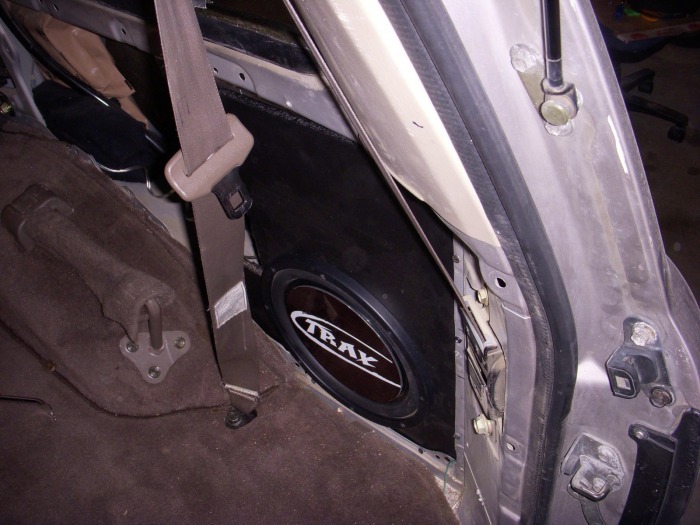 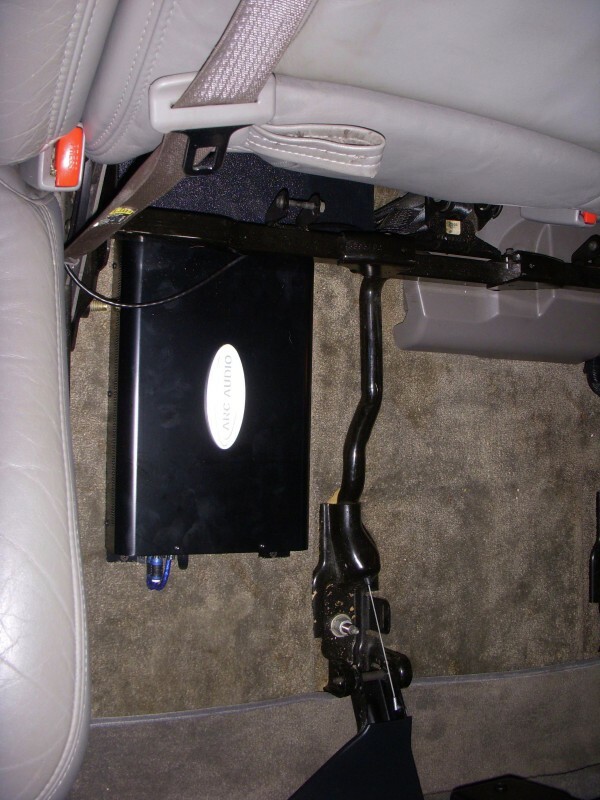 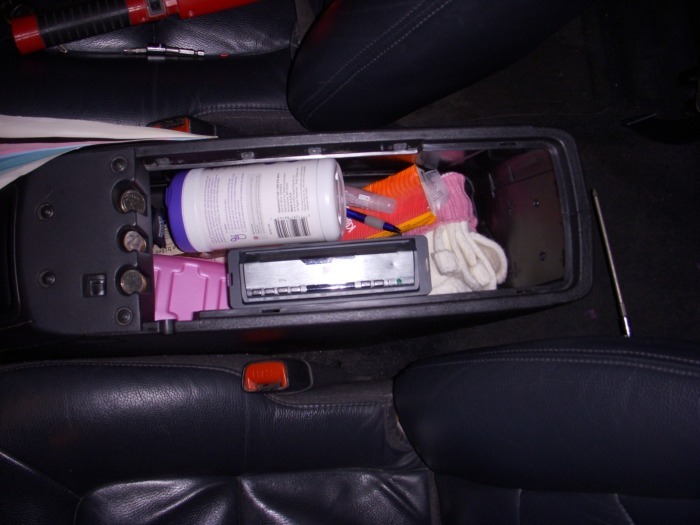 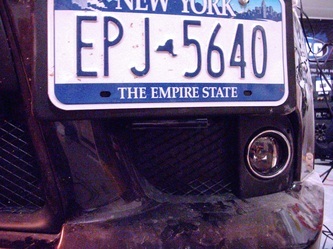 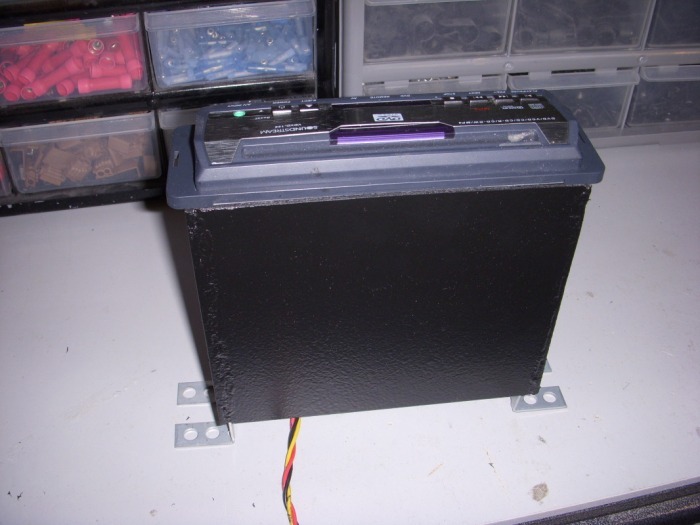 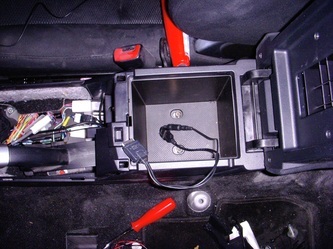 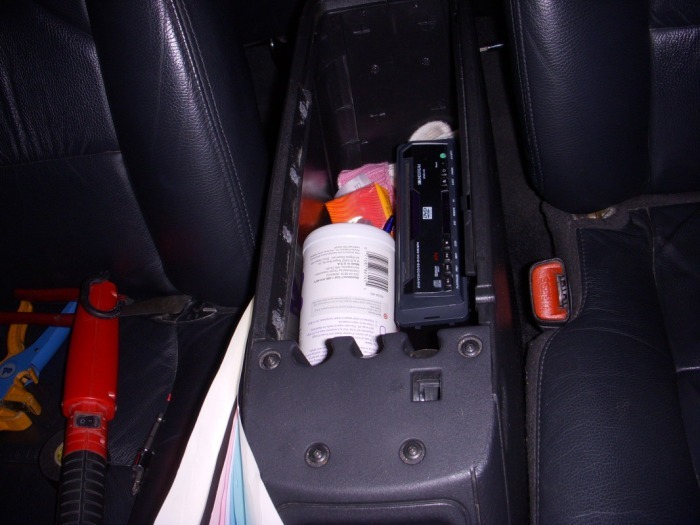 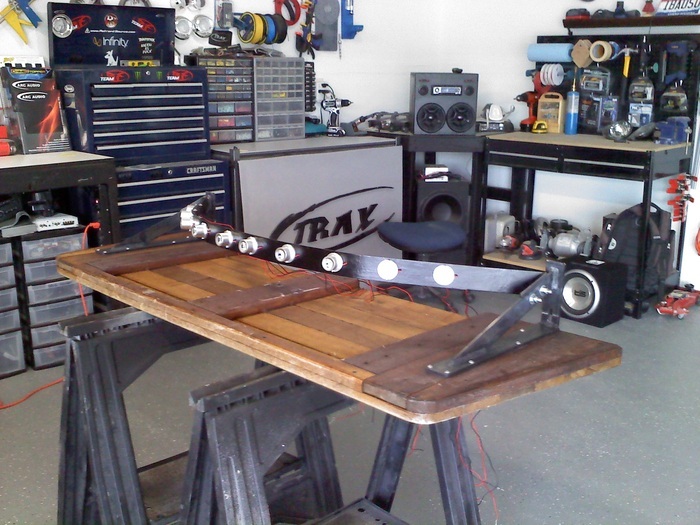 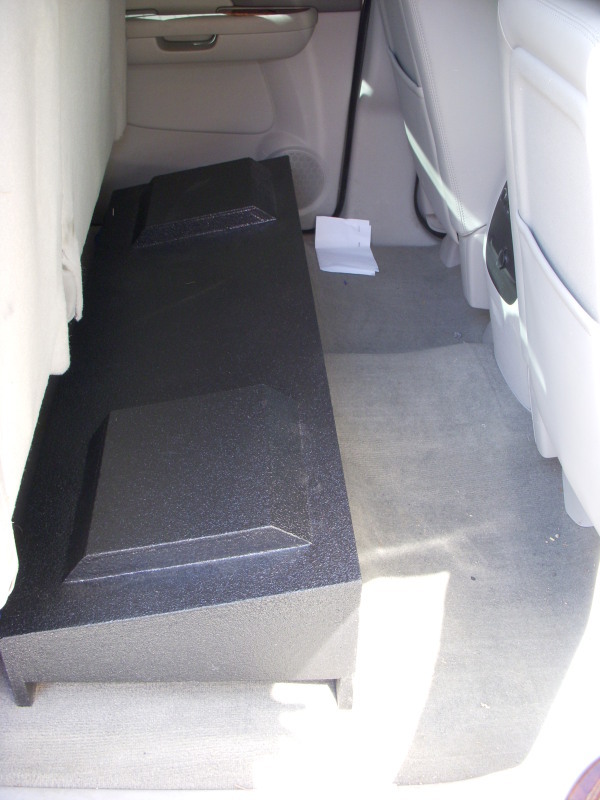 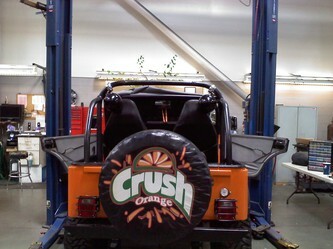 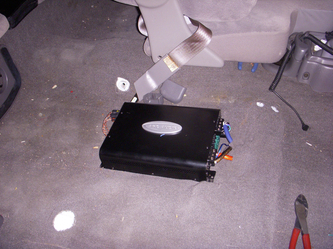 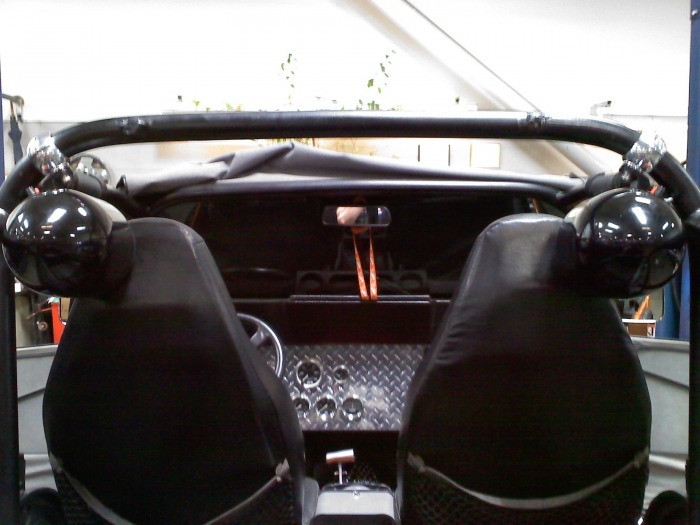 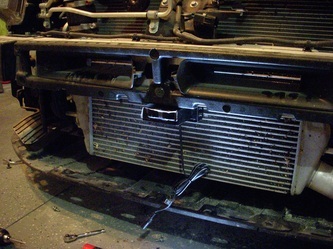 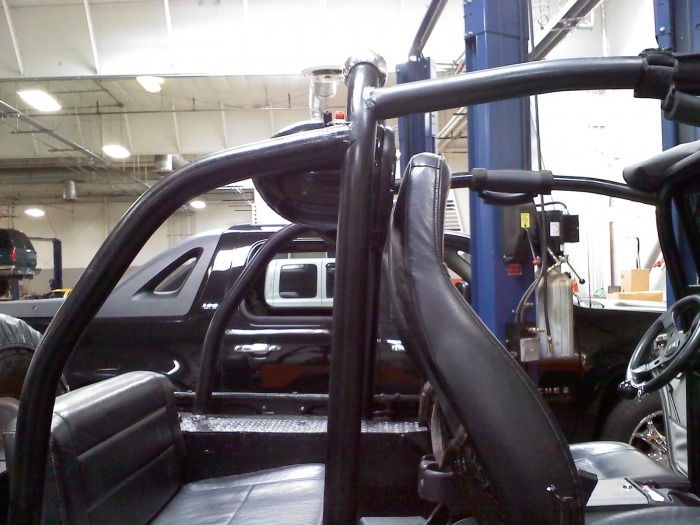 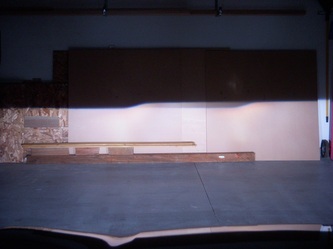 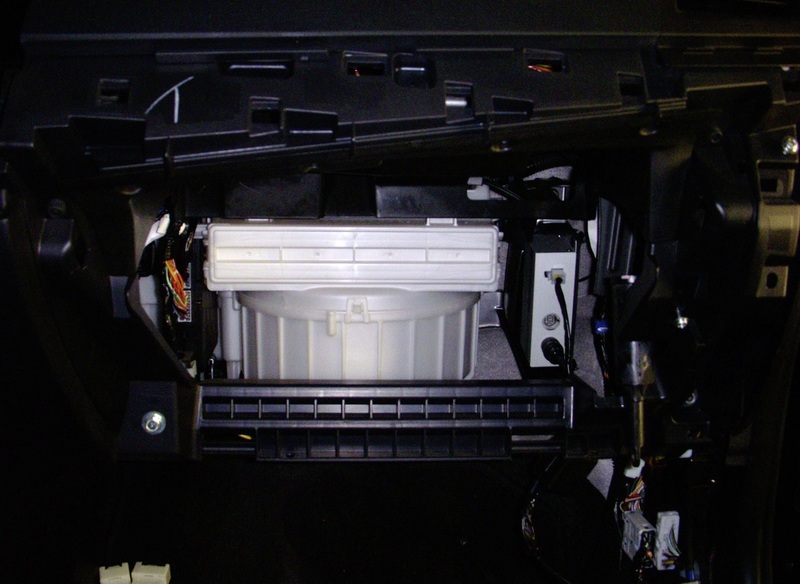 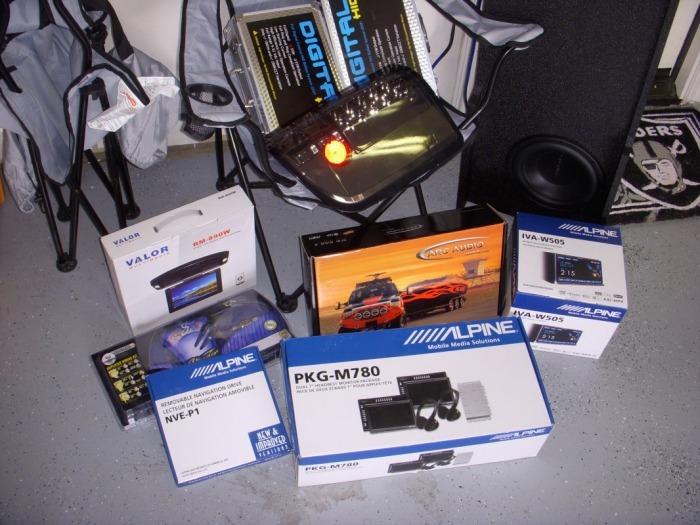 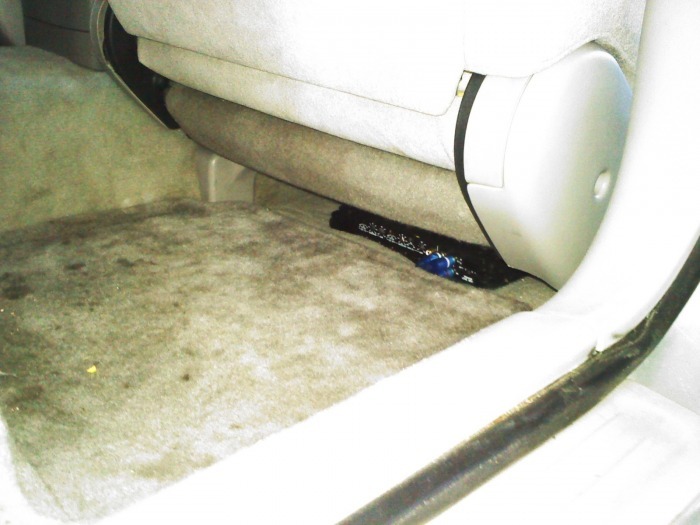 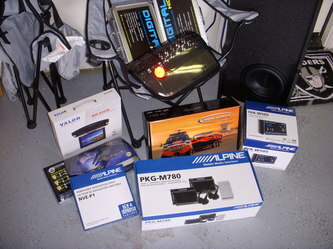 Both amps are on a custom amp rack, with removable walls for easy access to the battery and windshield wiper fluid. Had to get a video monitor up, DVD player installed in a 'stock looking' location and make it all happen before the families Christmas trip. 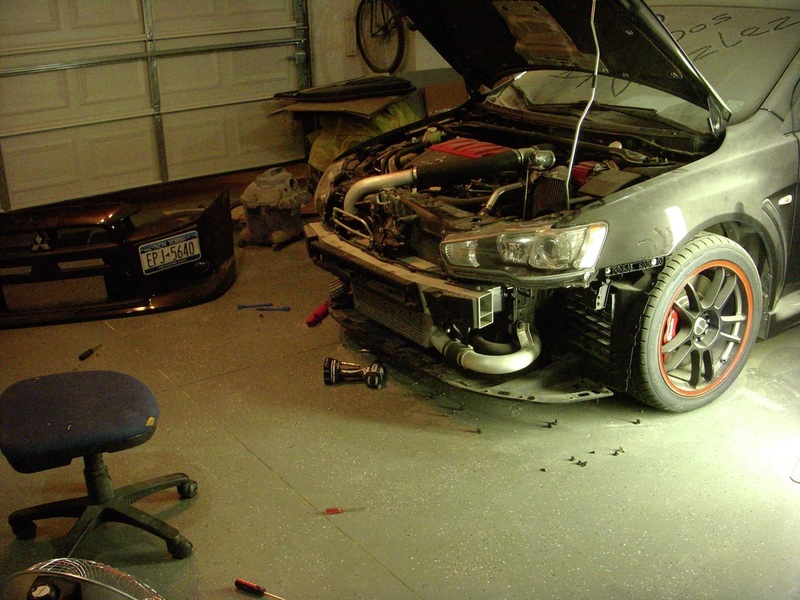 Customer had wrecked his Solsti, and was out of the game for a month...what better to do when the car is in the shop getting fixed? Send them to us for a retrofit and a custom RadioActive halo setup!! 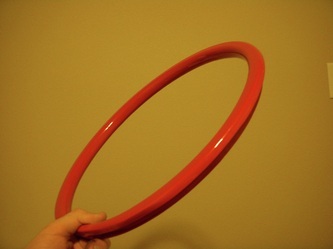 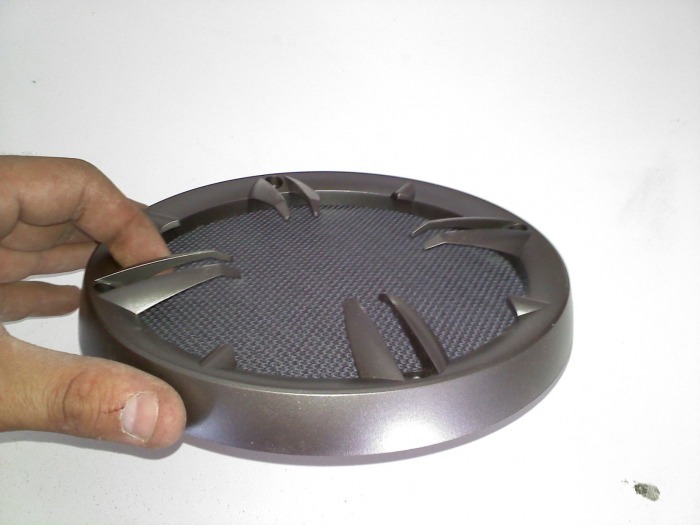 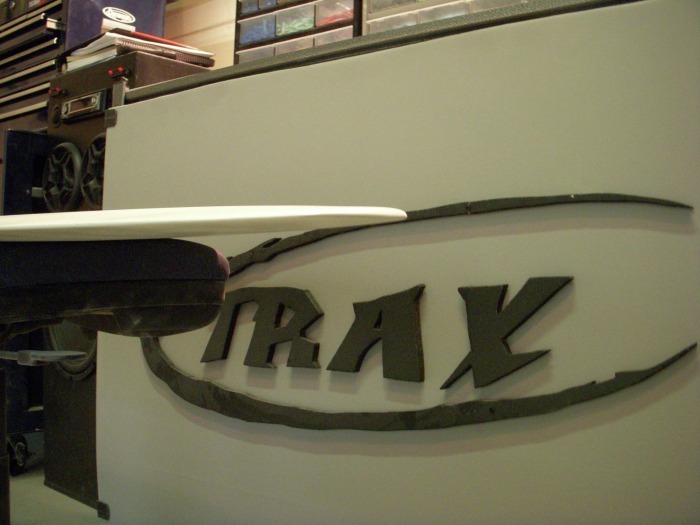 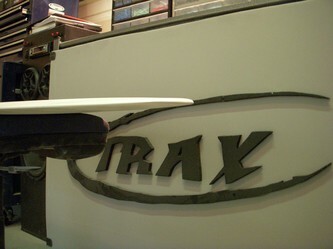 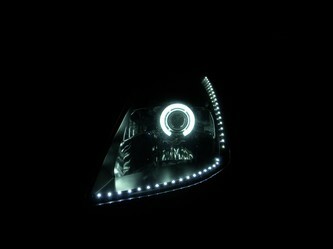 We did 80mm and 125mm Halos on this one to create the RadioActive Symbol Effect! 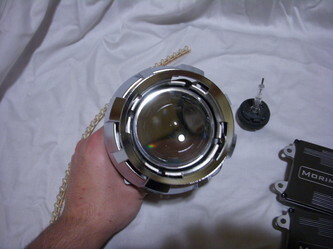 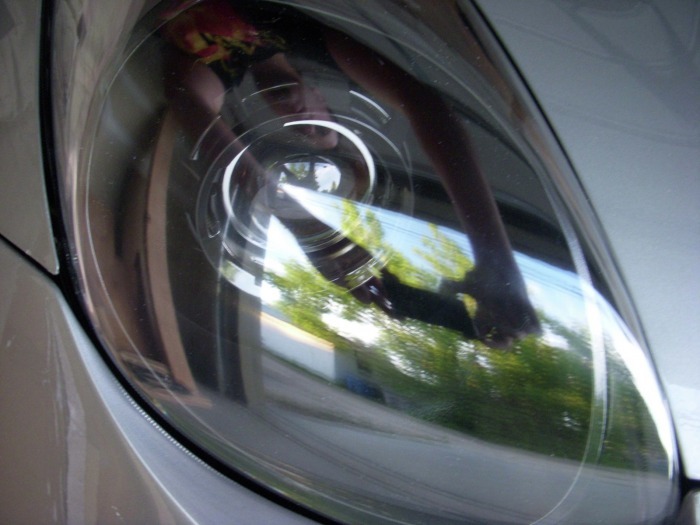 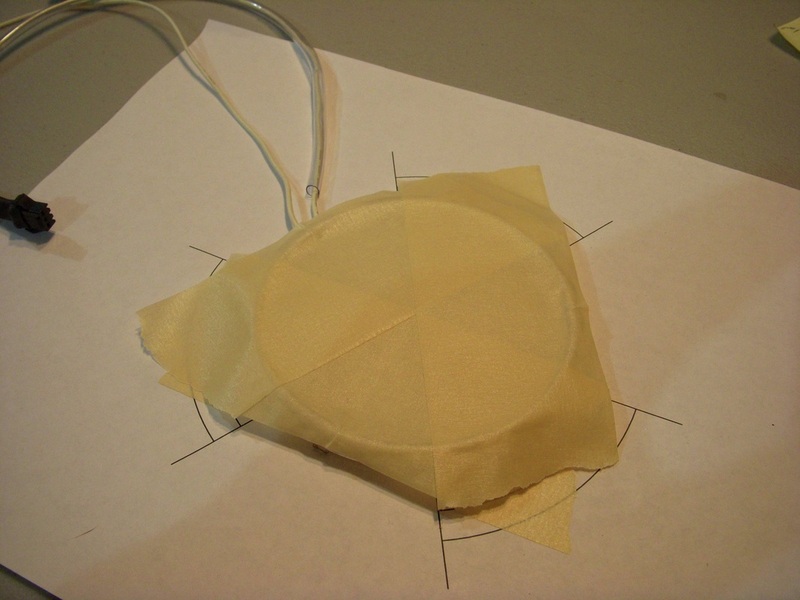 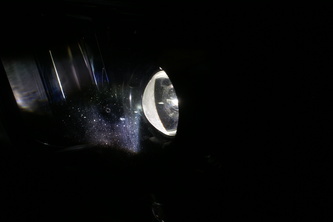 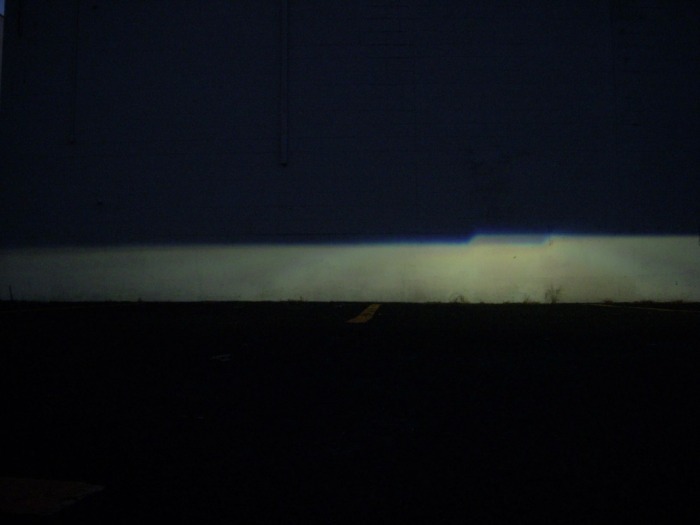 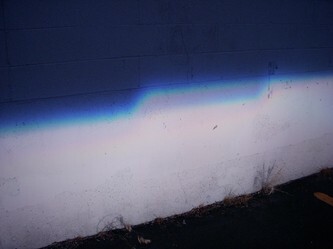 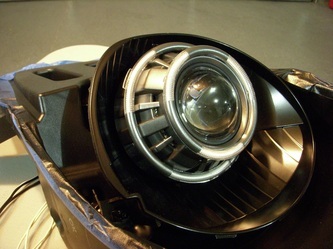 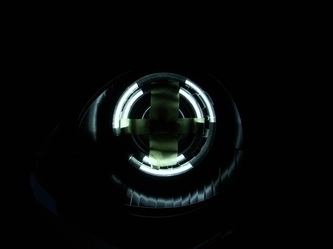 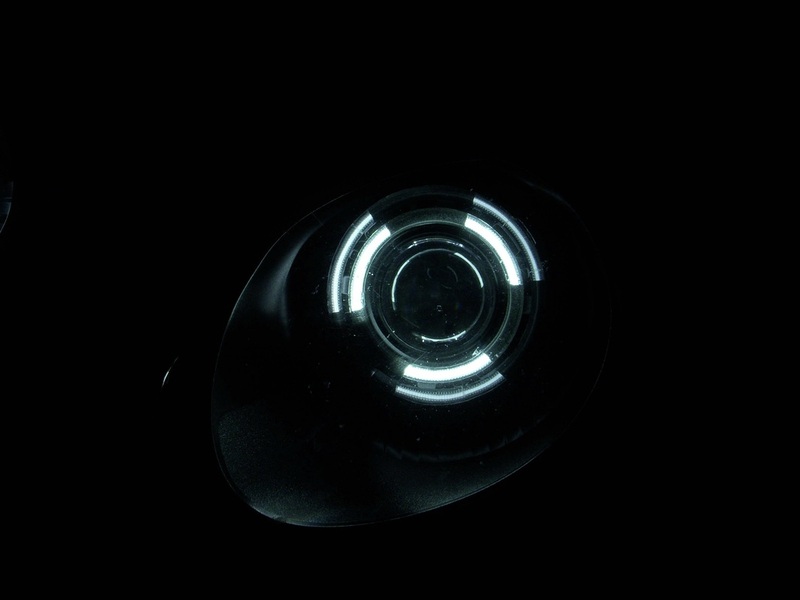 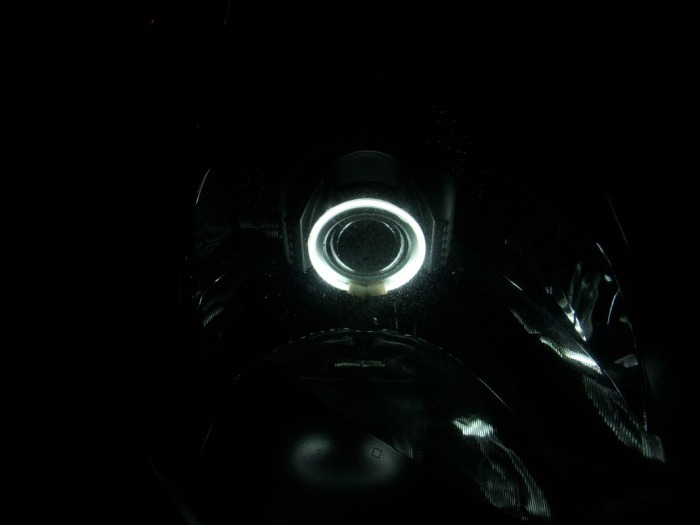 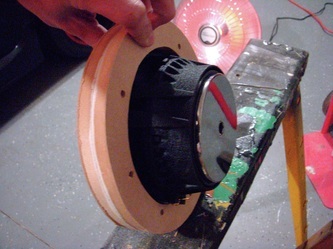 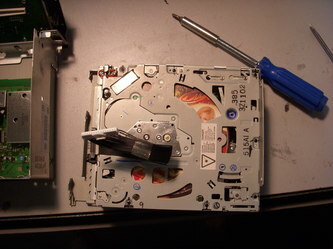 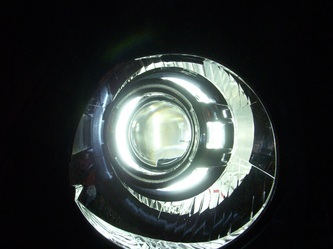 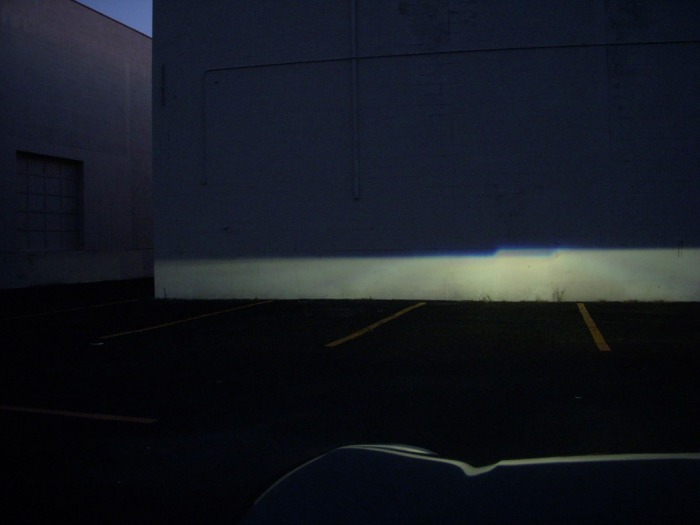 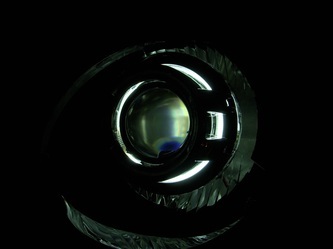 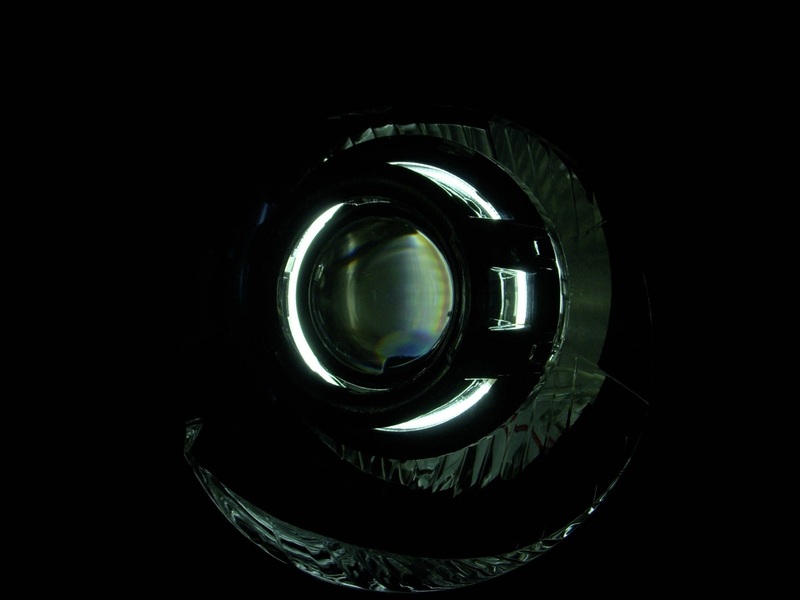 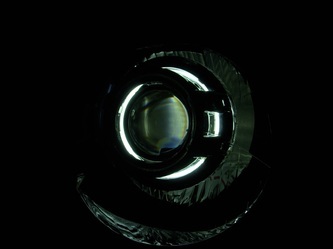 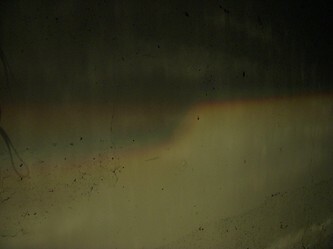 4 Hyper Bright White LEDs are installed inside each projector to light up the Lens as well. 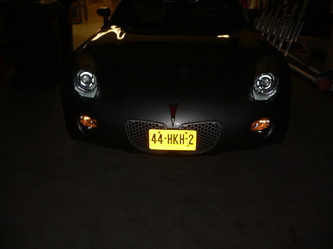 Everything's black except the Brand New Gatlin Gun shroud and the halos, which are painted to match clients Sly body color. 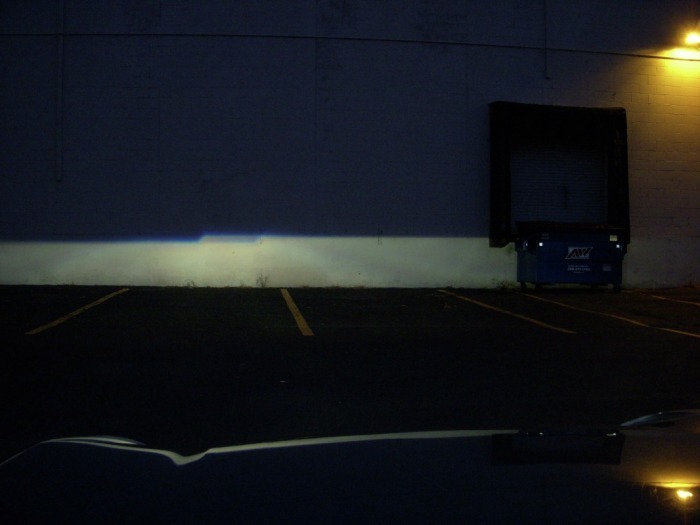 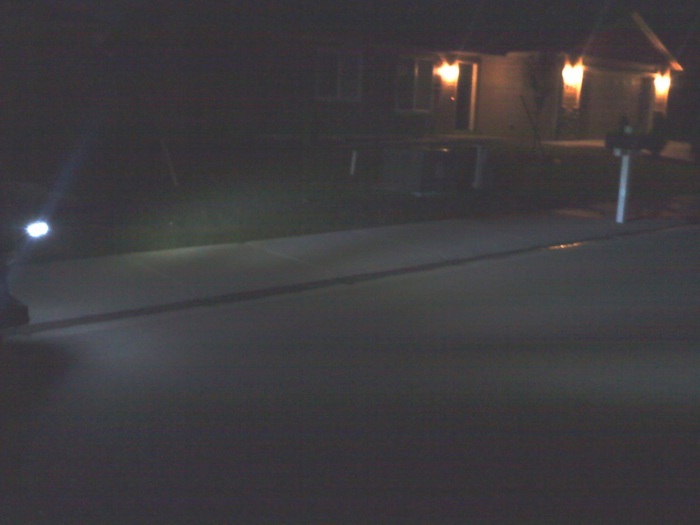 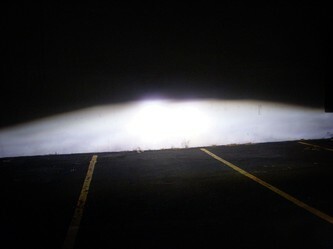 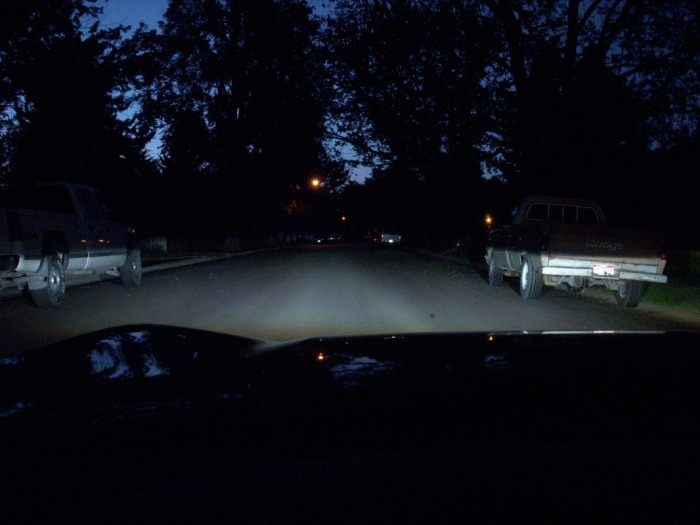 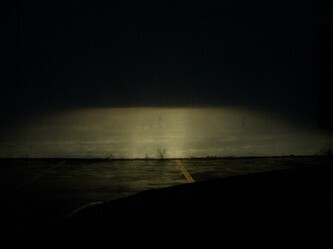 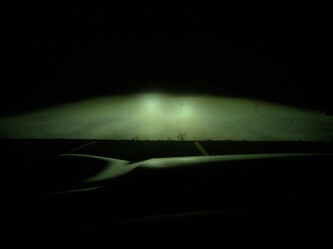 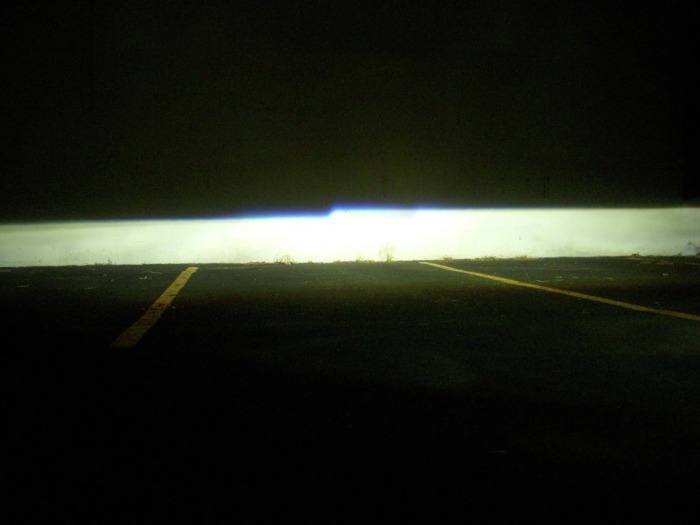 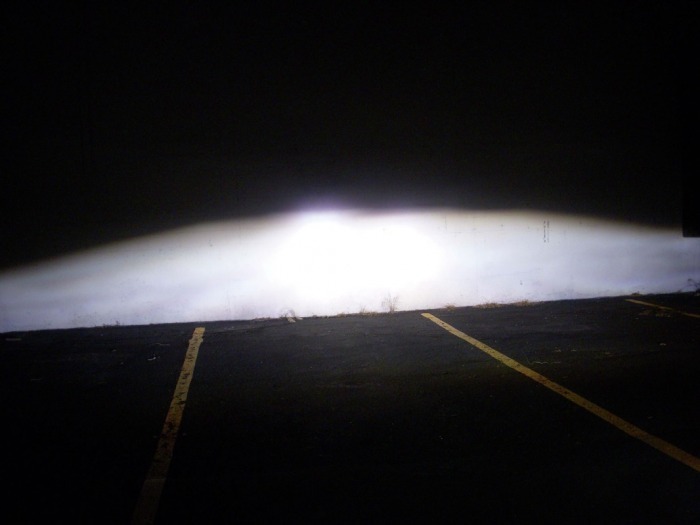 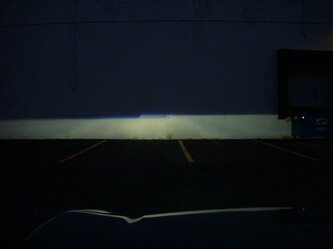 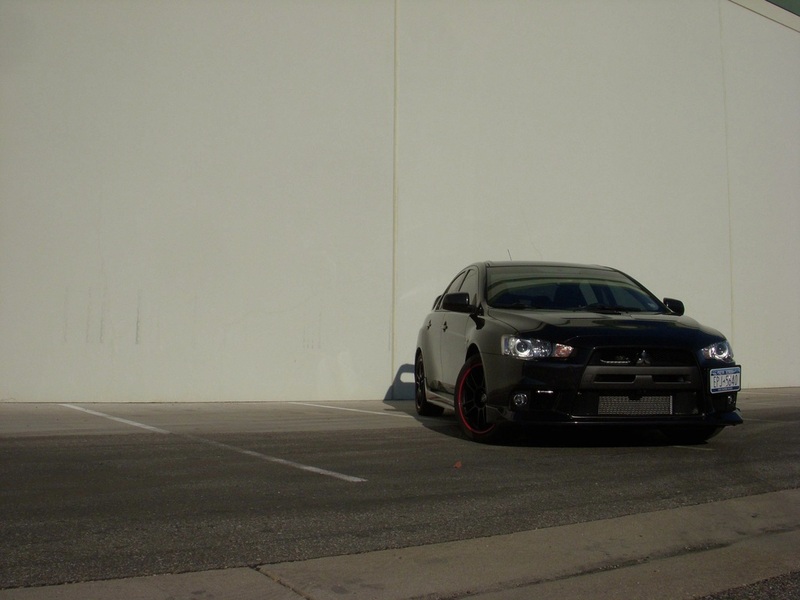 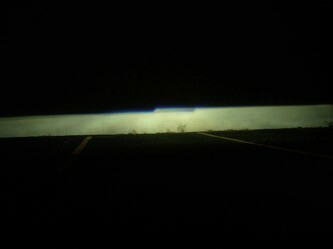 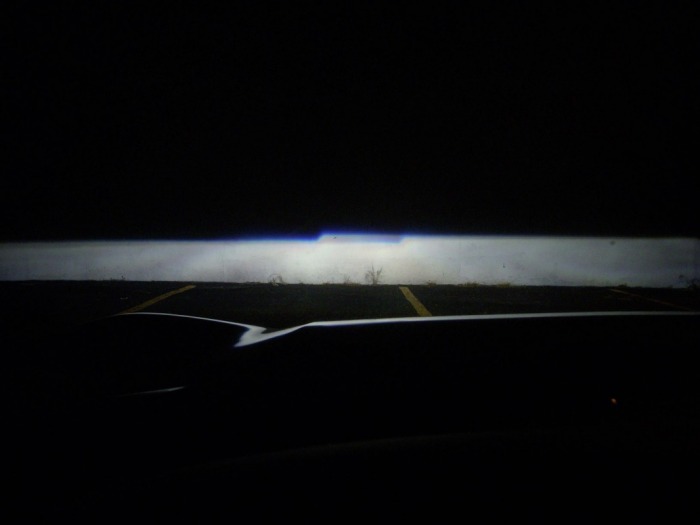 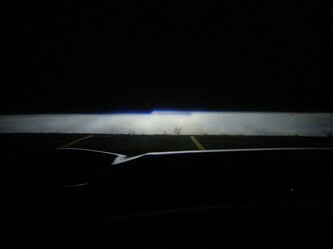 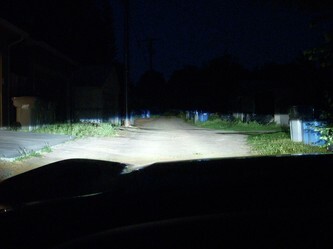 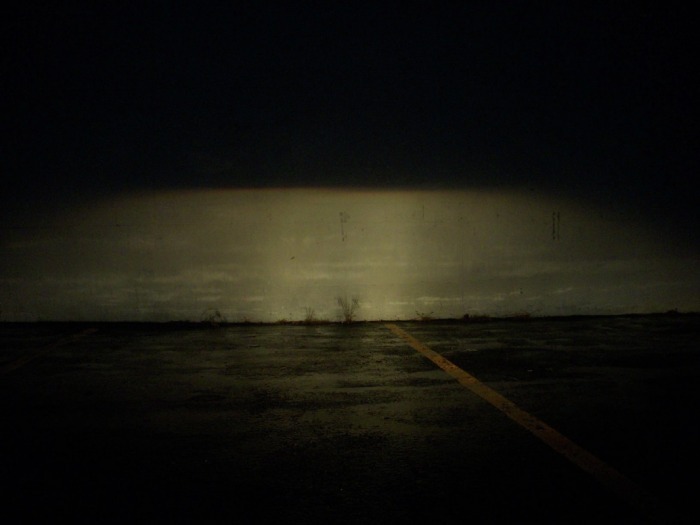 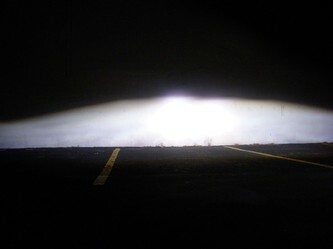 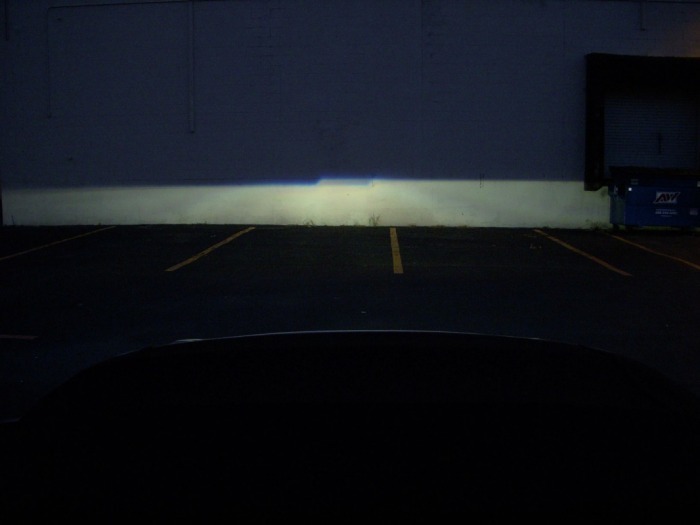 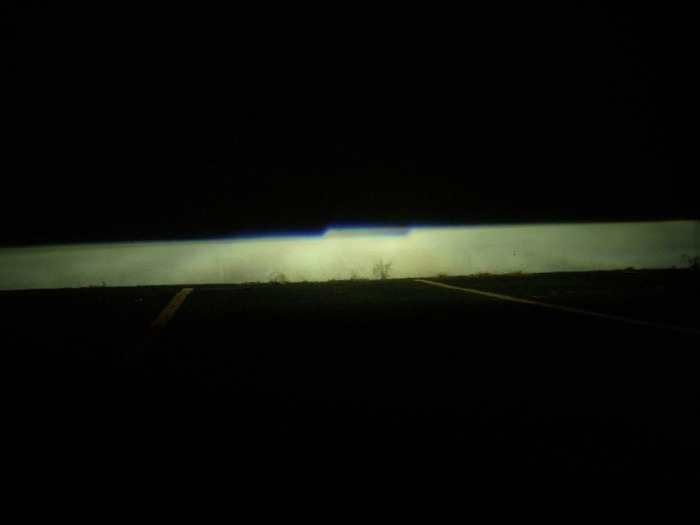 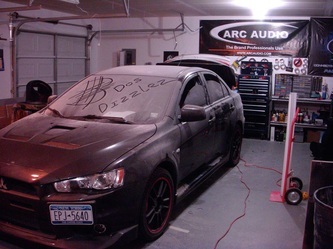 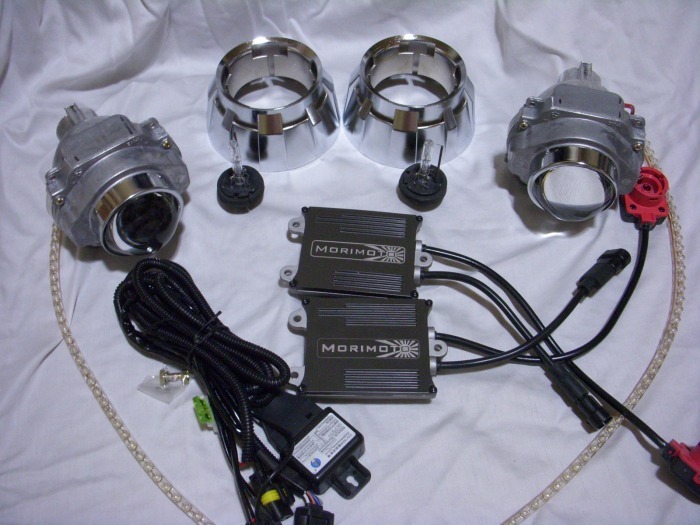 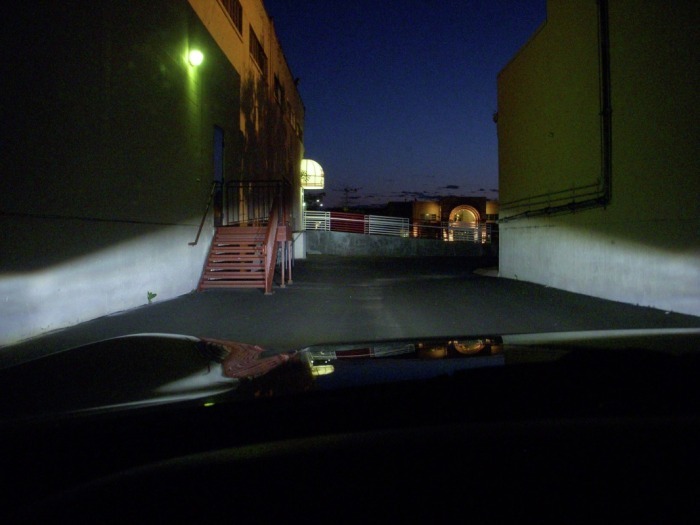 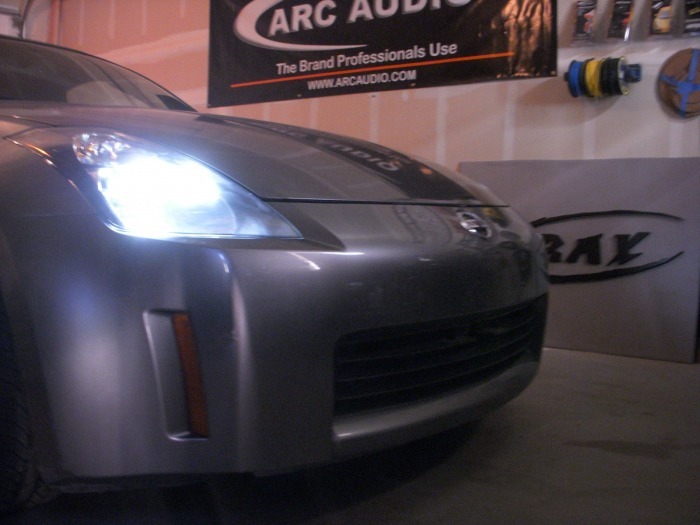 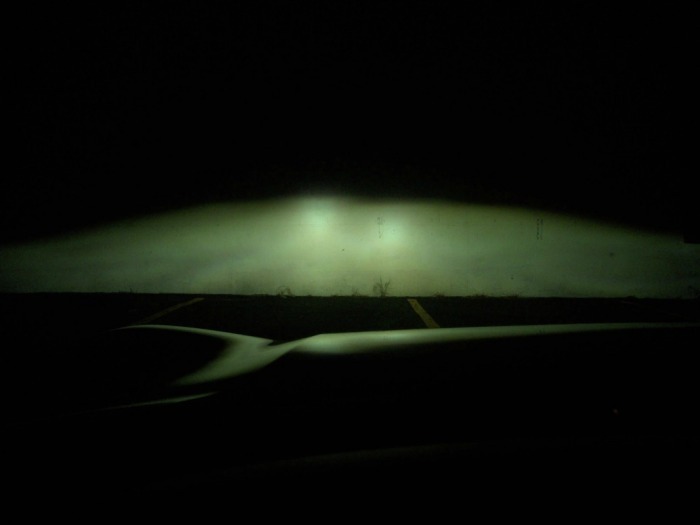 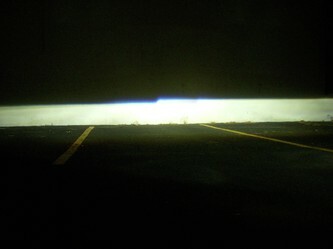 Bi-Xenon Projectors with 6000k DS2 HID bulbs running off of Morimoto Ballasts. 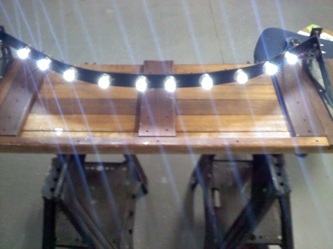 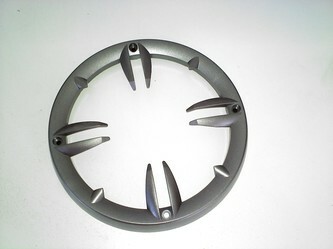 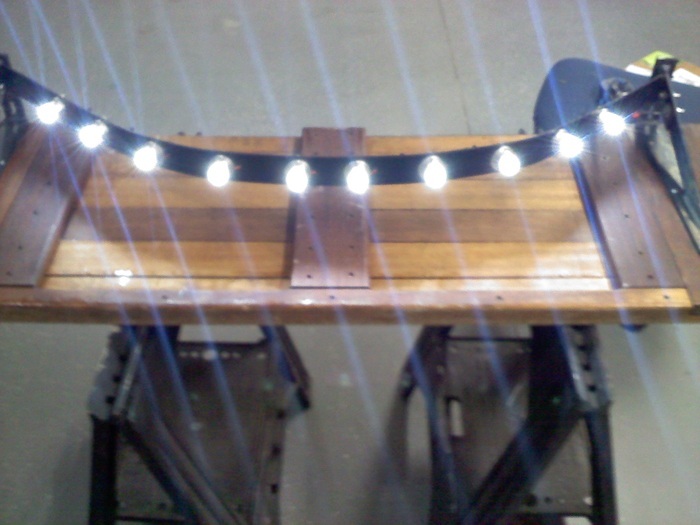 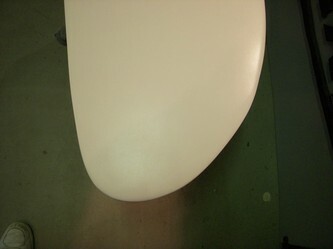 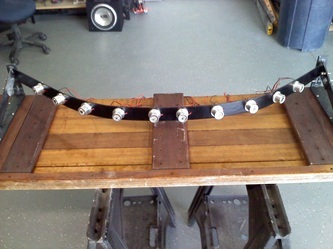 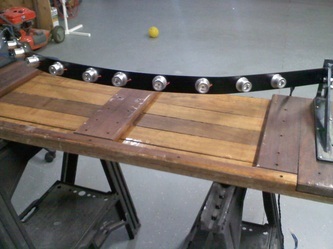 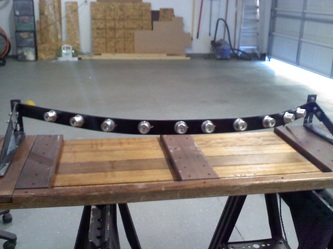 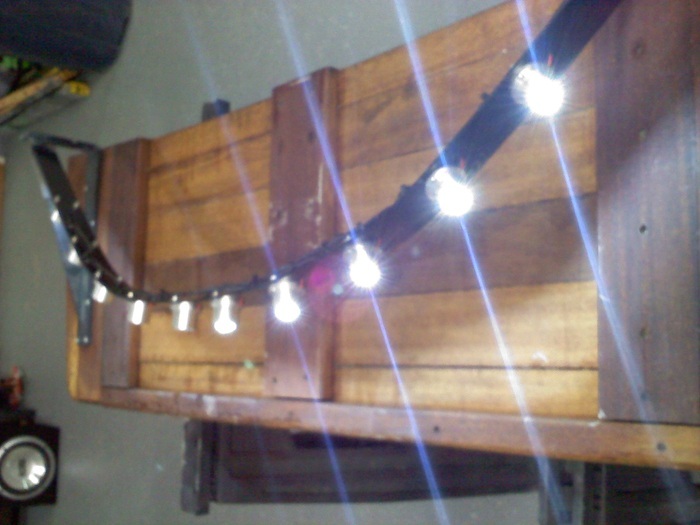 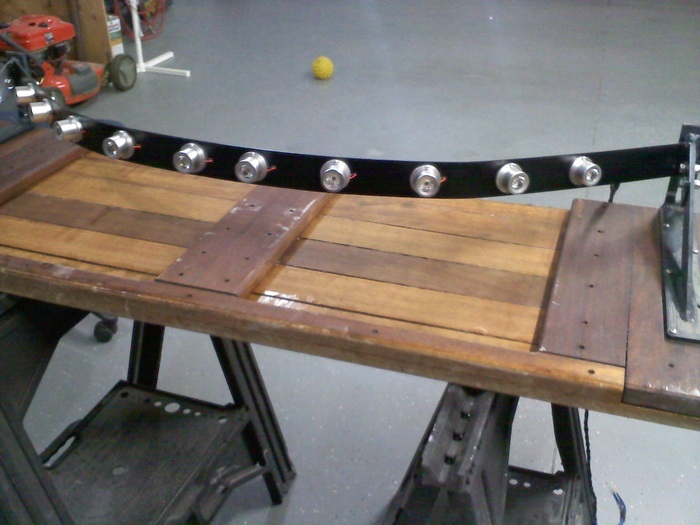 10 Super Bright high powered water proof LEDs on a custom made curved arc steel bracket. 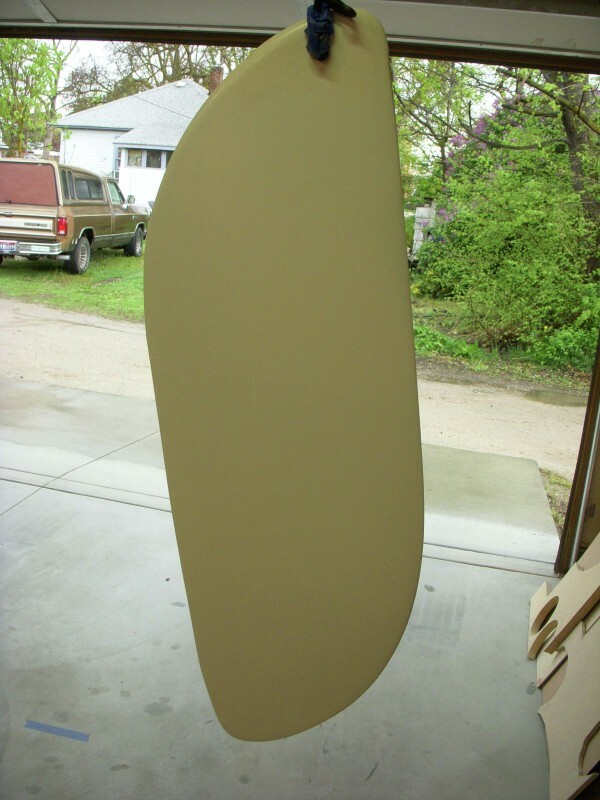 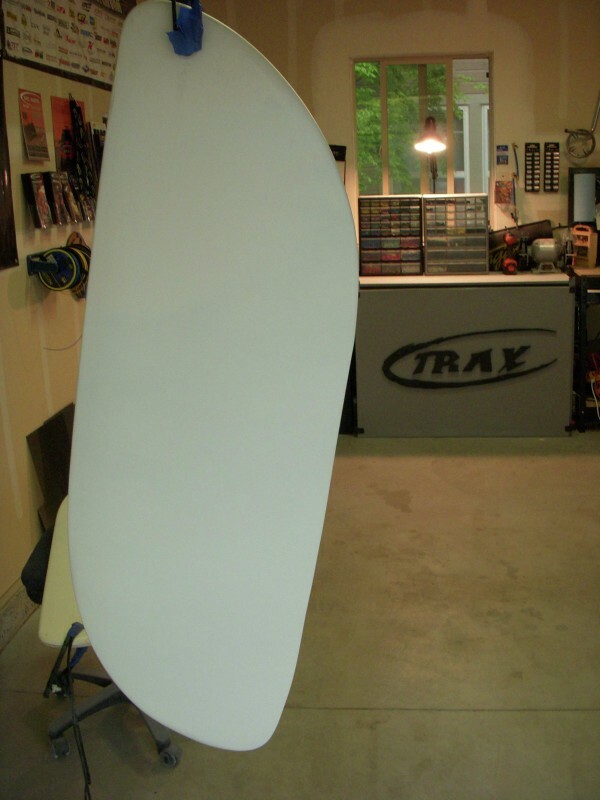 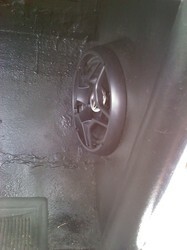 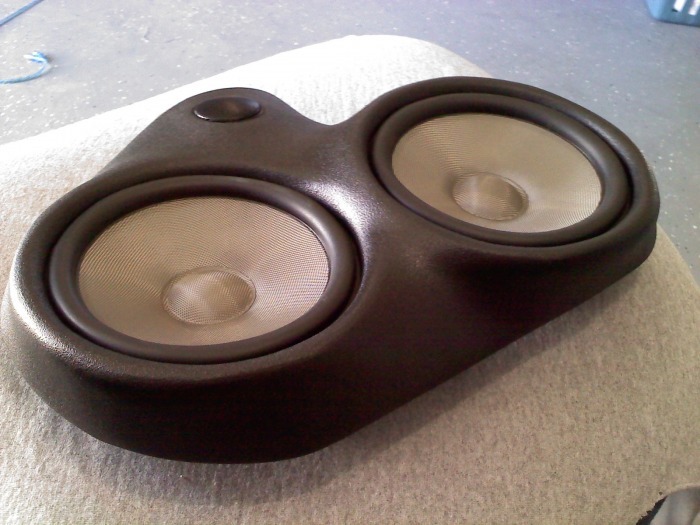 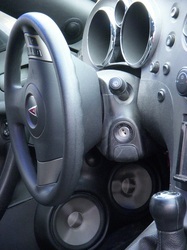 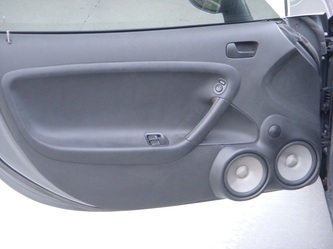 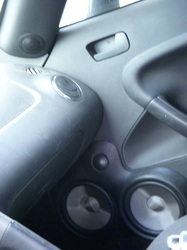 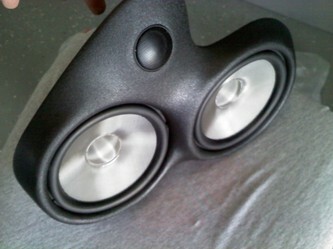 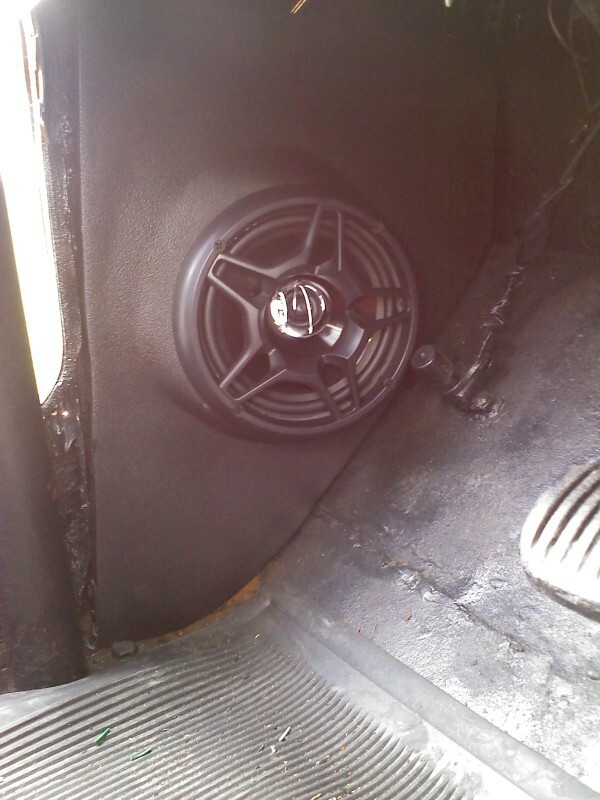 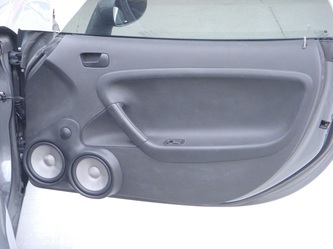 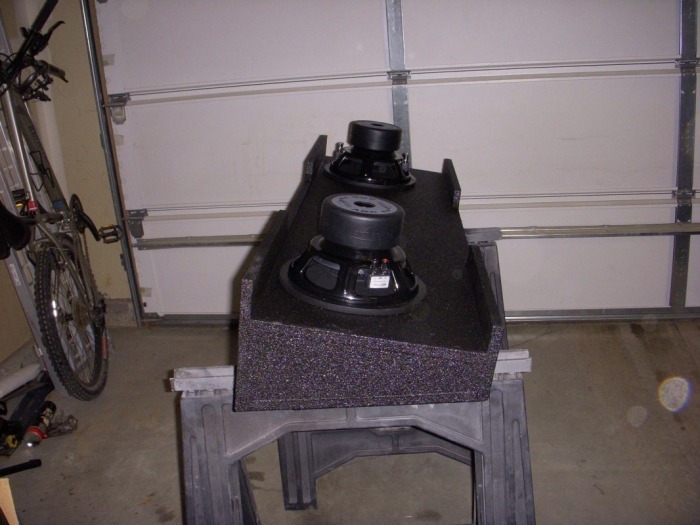 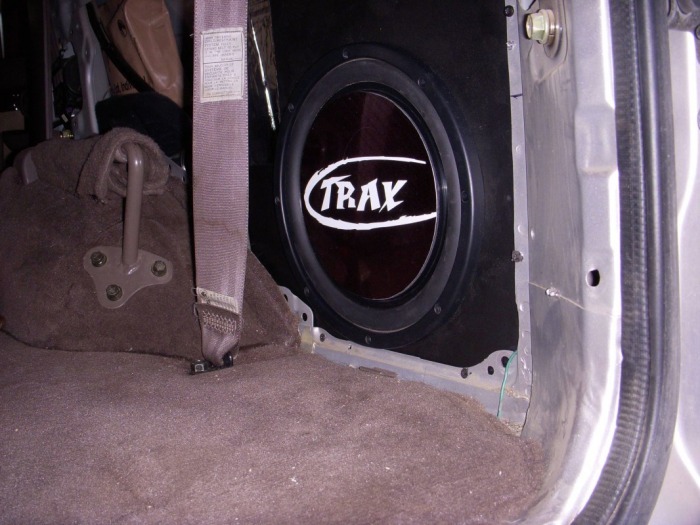 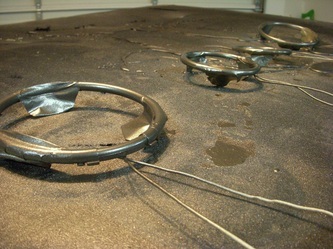 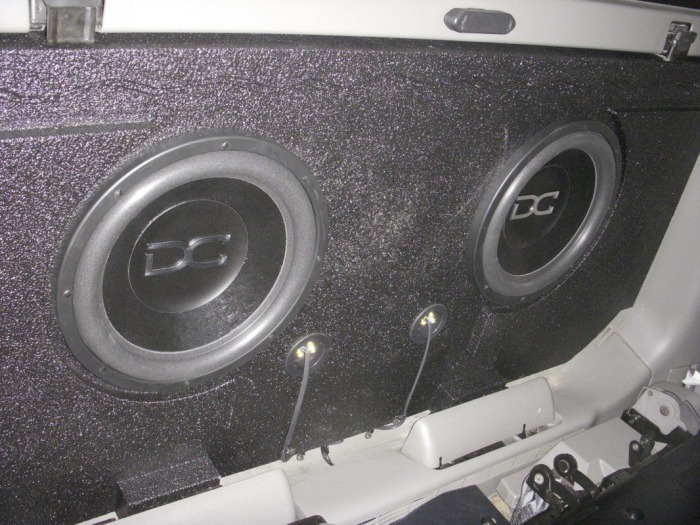 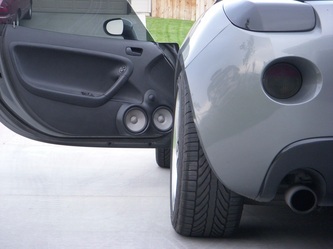 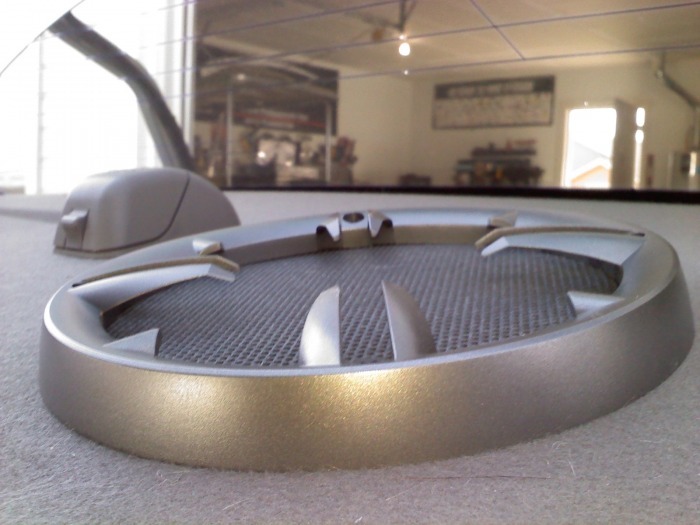 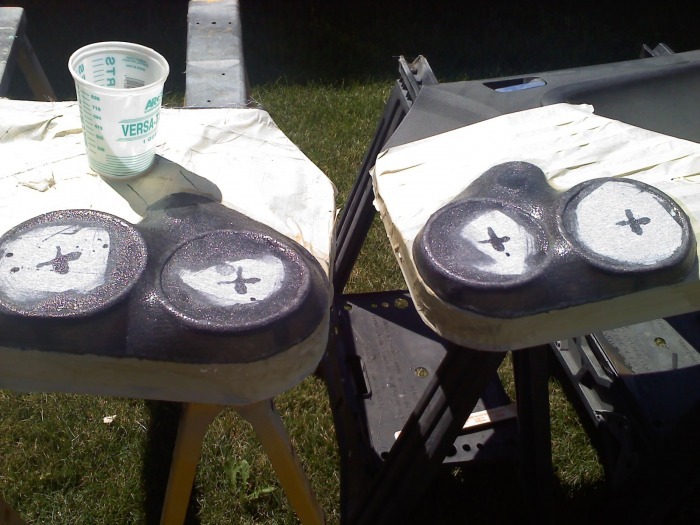 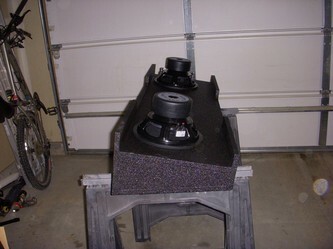 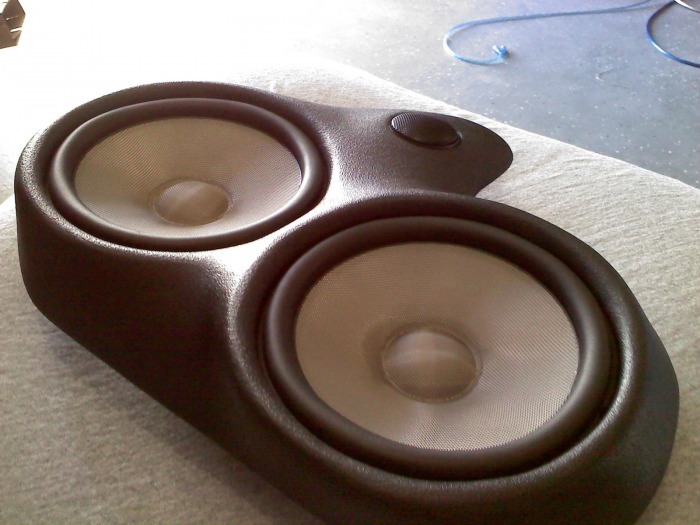 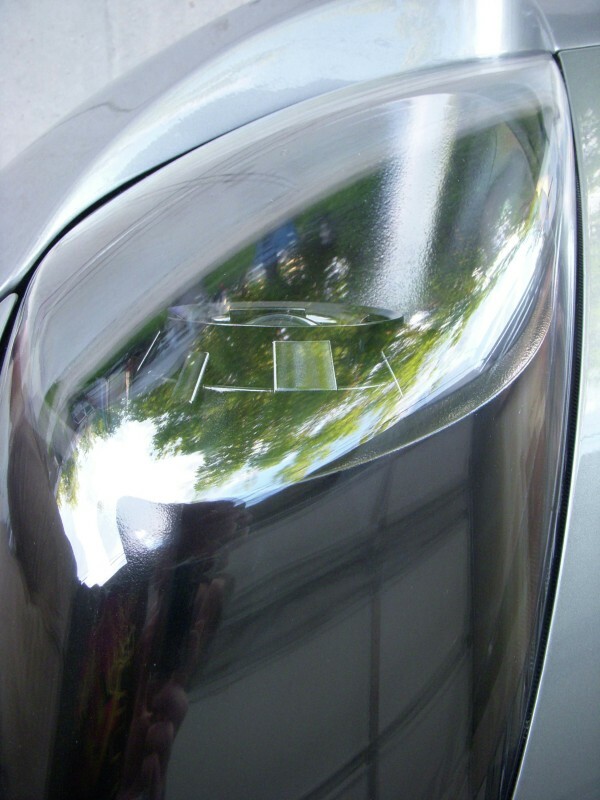 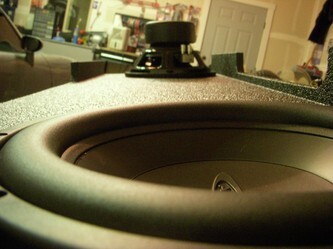 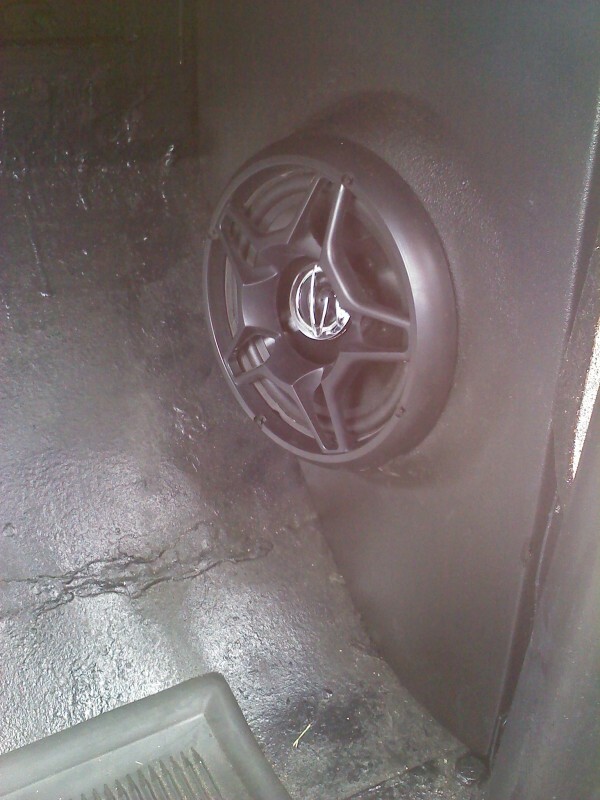 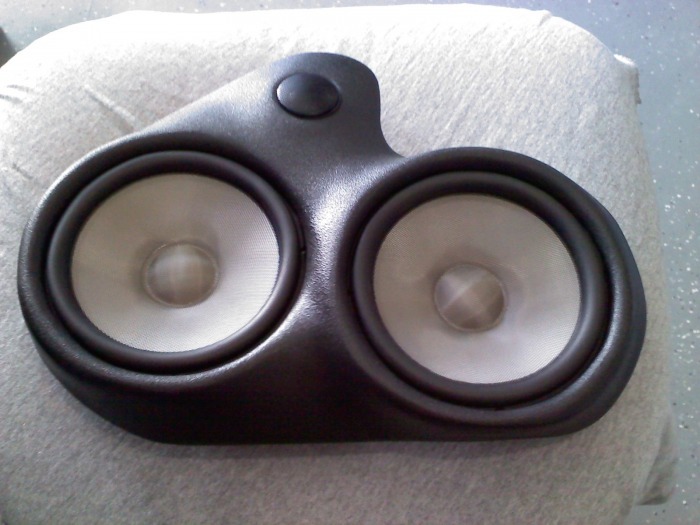 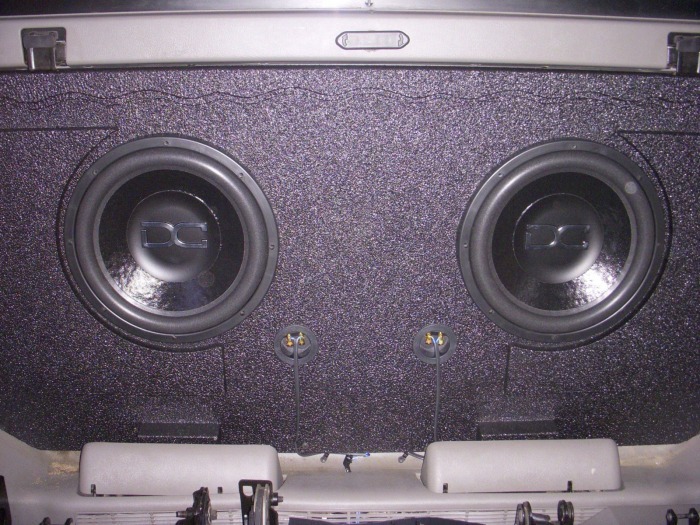 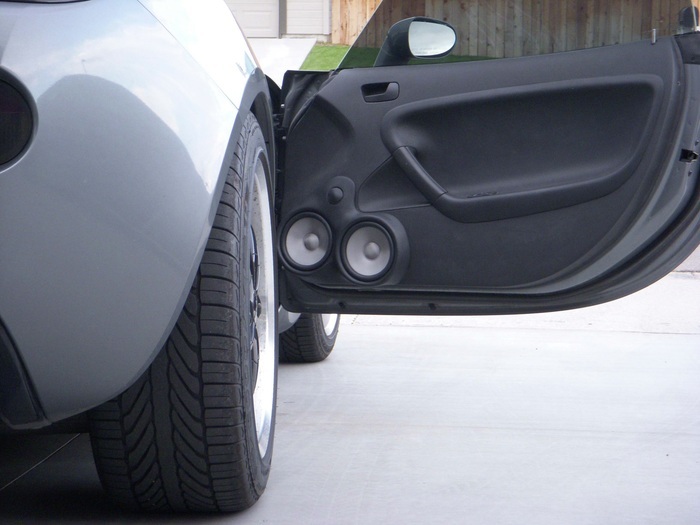 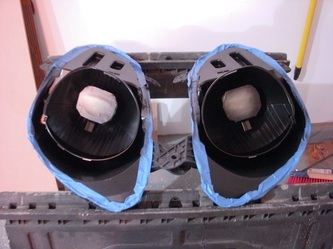 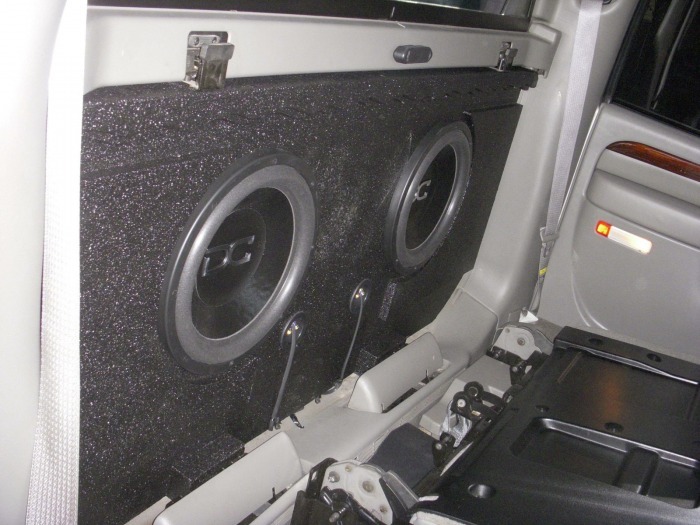 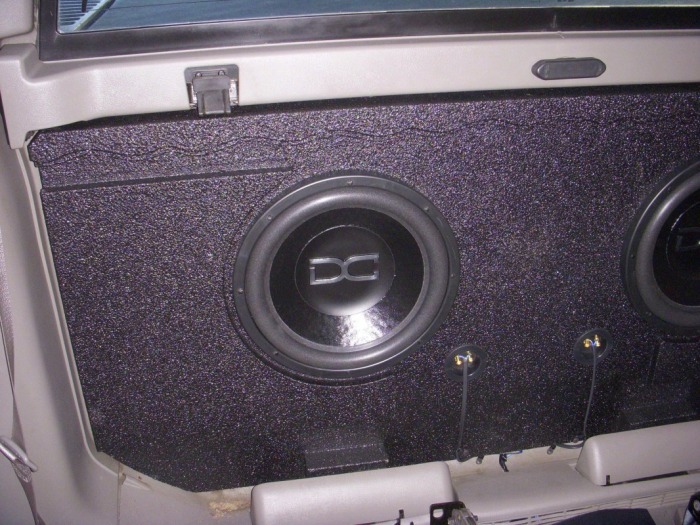 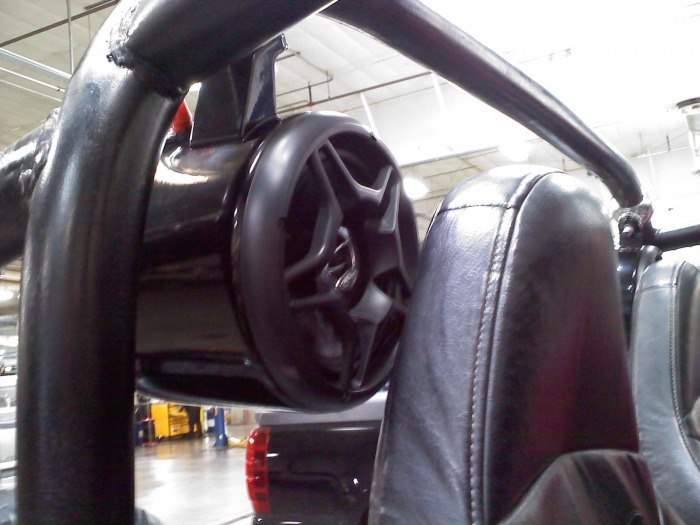 (2) sets of Infinity Kappa Component Speakers in Custom Fiberglass Door Pods. 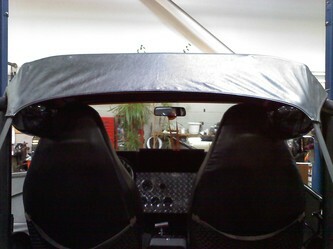 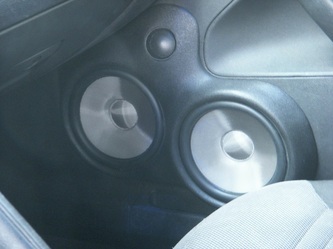 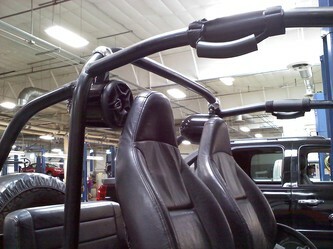 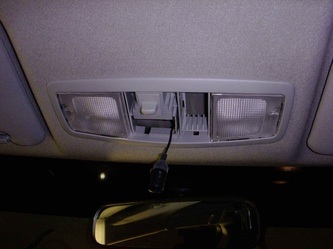 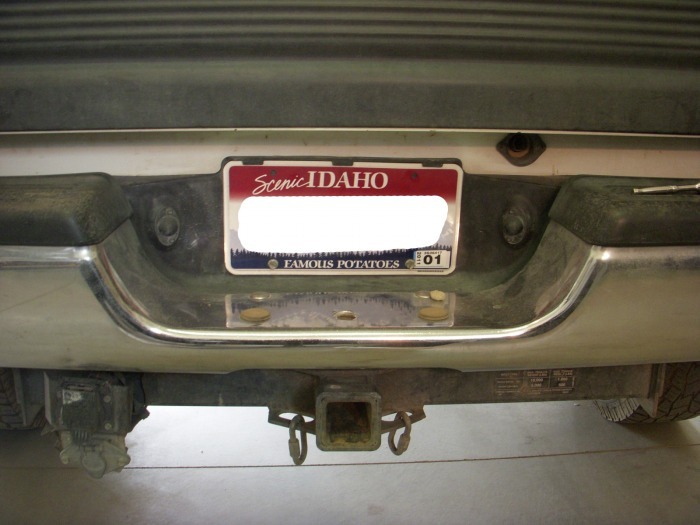 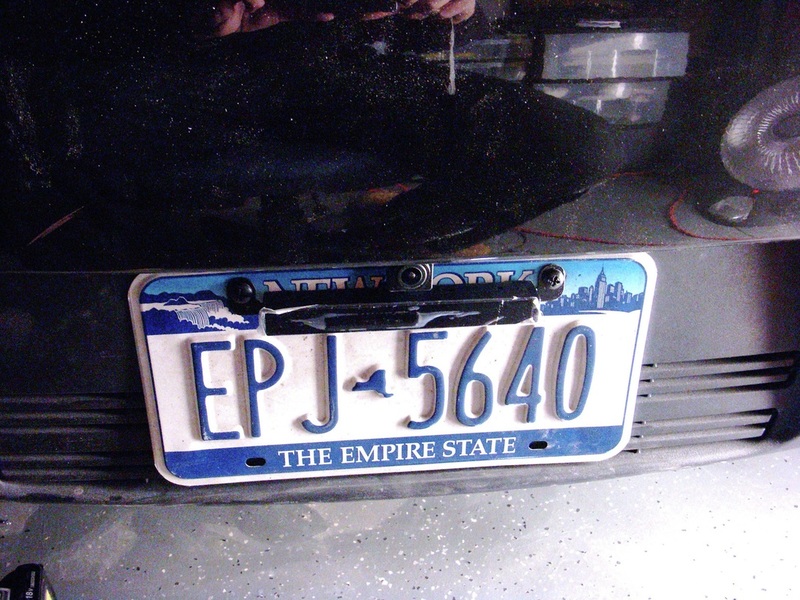 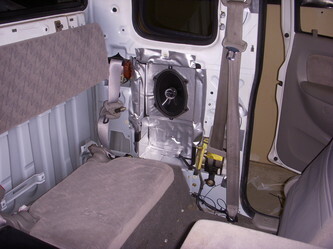 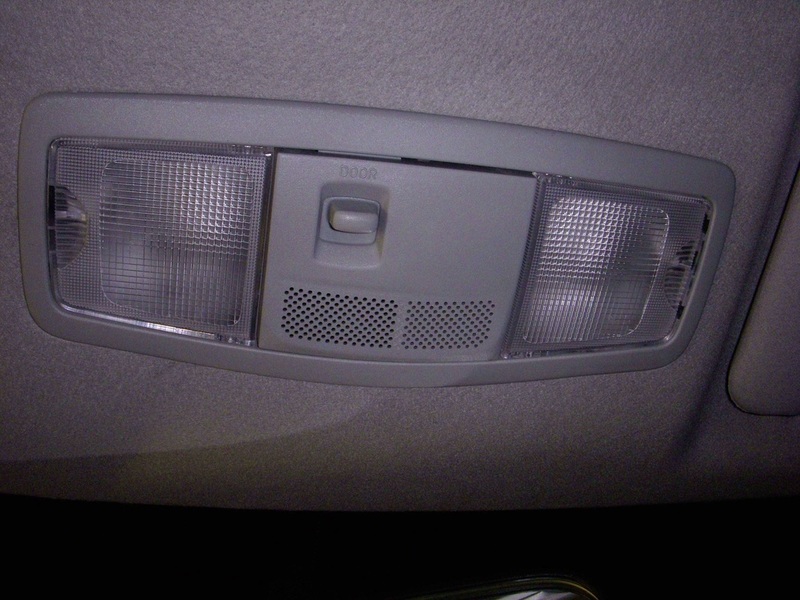 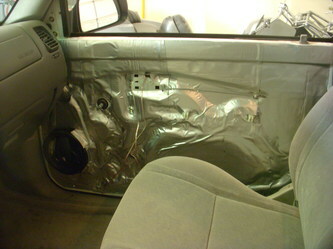 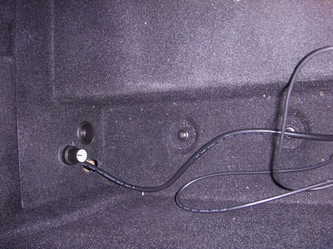 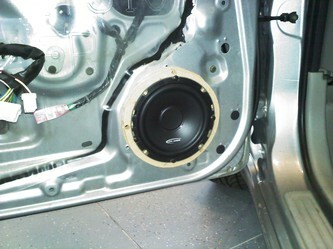 Mounted from behind to hide screws on the speakers as well as the door pods themselves. 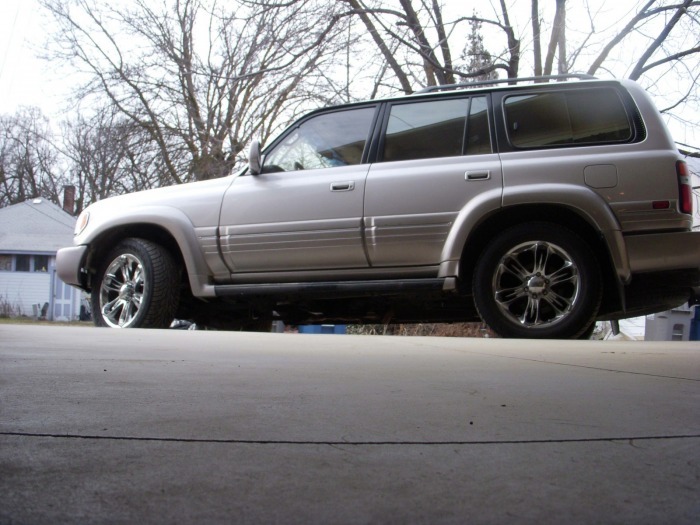 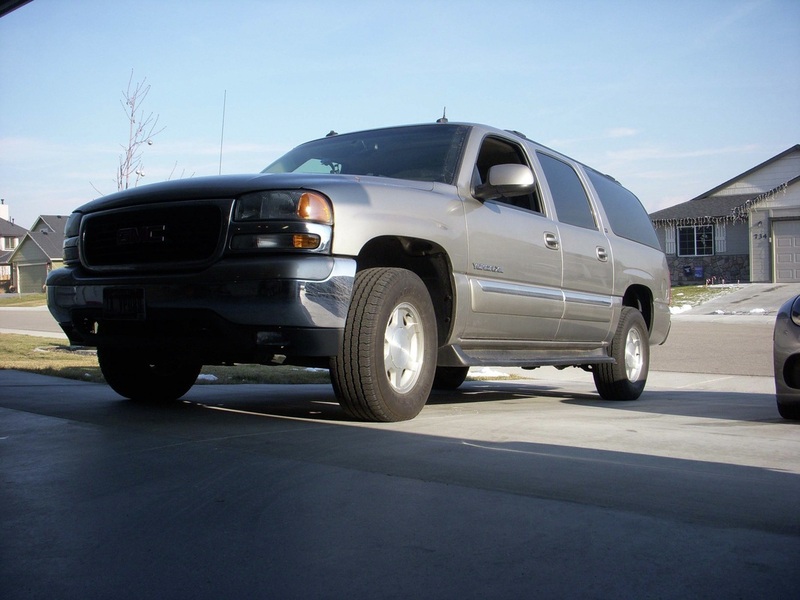 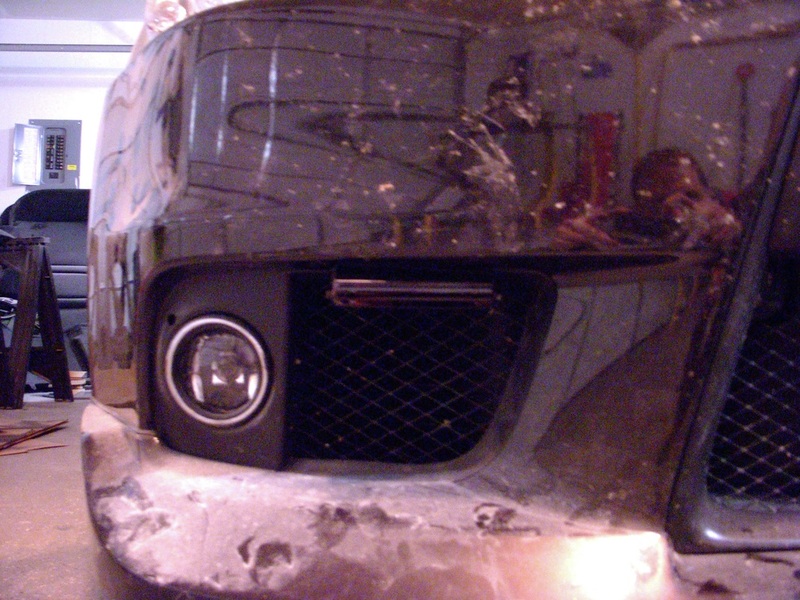 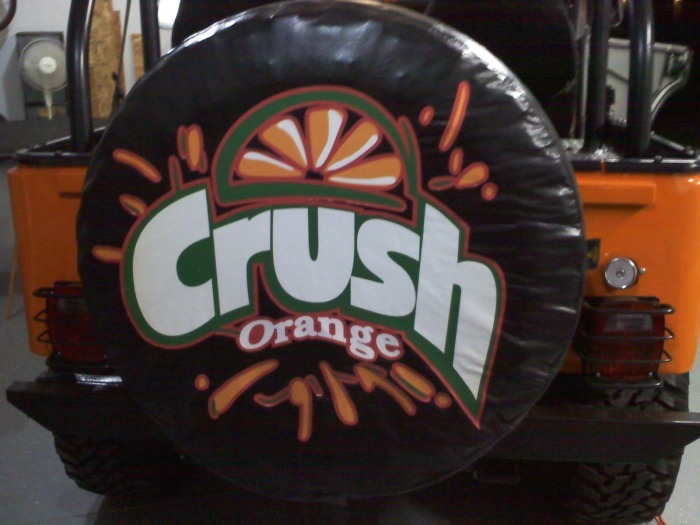 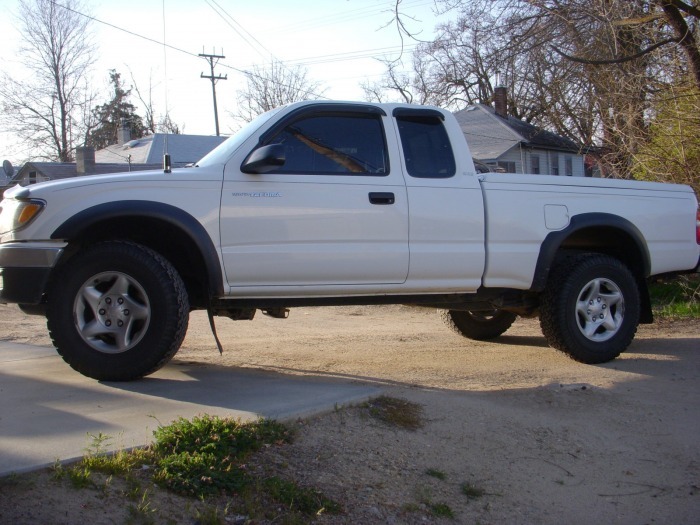 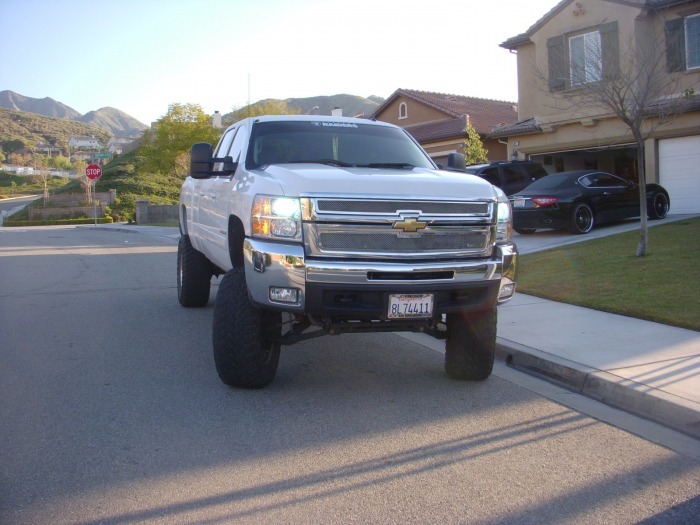 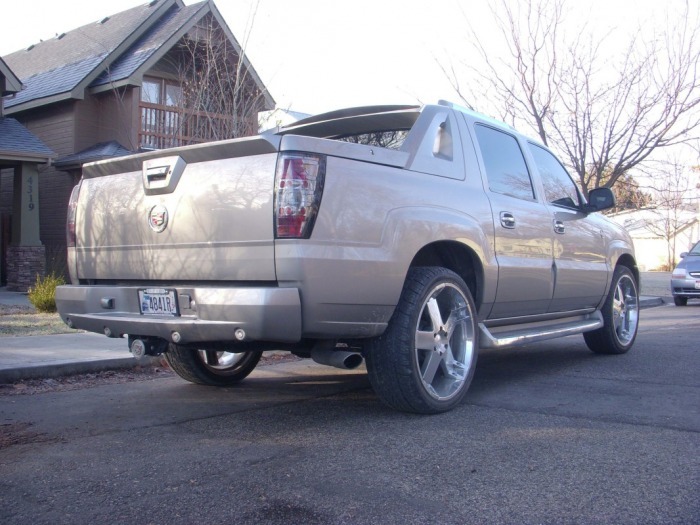 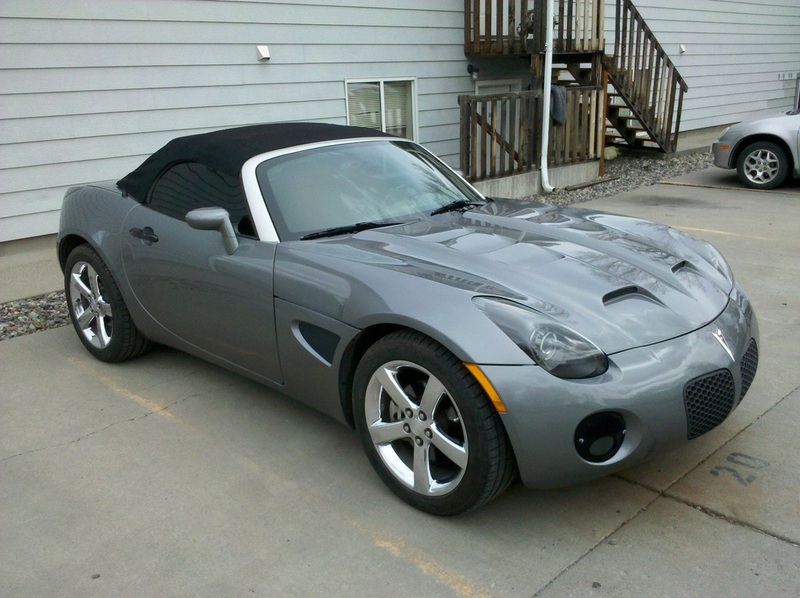 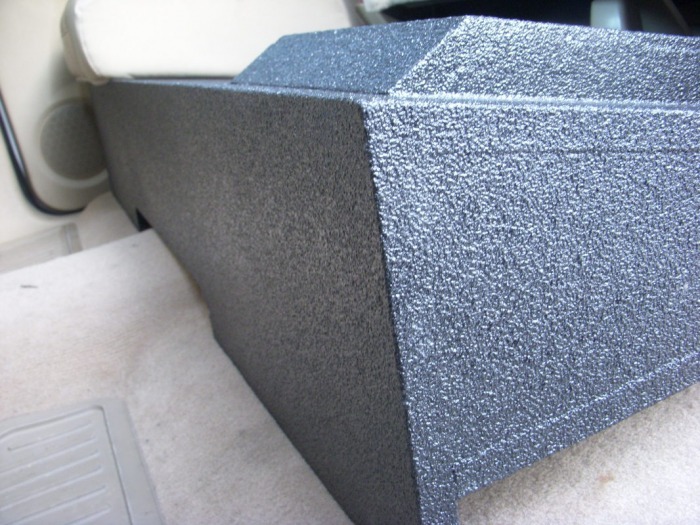 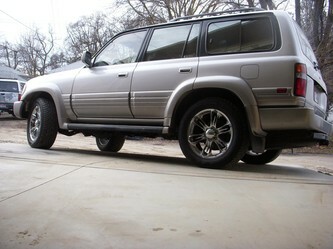 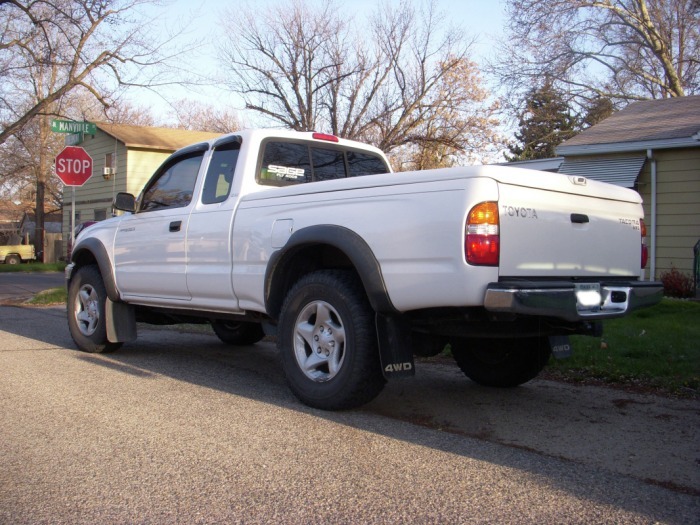 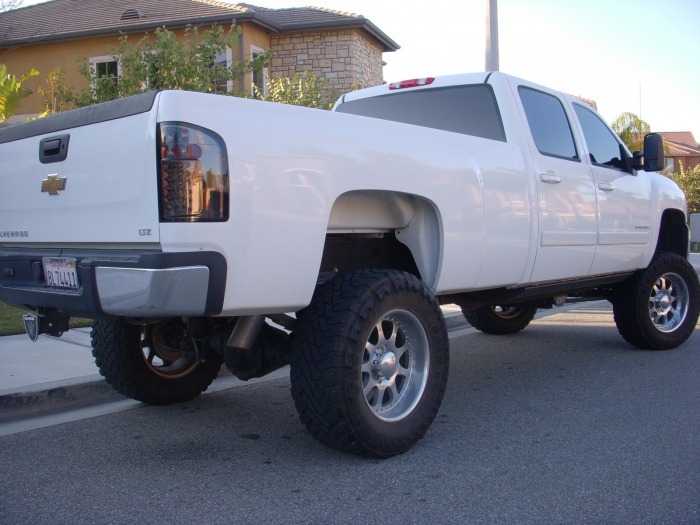 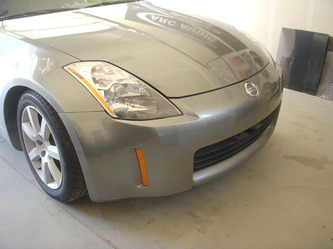 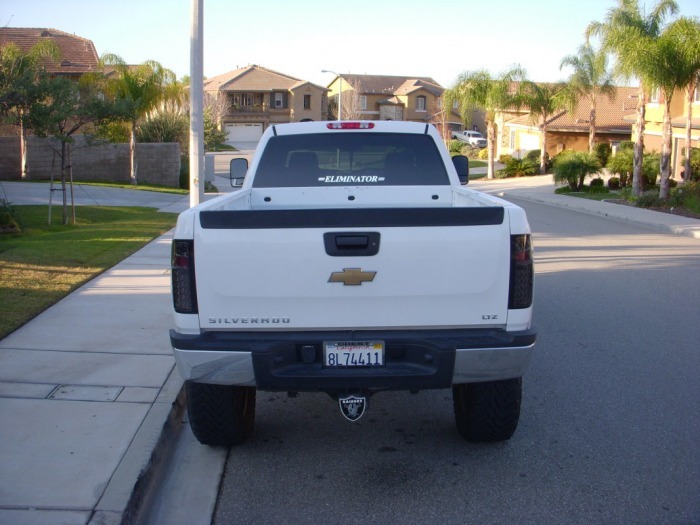 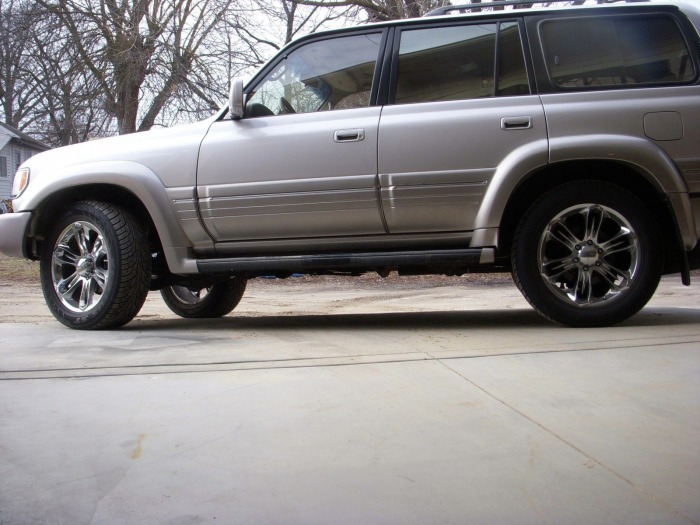 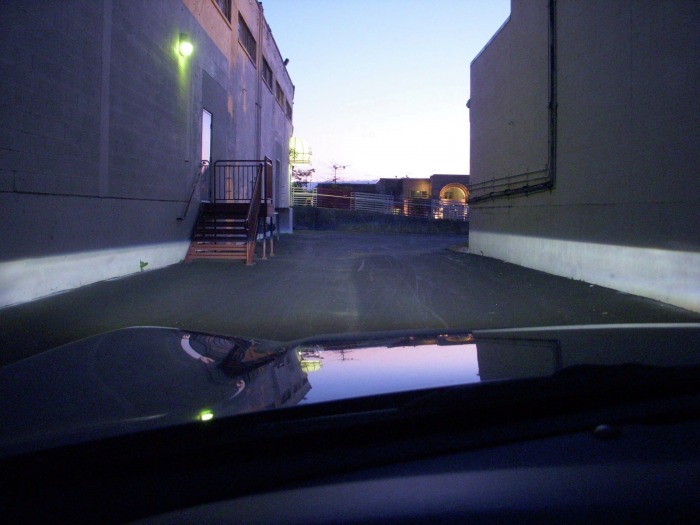 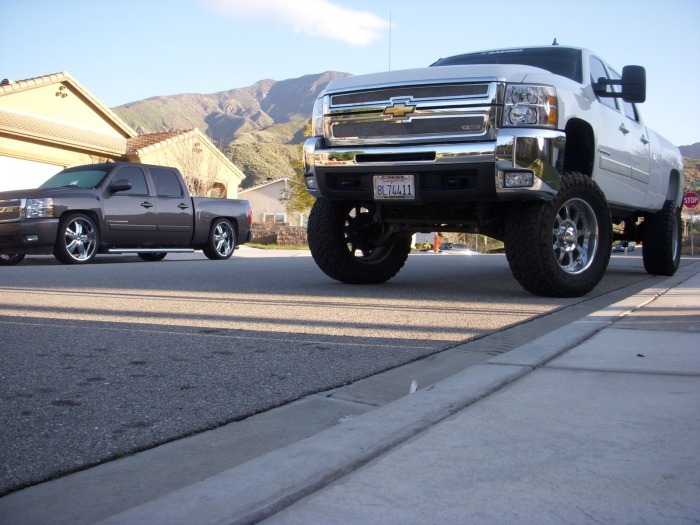 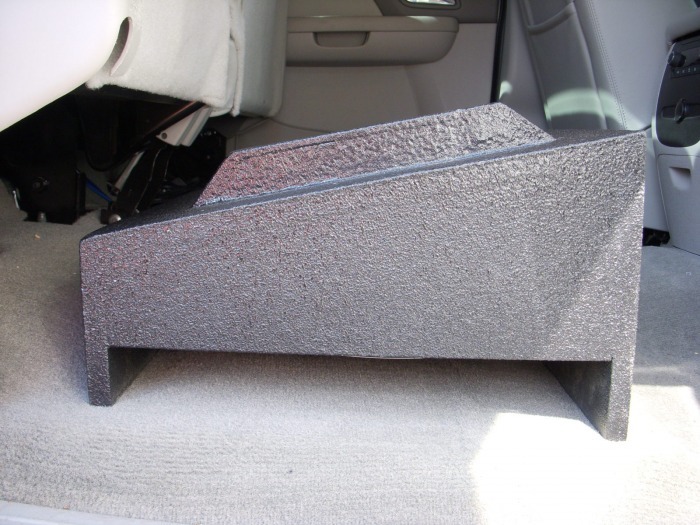 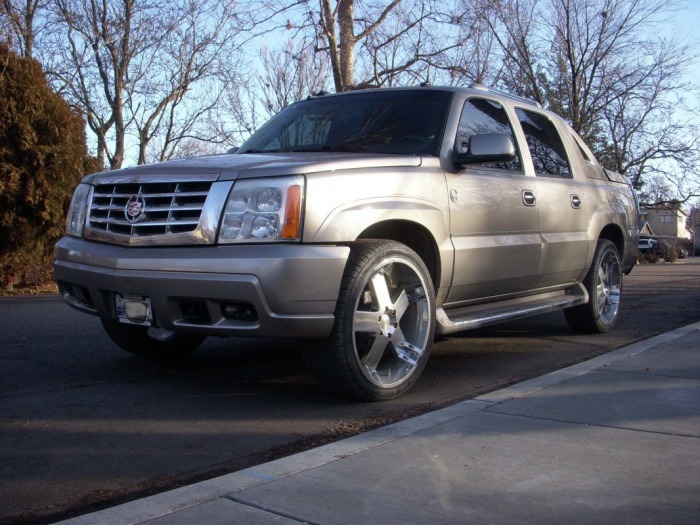 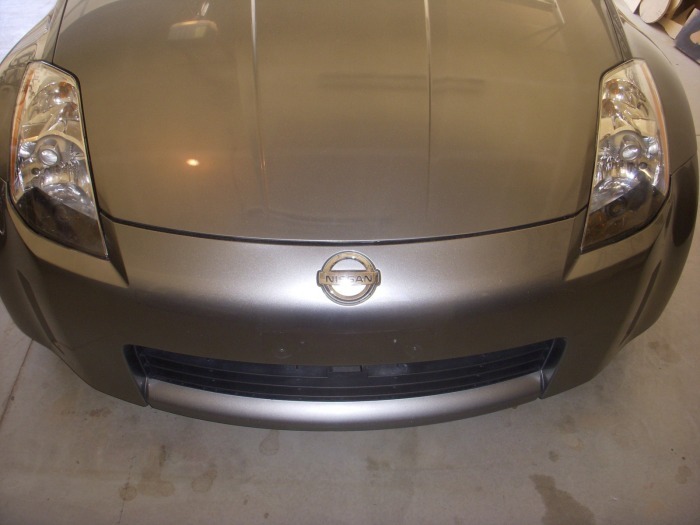 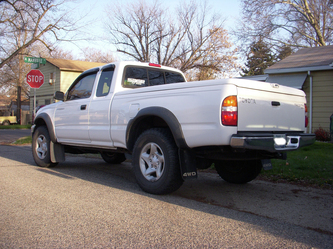 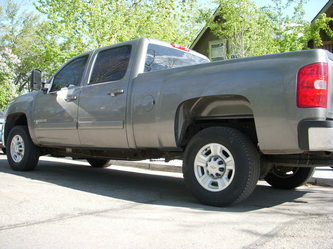 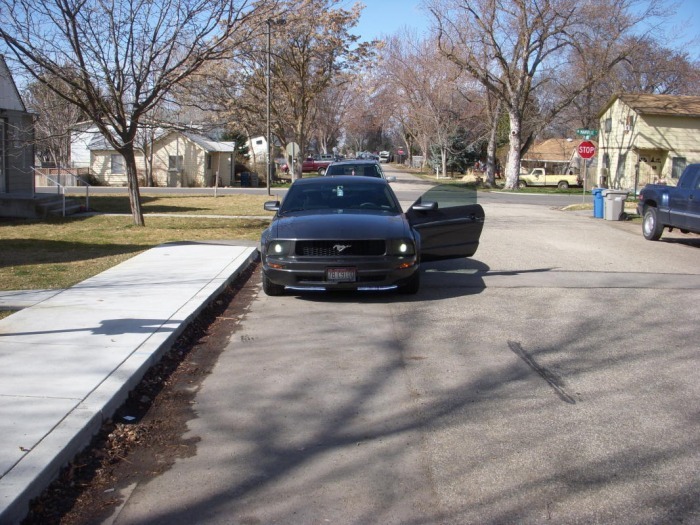 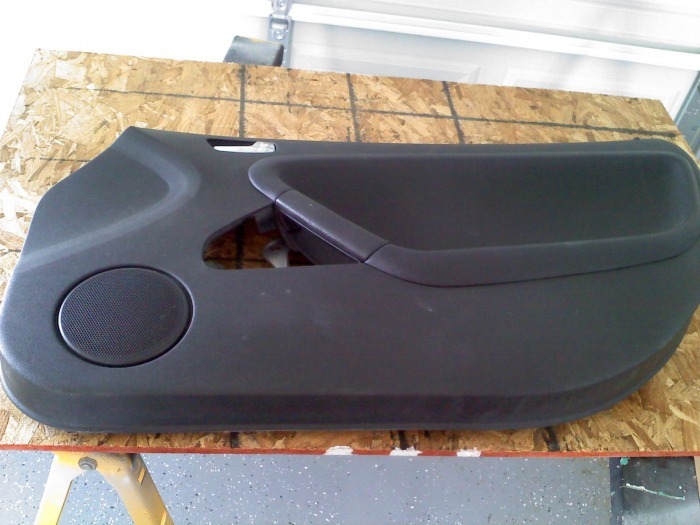 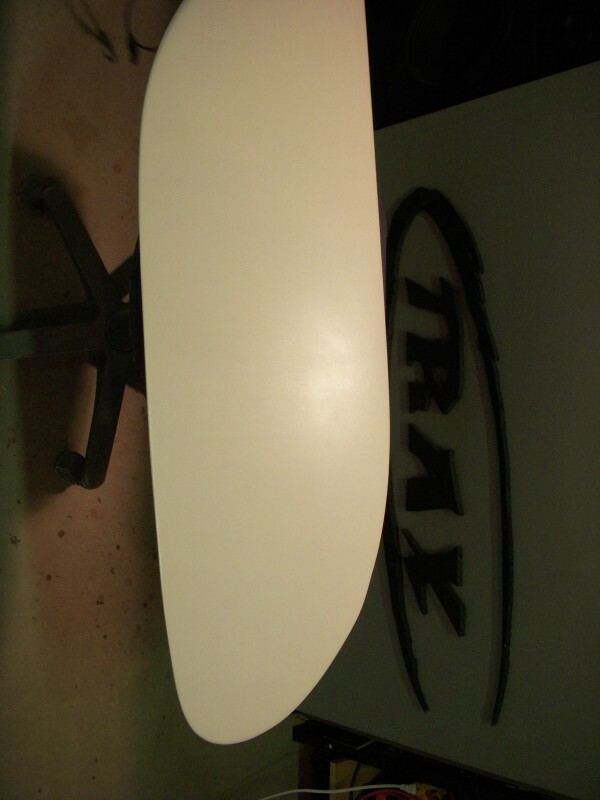 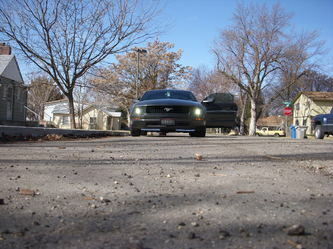 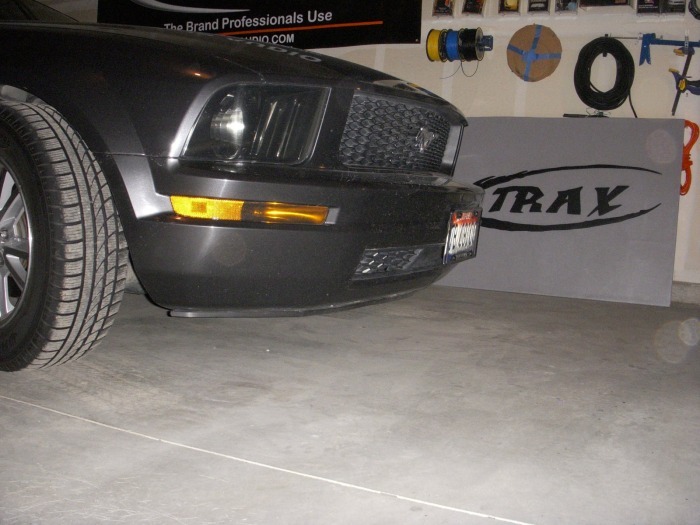 Finished in a smooth bedliner coating for durability and texture. 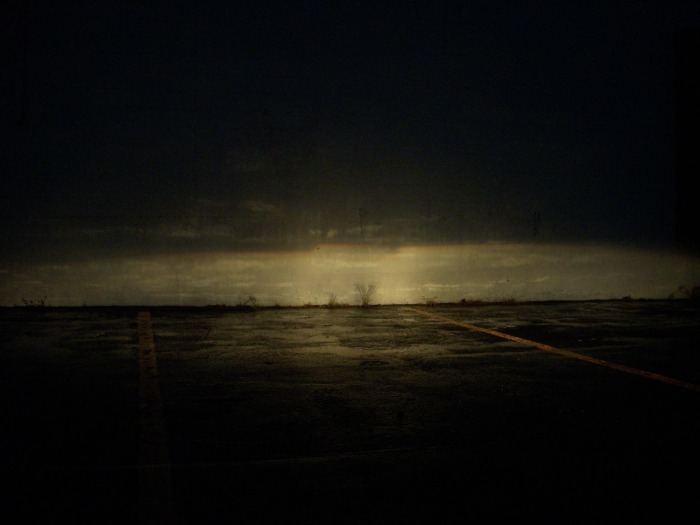 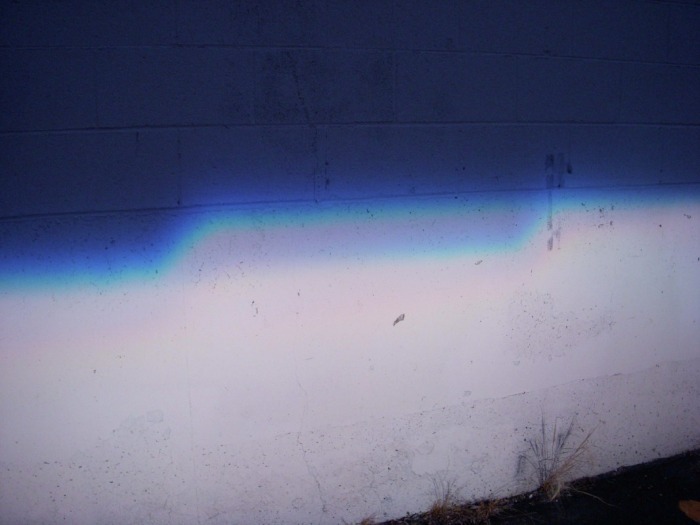 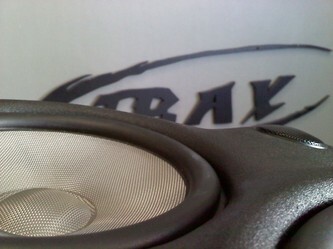 Need it louder, crisper, and deeper. 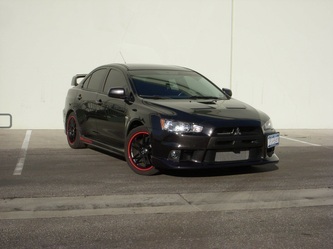 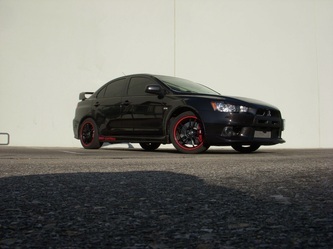 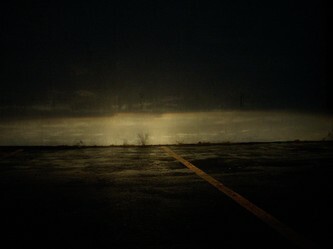 Would like to appear stock. 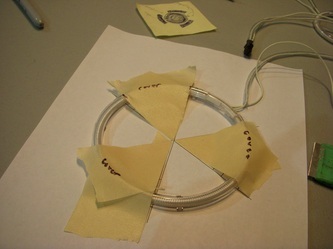 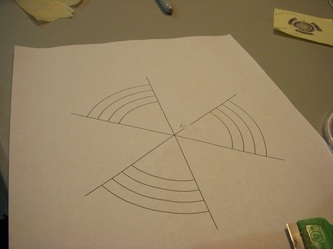 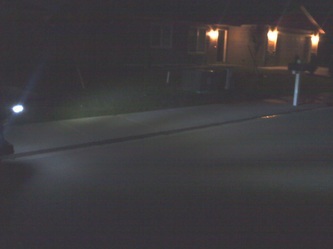 Kiddie proof. Arc Audio XXD Coaxial and Components for the doors, Alpine 4 channel amp to power the front components and rear 6.5" Elemental Designs sub in a very small (shoebox) box attached to the rear deck; which is firing out of the rear deck that has a custom trim panel made from one of the un-used XXD grills. 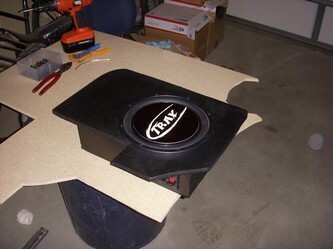 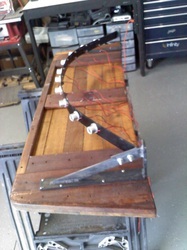 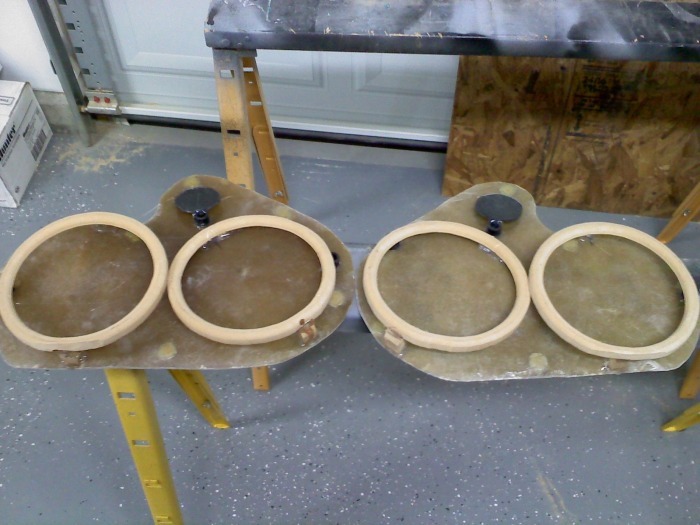 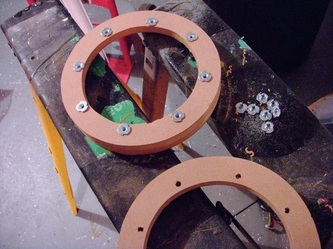 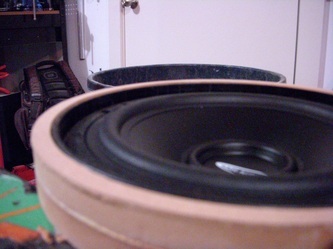 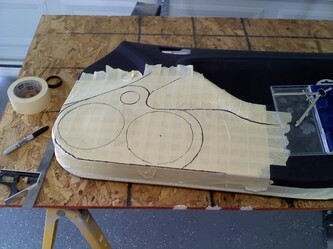 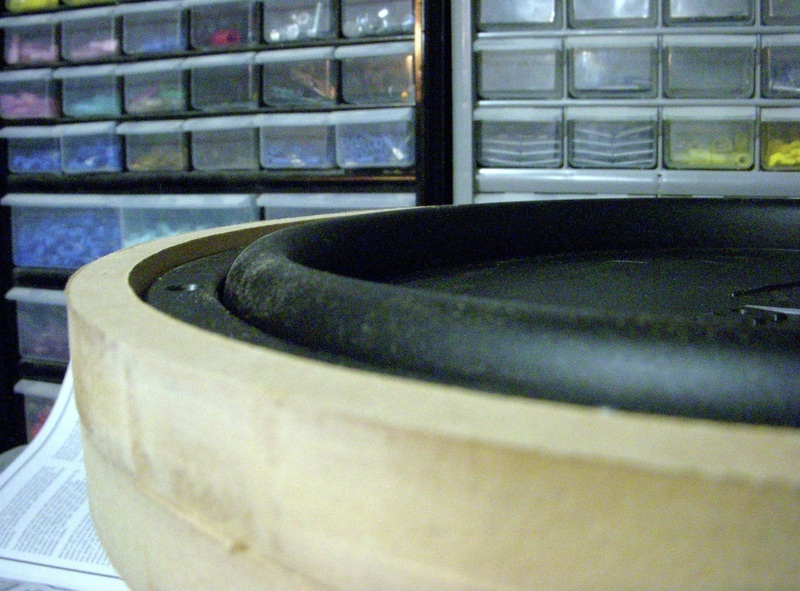 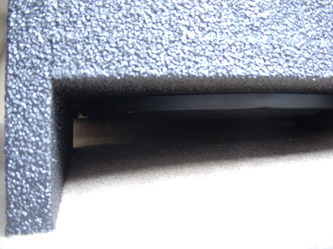 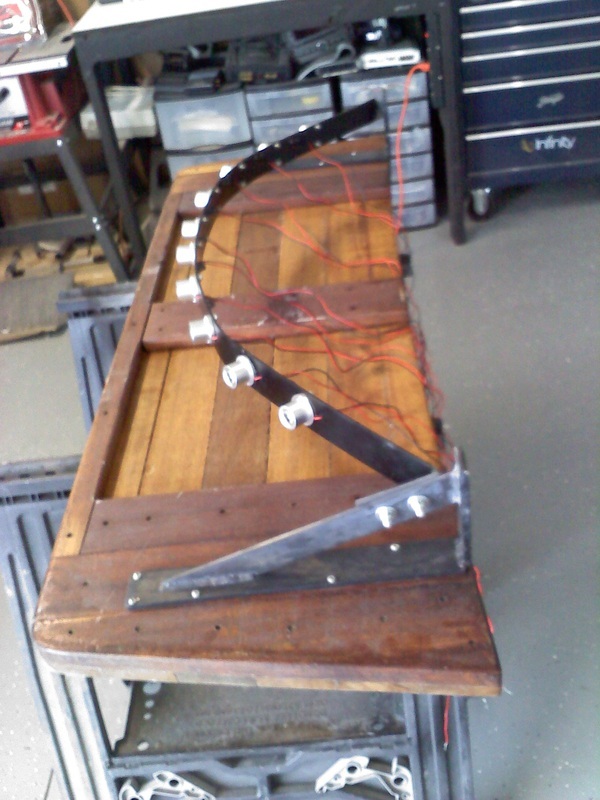 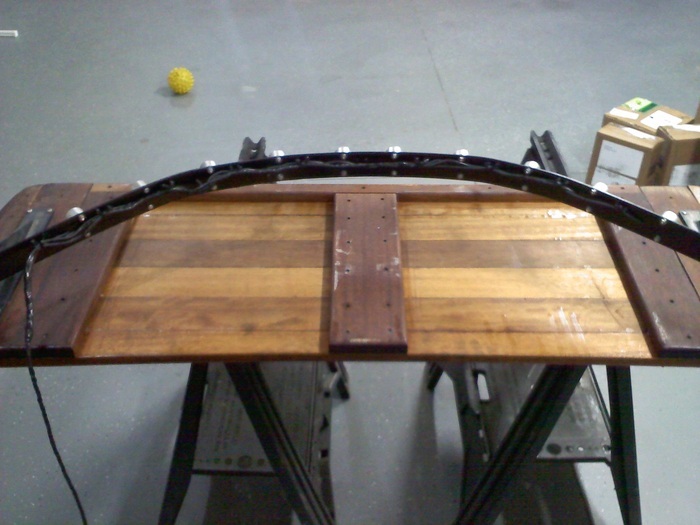 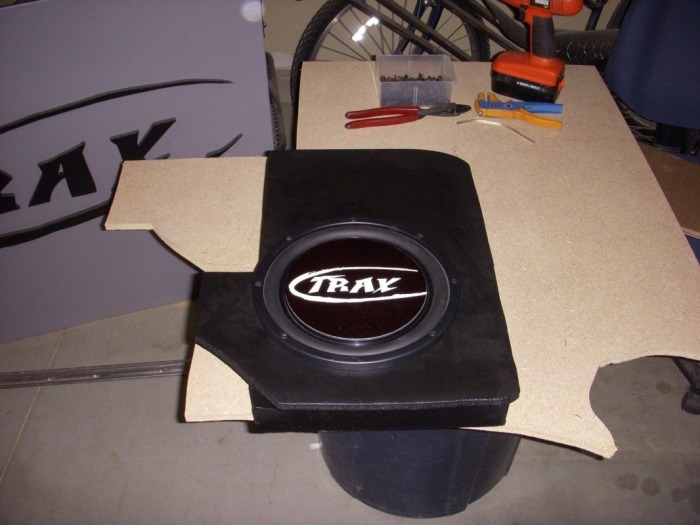 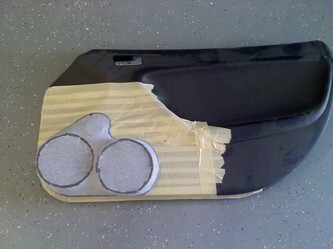 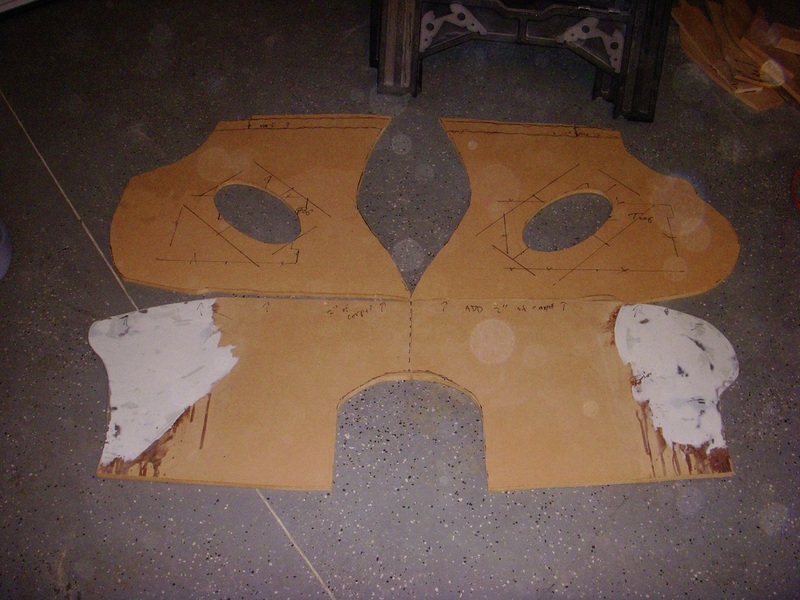 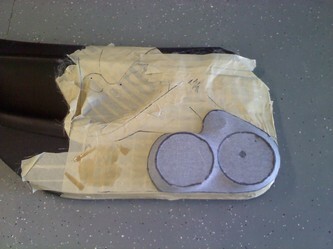 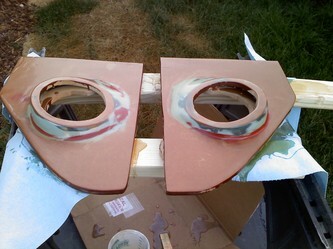 Made custom fiberglass/MDF kick panels, with angled speaker rings to project sound up to the listeners ears. 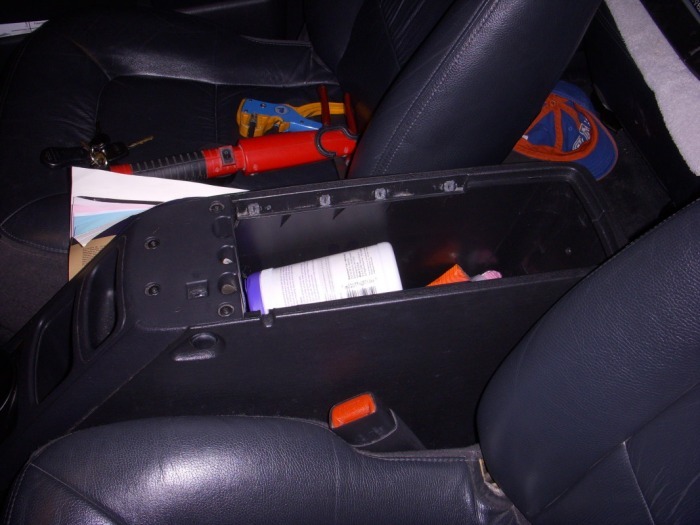 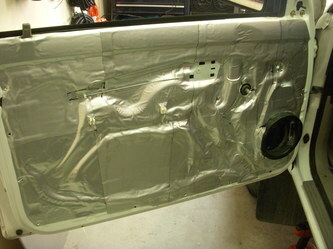 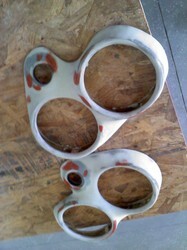 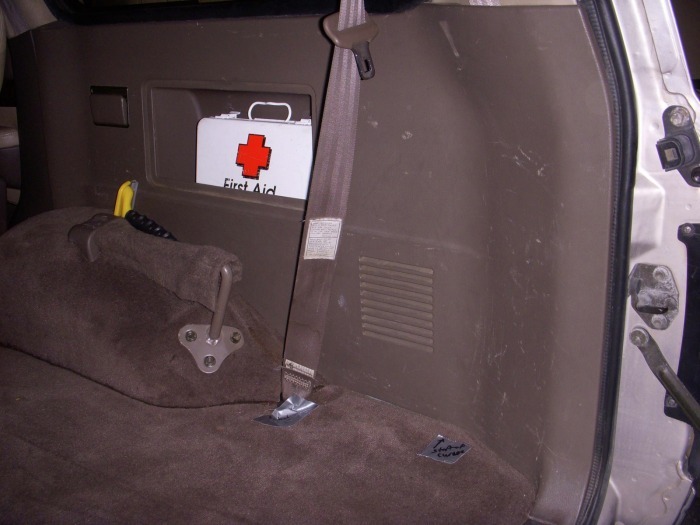 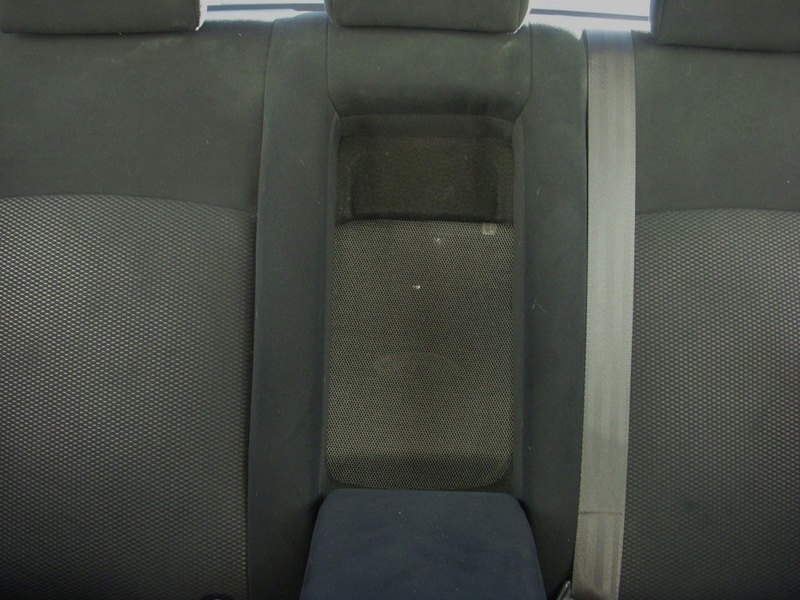 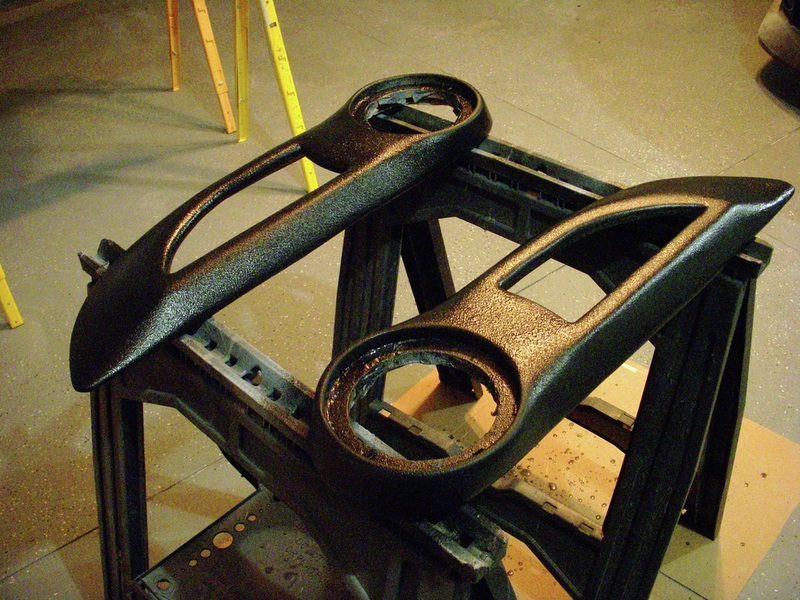 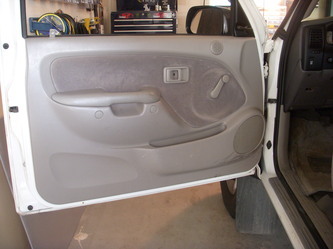 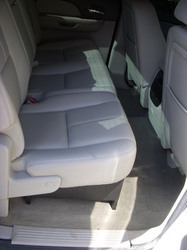 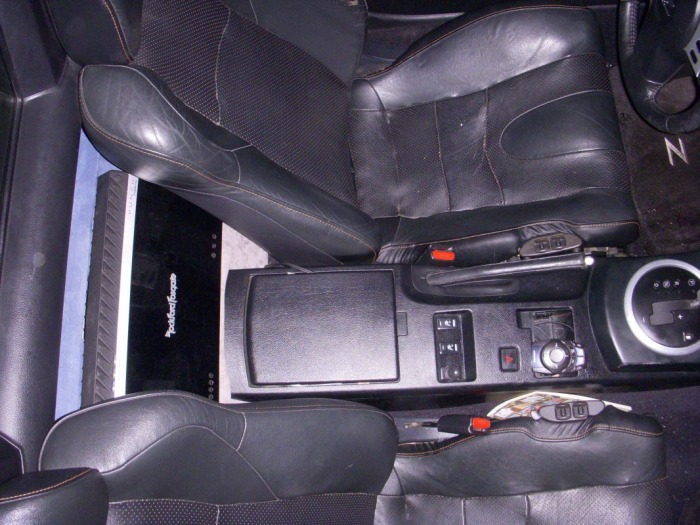 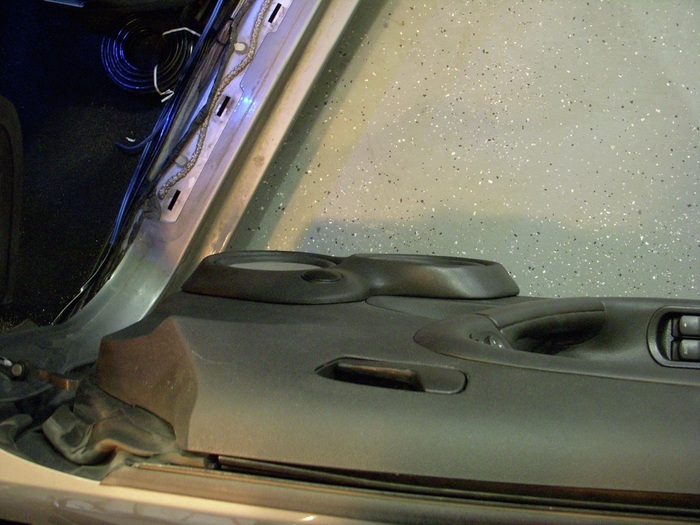 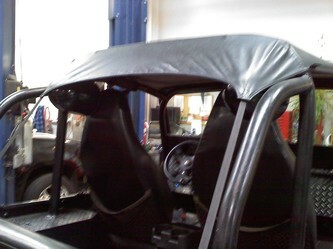 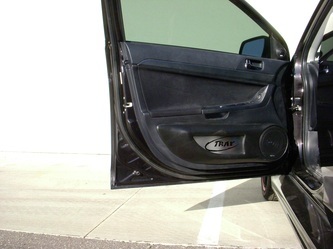 Rhino-lined to match existing interior and ensure years of use. 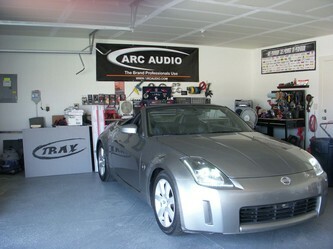 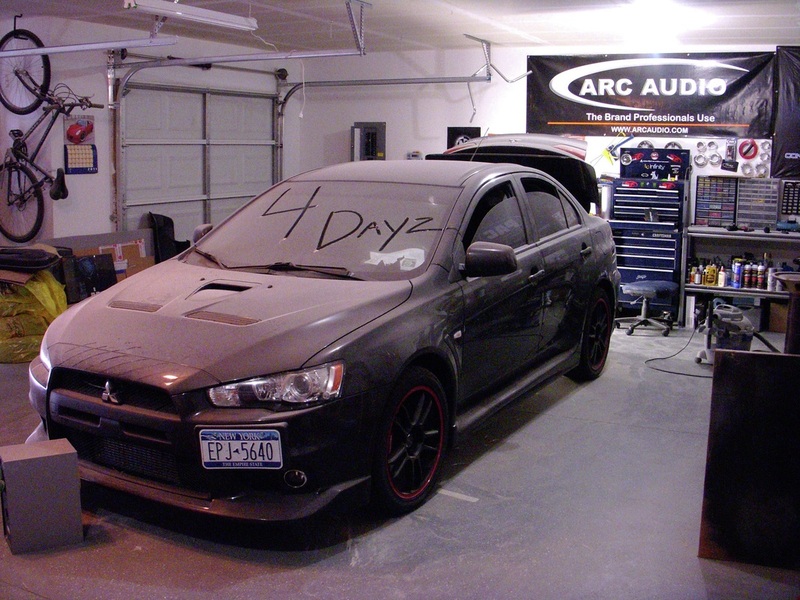 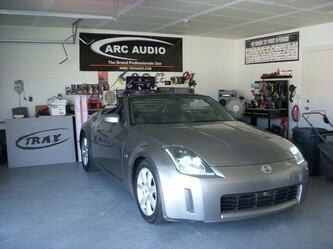 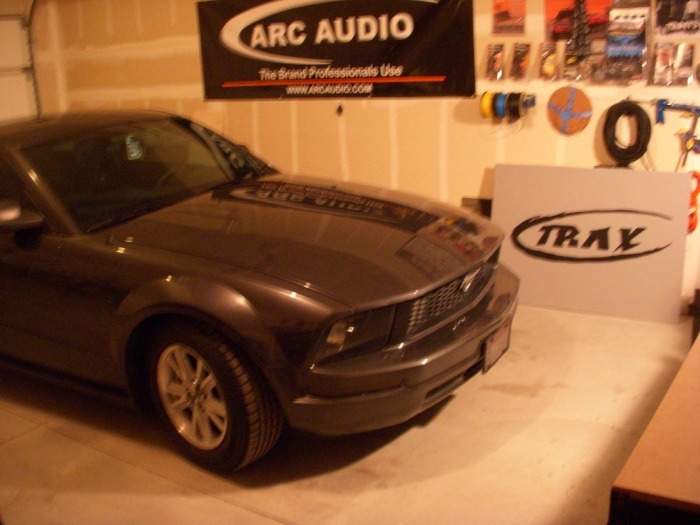 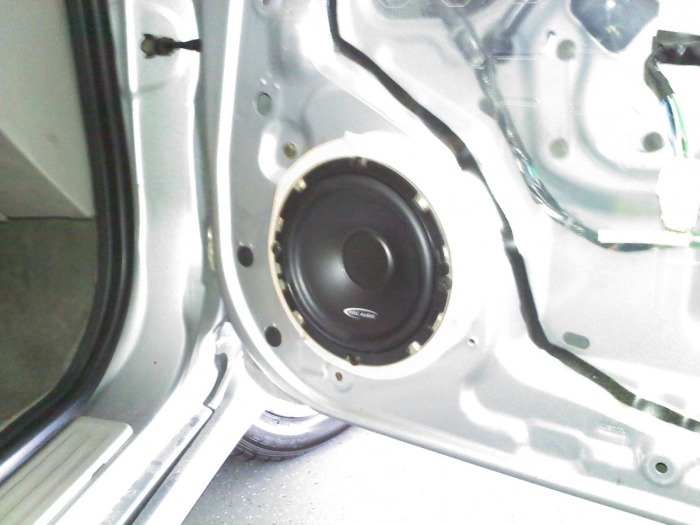 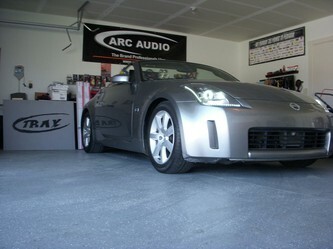 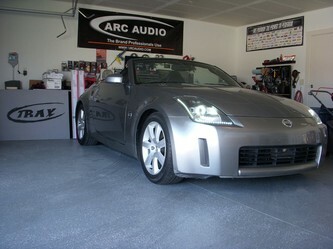 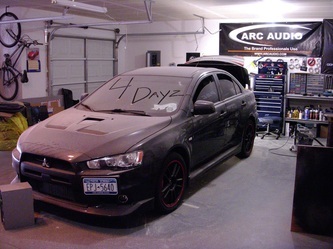 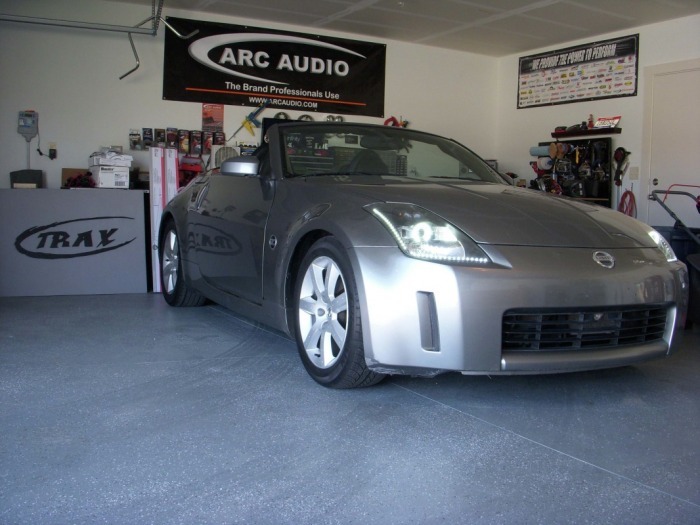 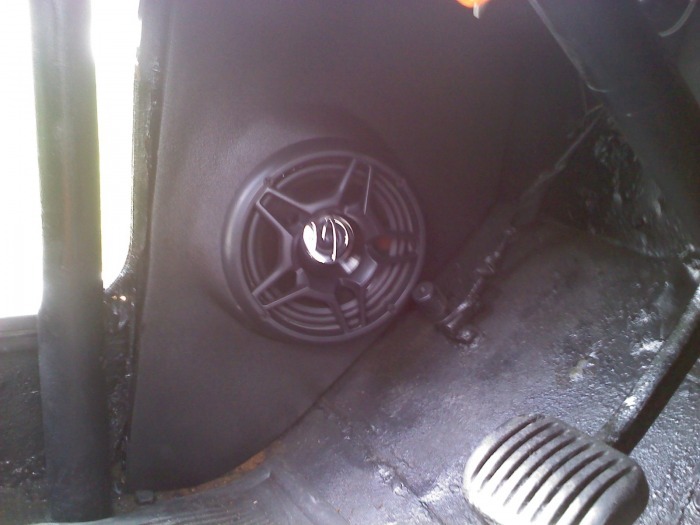 Installed Arc Audio KS 6.5" Coaxial speakers. 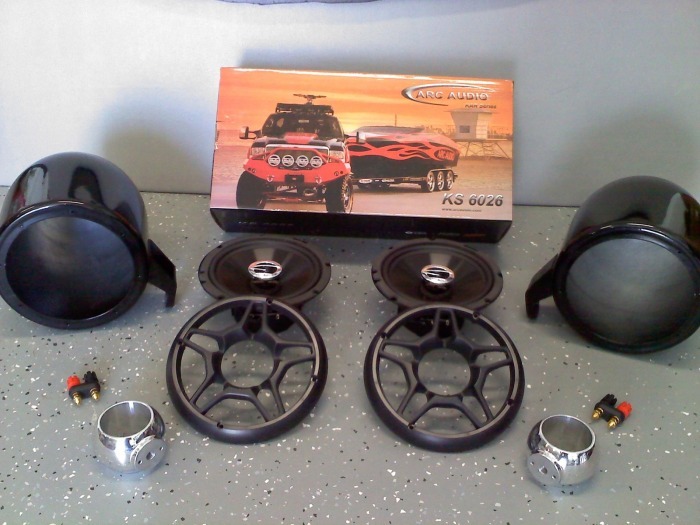 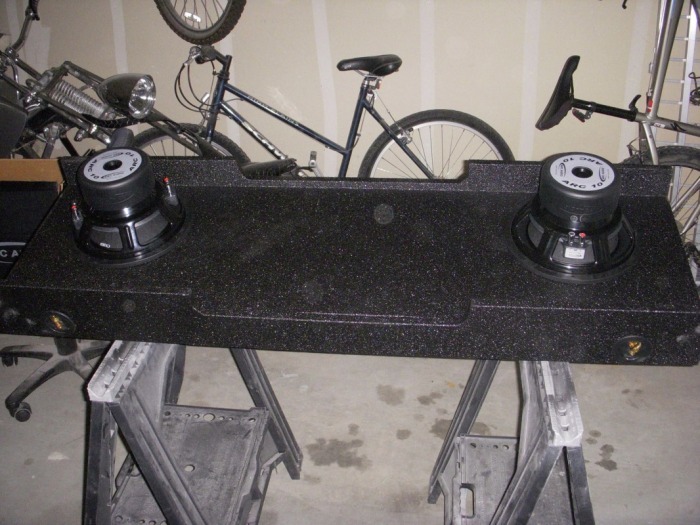 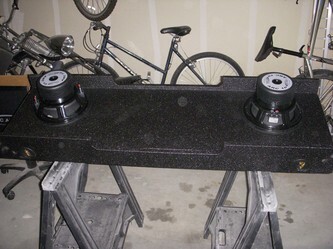 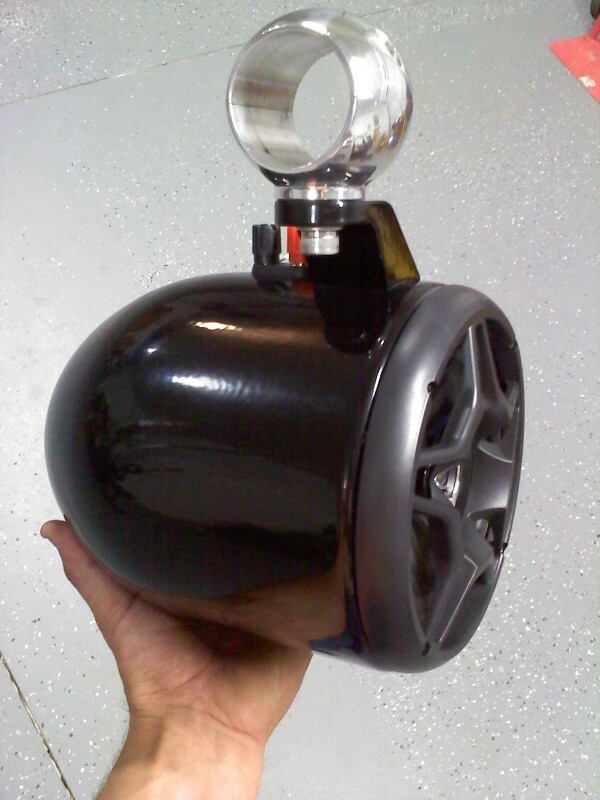 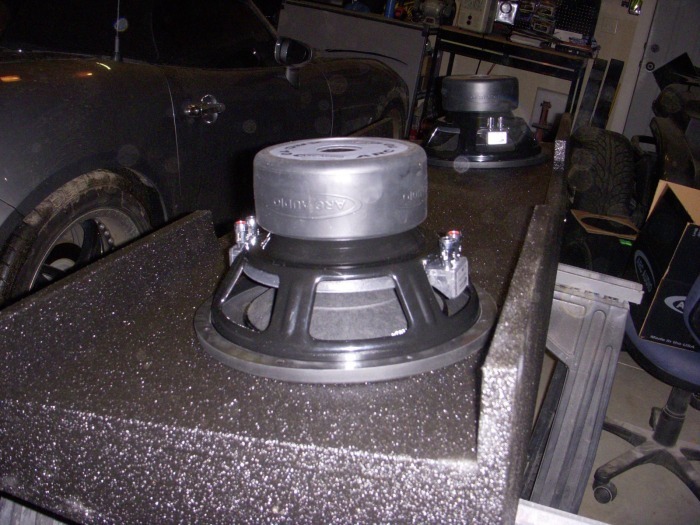 Ordered some Billet Lines wakeboard tower speaker pods (a new line we carry for all your boating needs) and put another set of Arc Audio KS 6.5" coaxial speakers in there as well! These things scream in these pods! 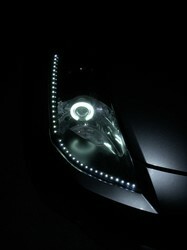 More lights, brighter lights, and this things has to turn heads! 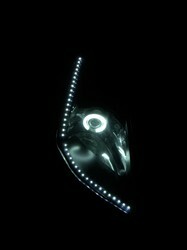 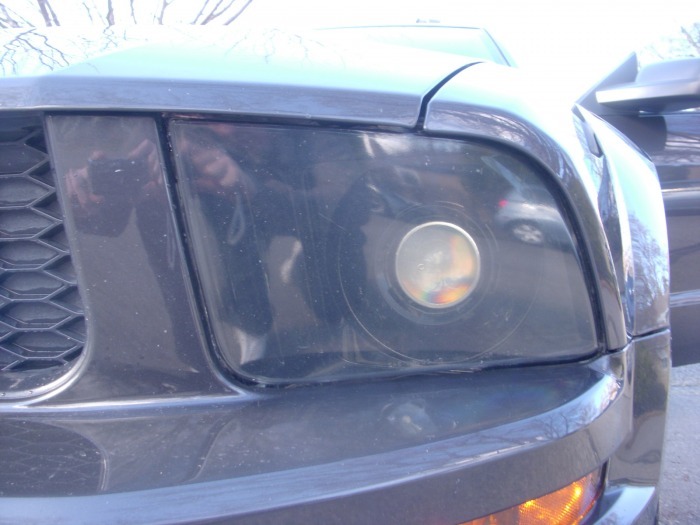 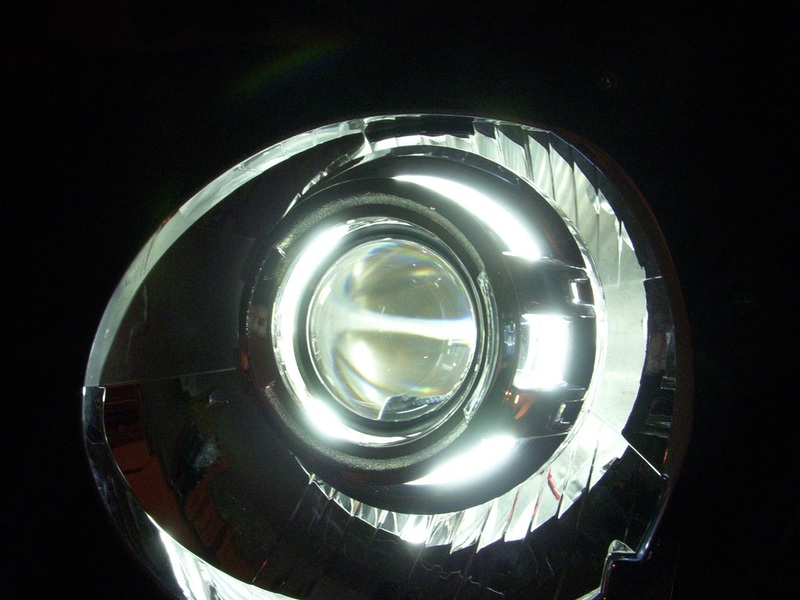 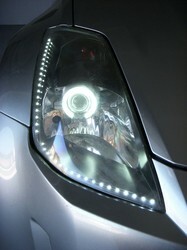 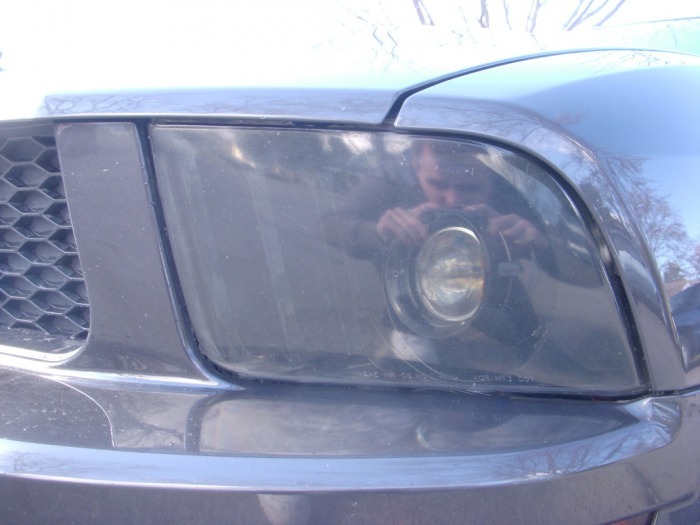 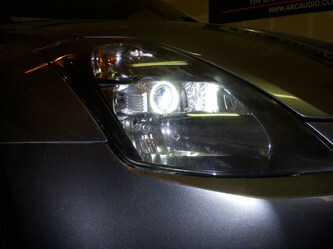 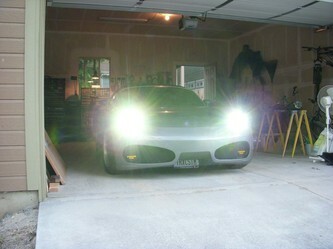 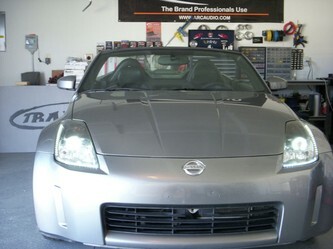 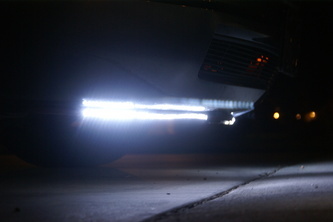 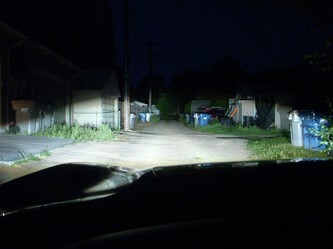 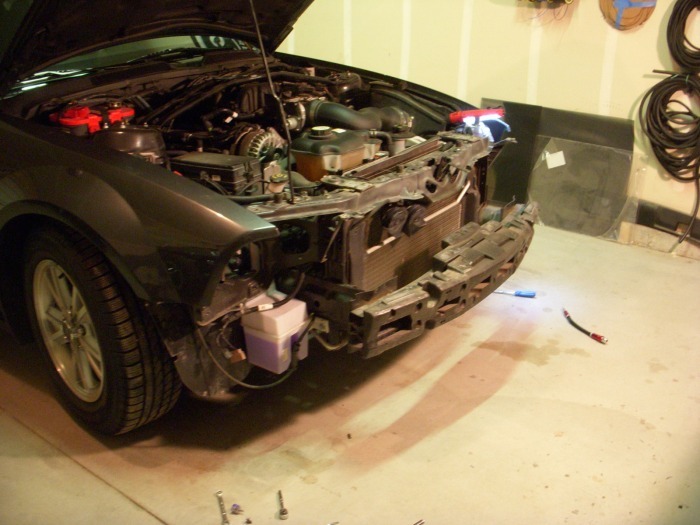 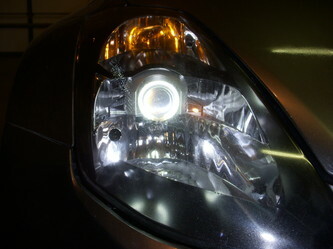 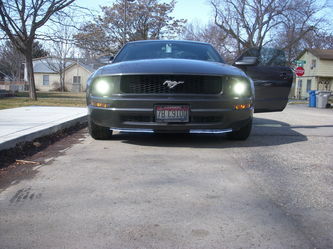 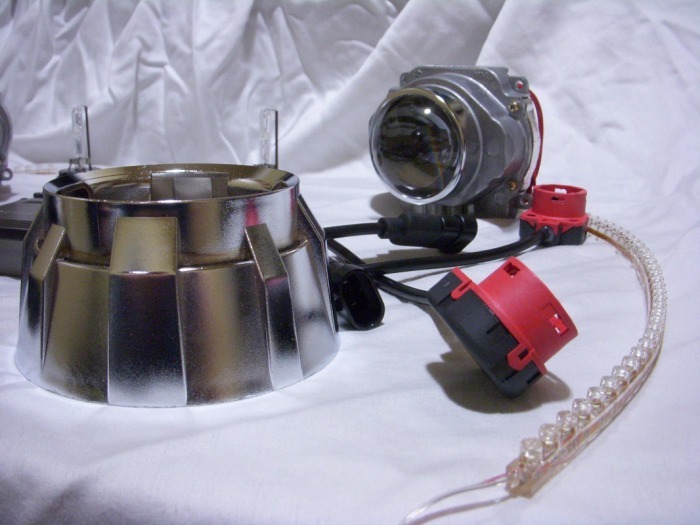 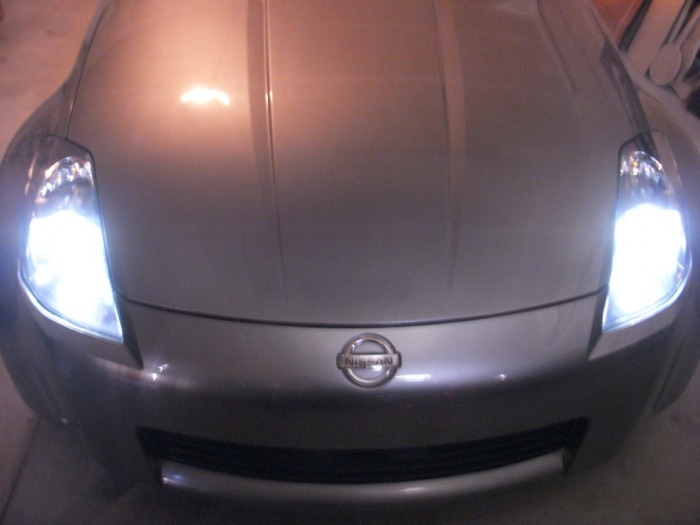 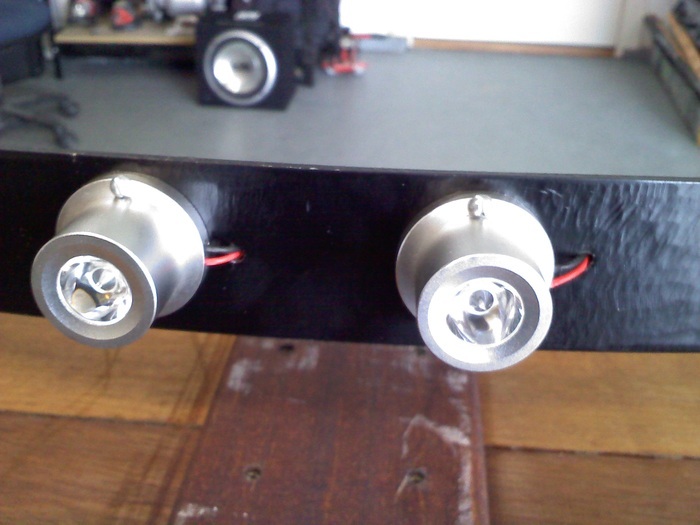 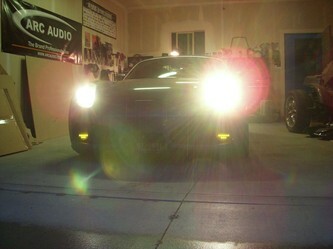 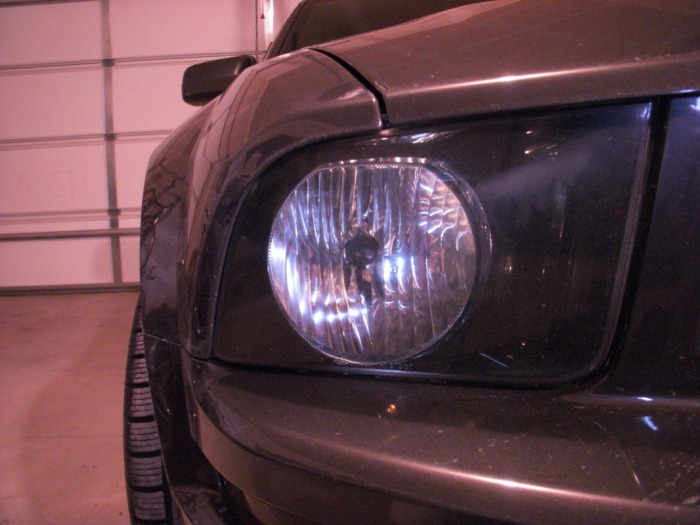 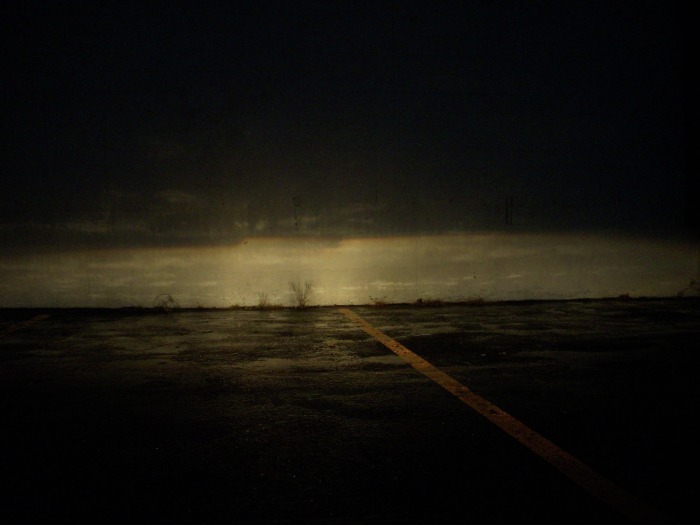 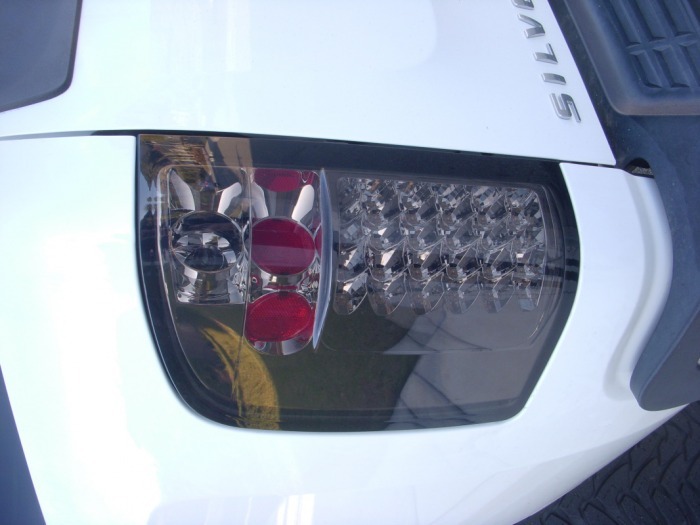 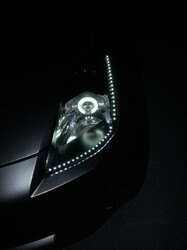 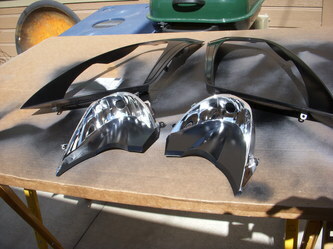 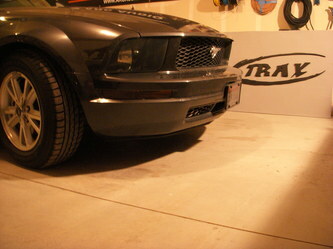 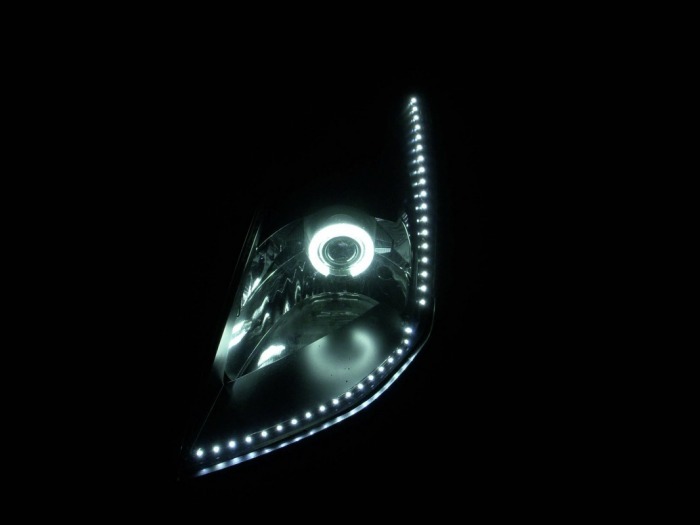 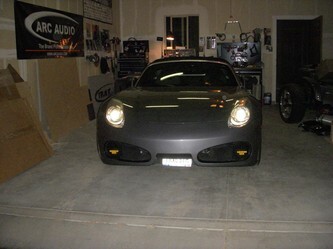 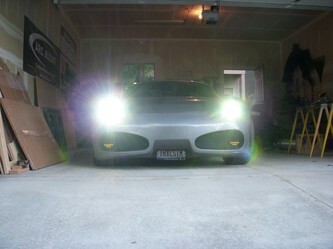 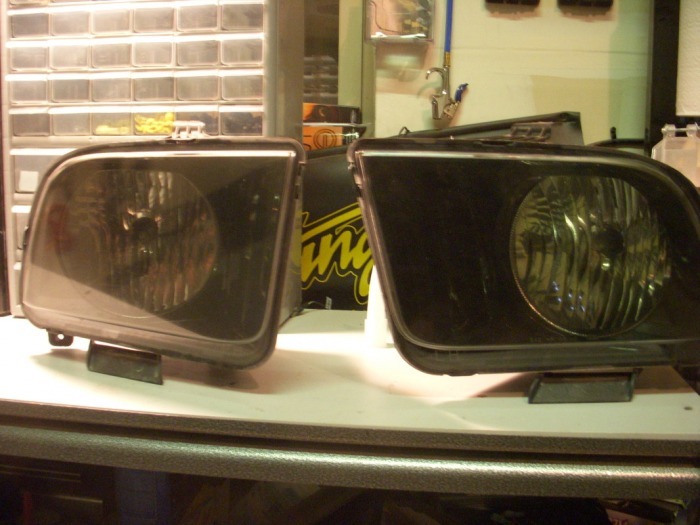 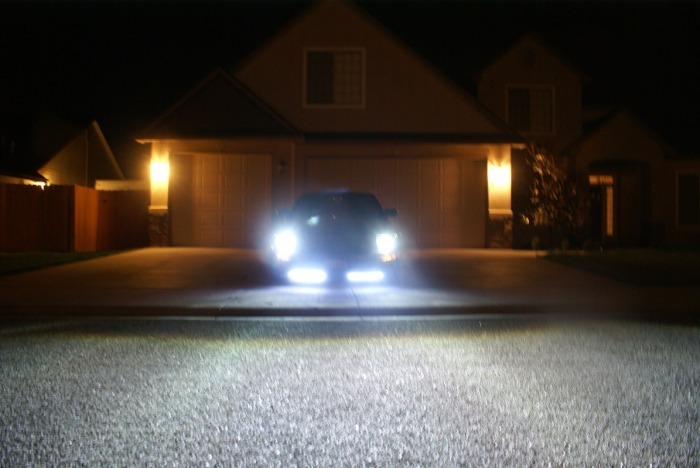 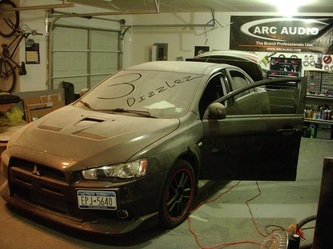 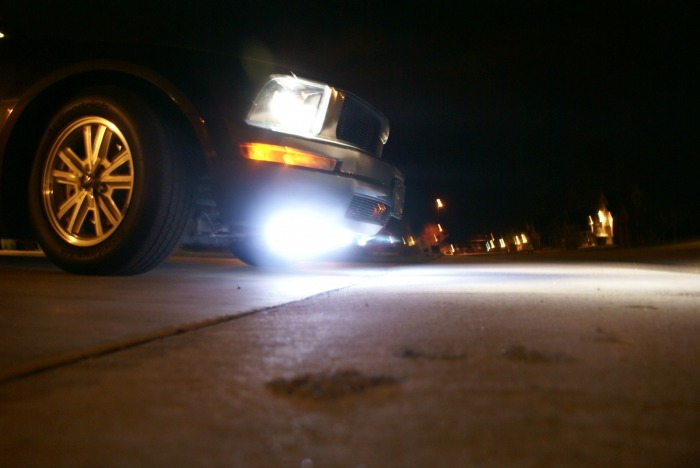 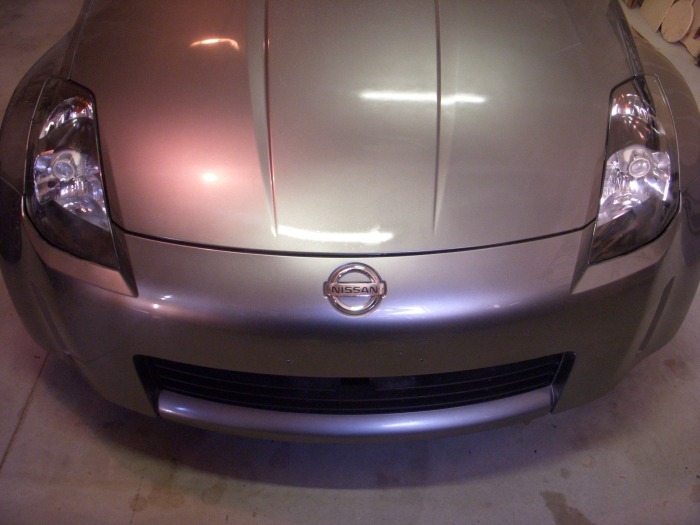 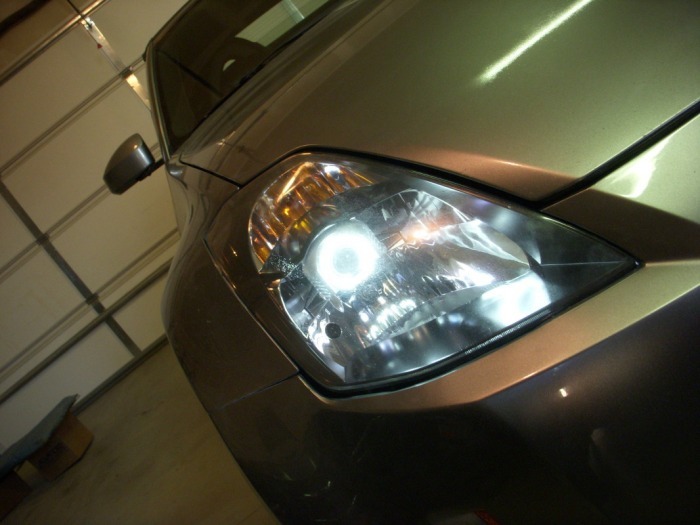 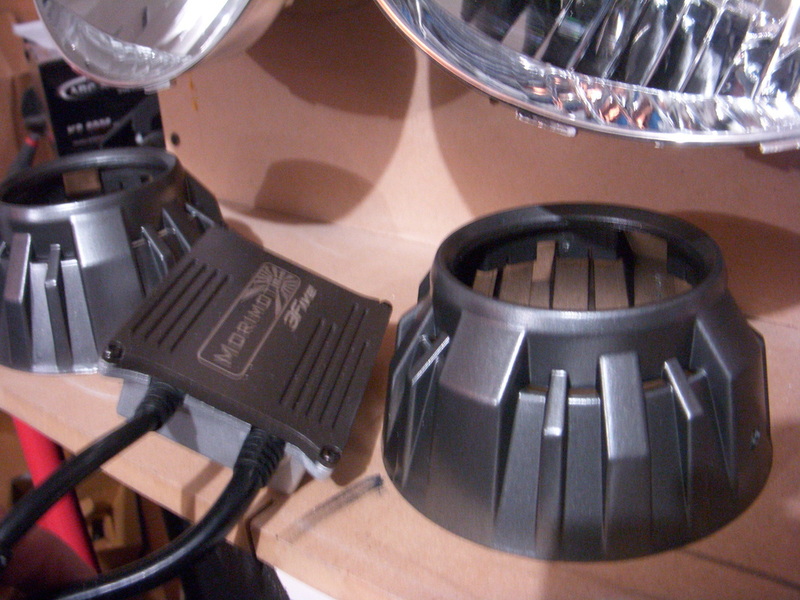 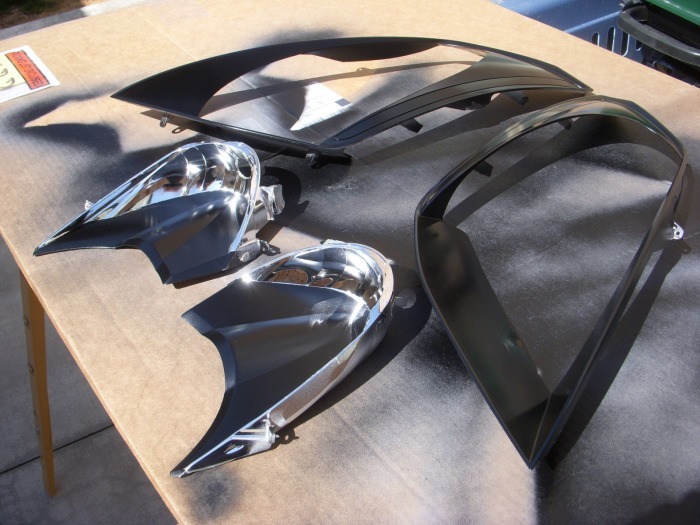 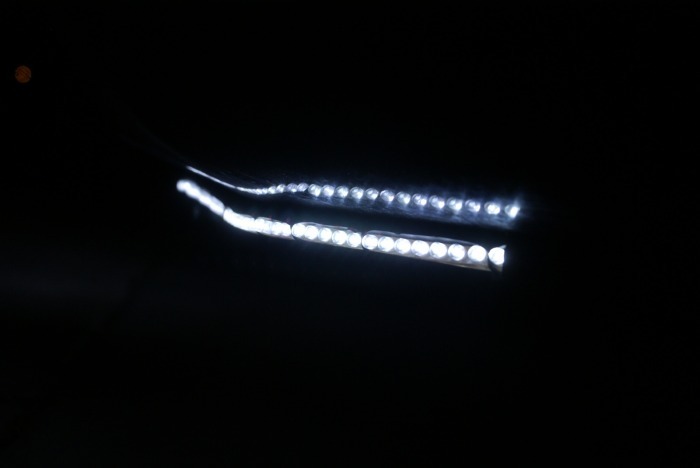 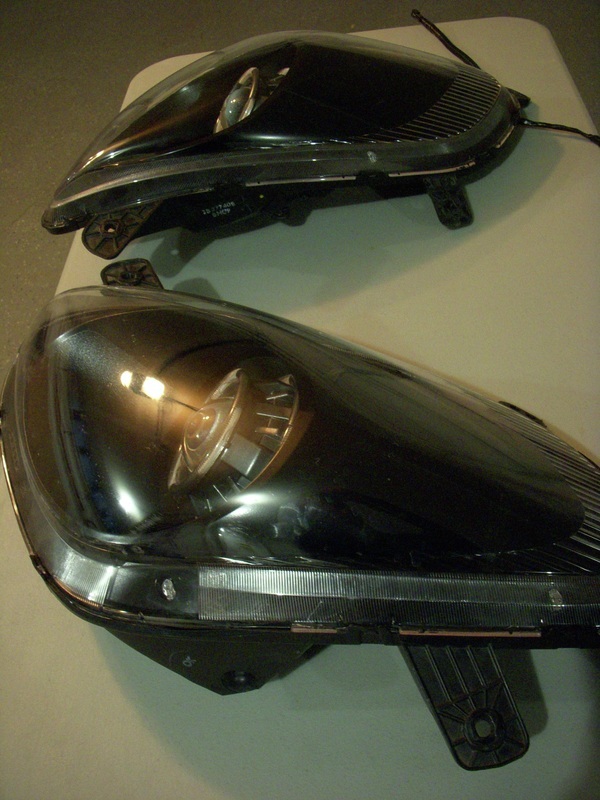 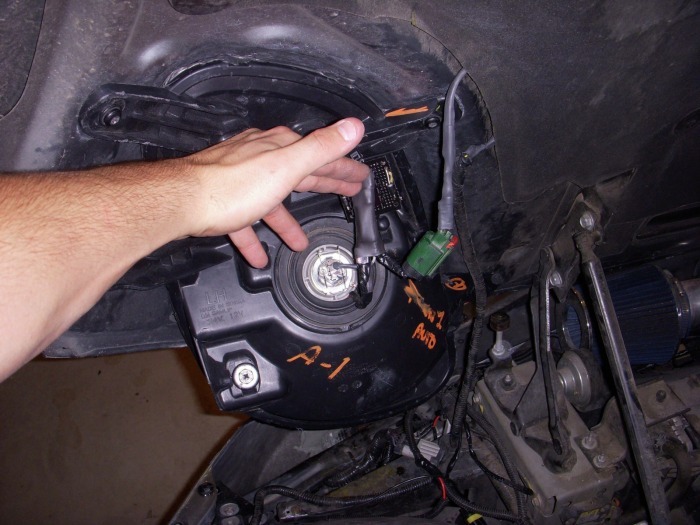 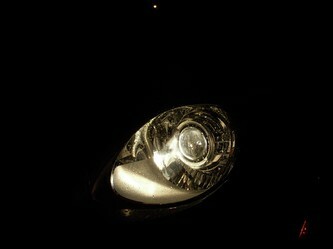 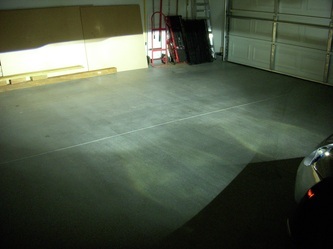 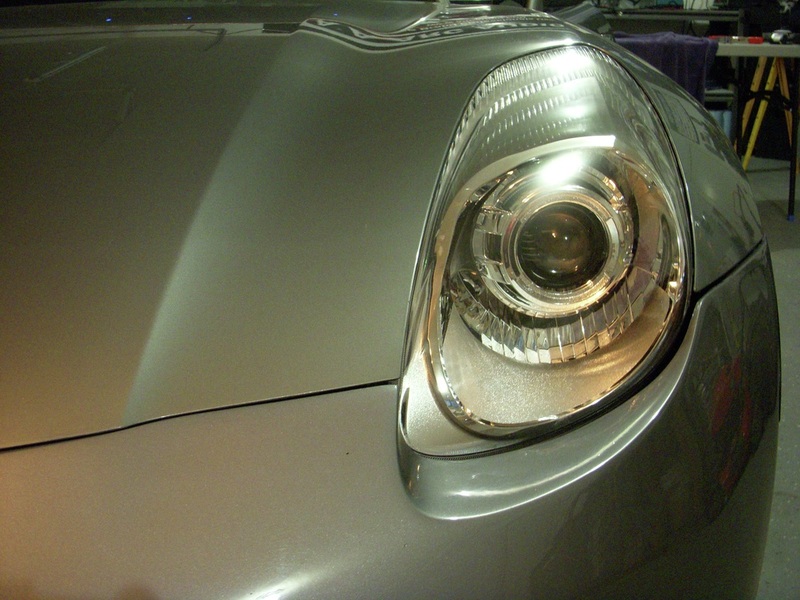 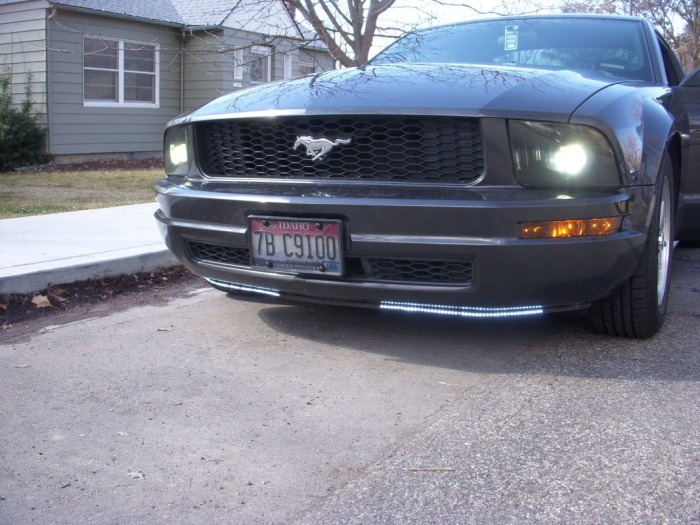 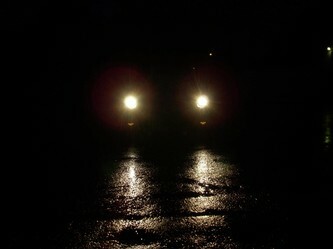 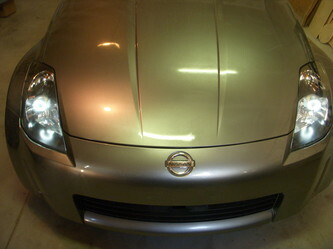 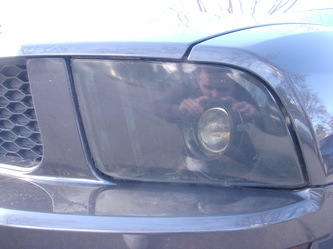 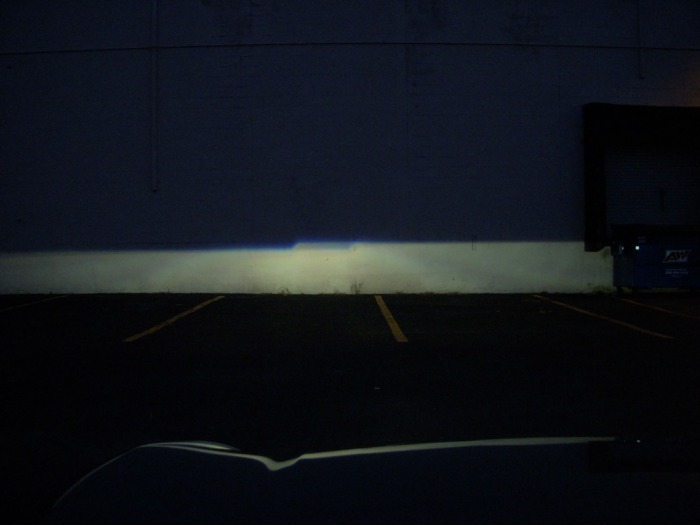 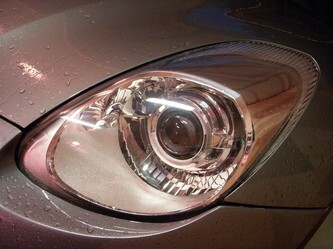 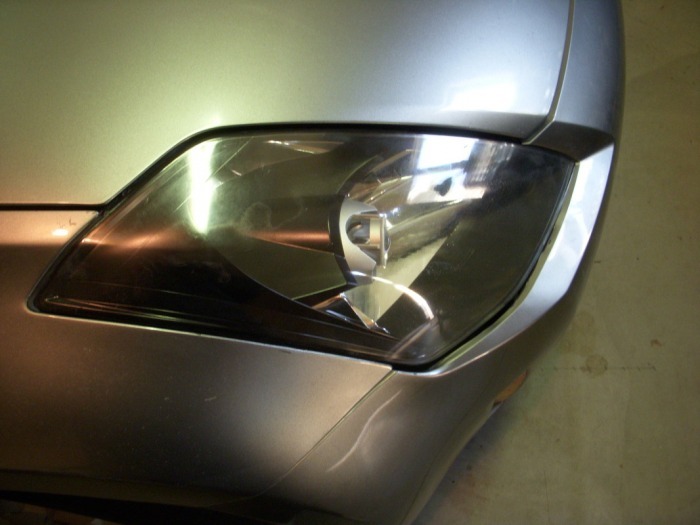 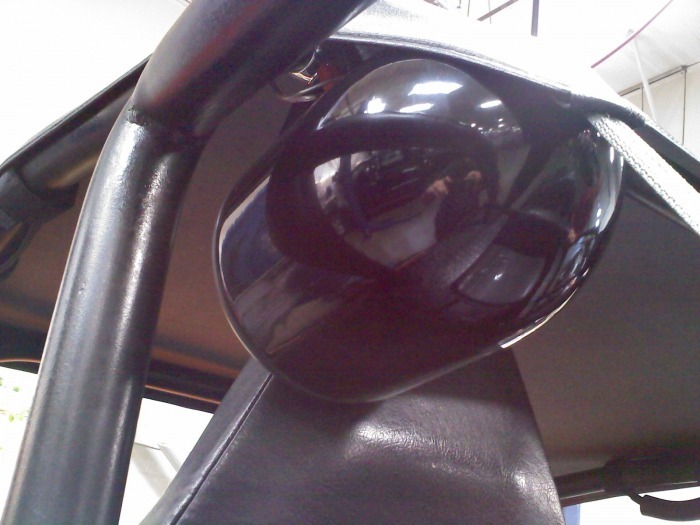 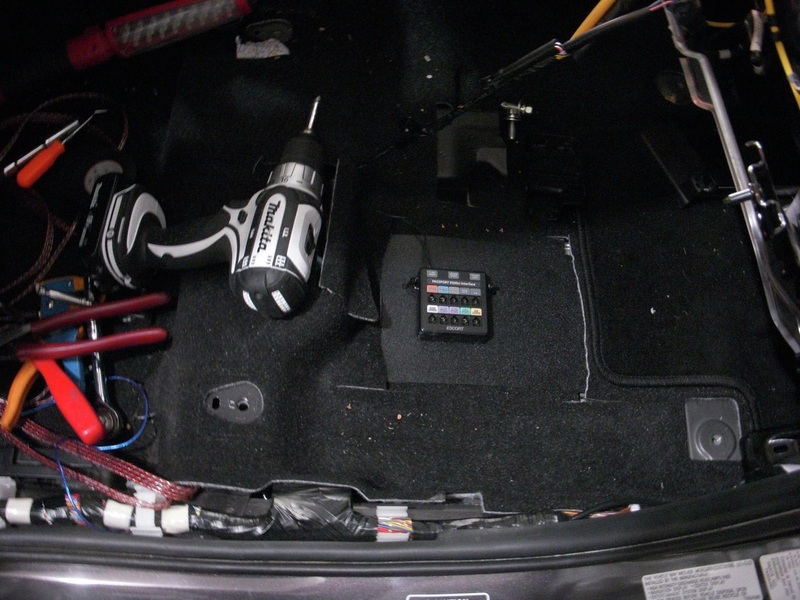 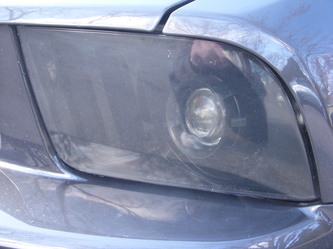 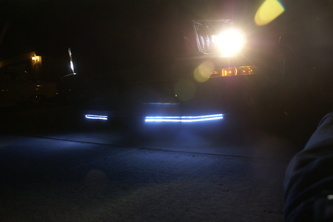 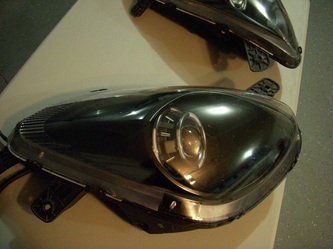 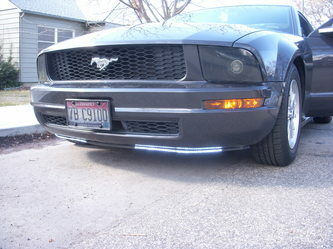 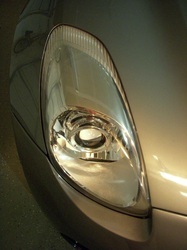 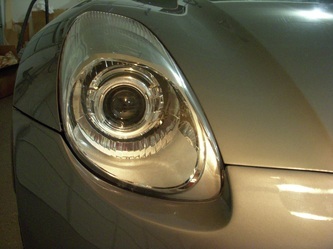 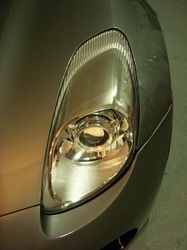 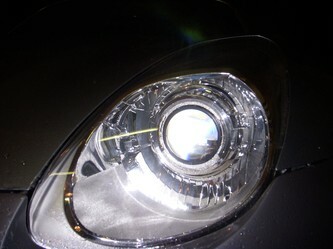 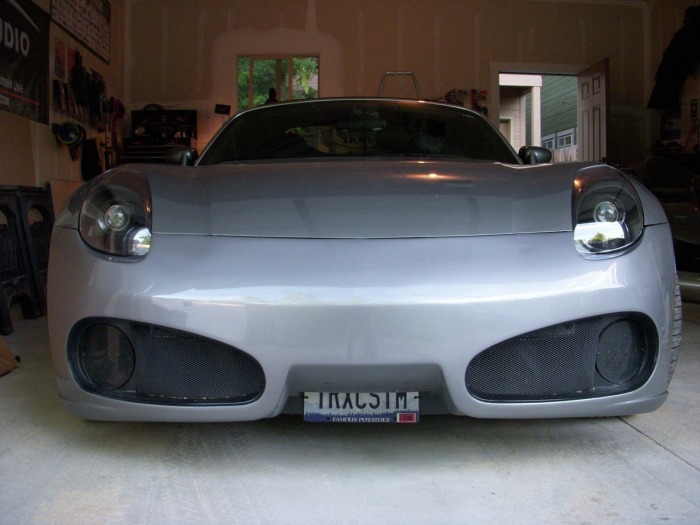 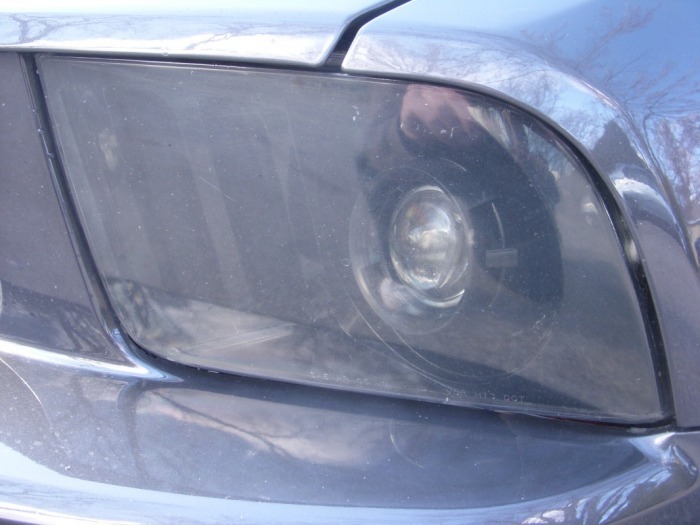 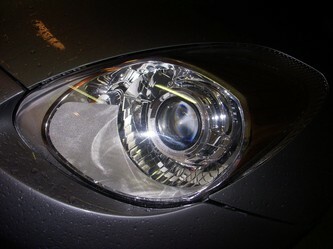 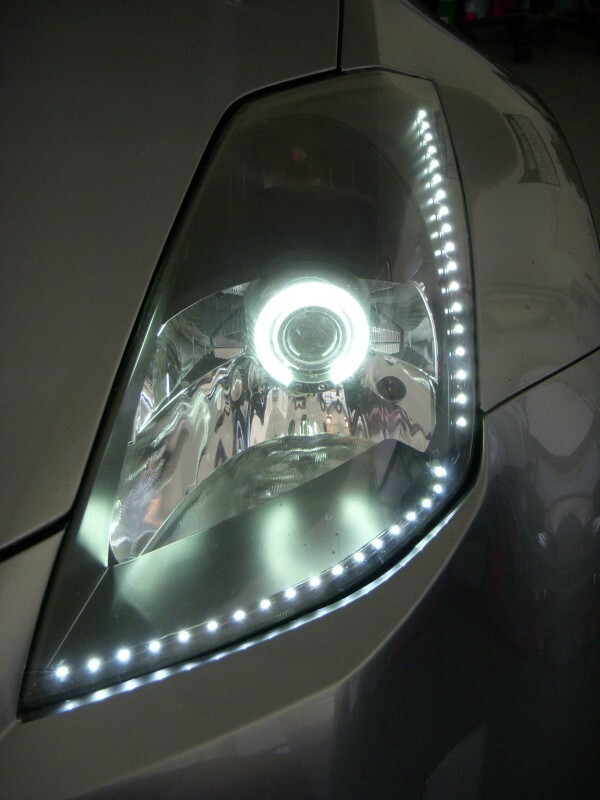 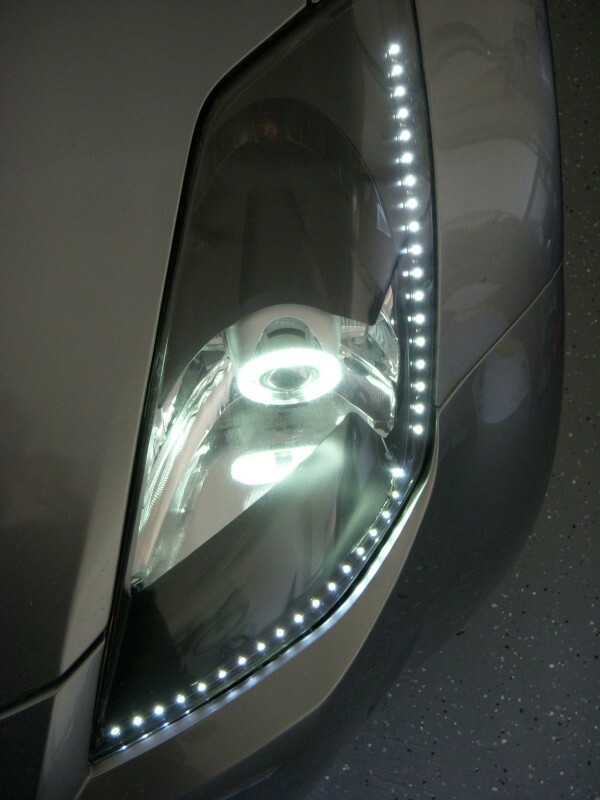 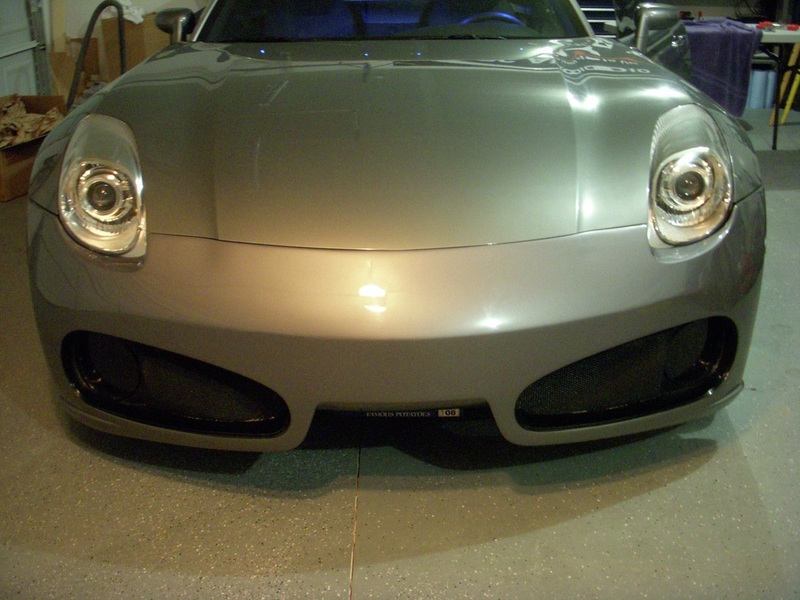 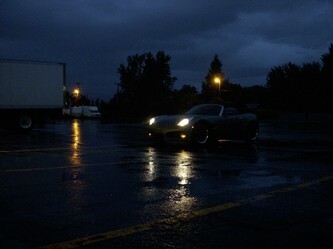 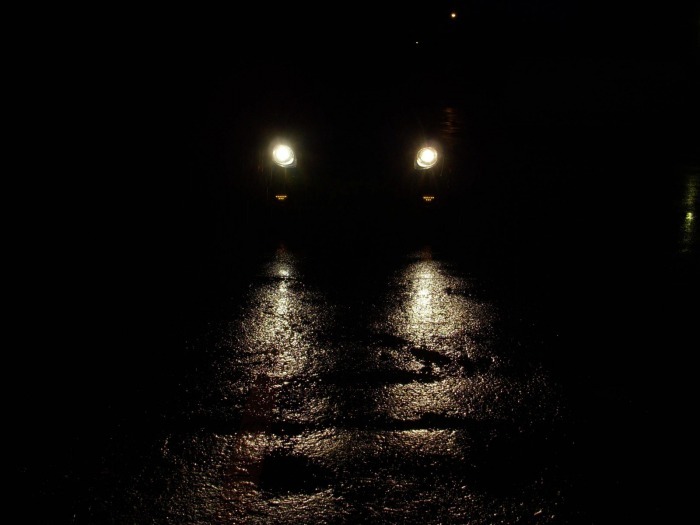 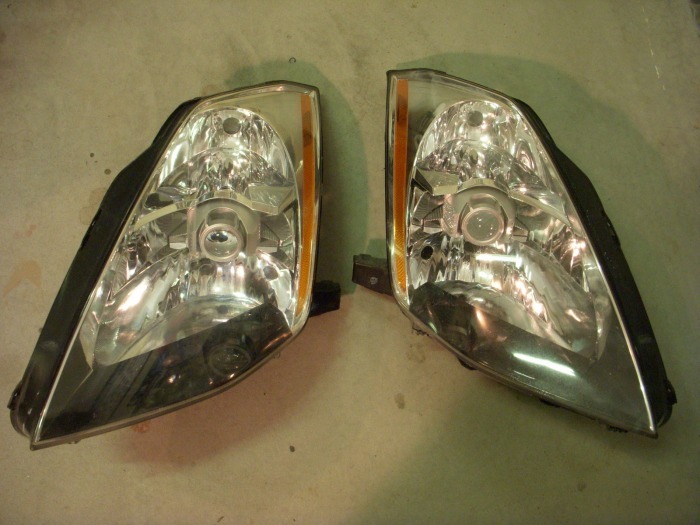 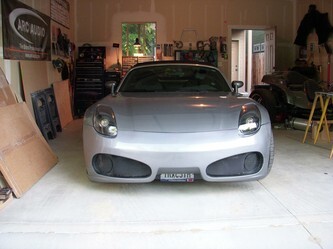 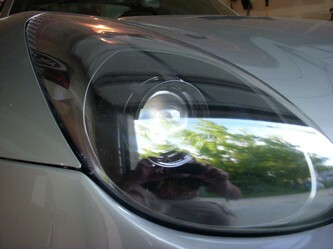 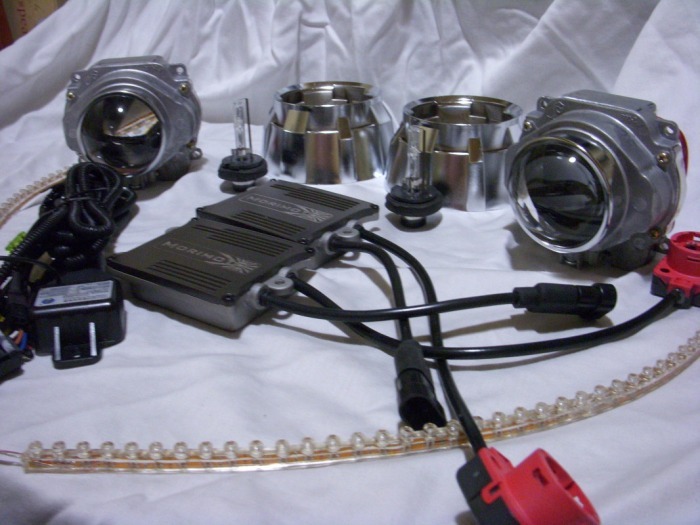 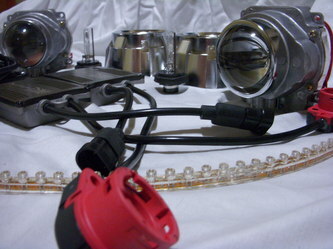 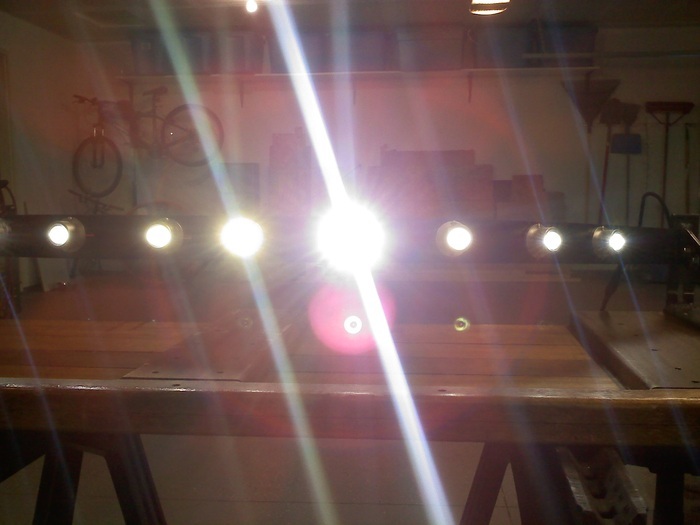 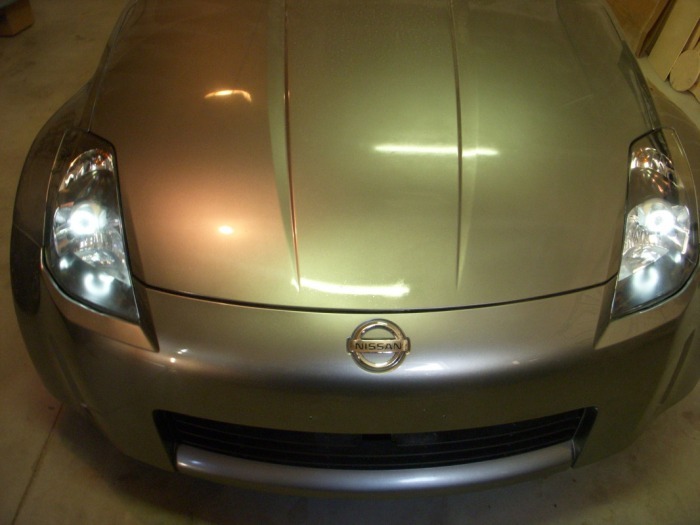 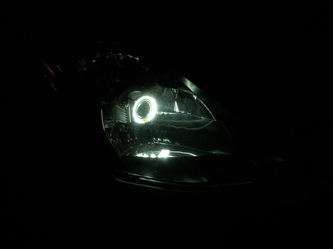 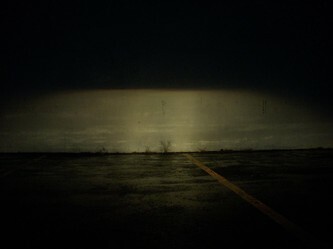 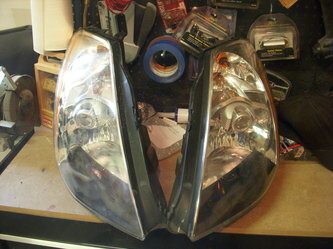 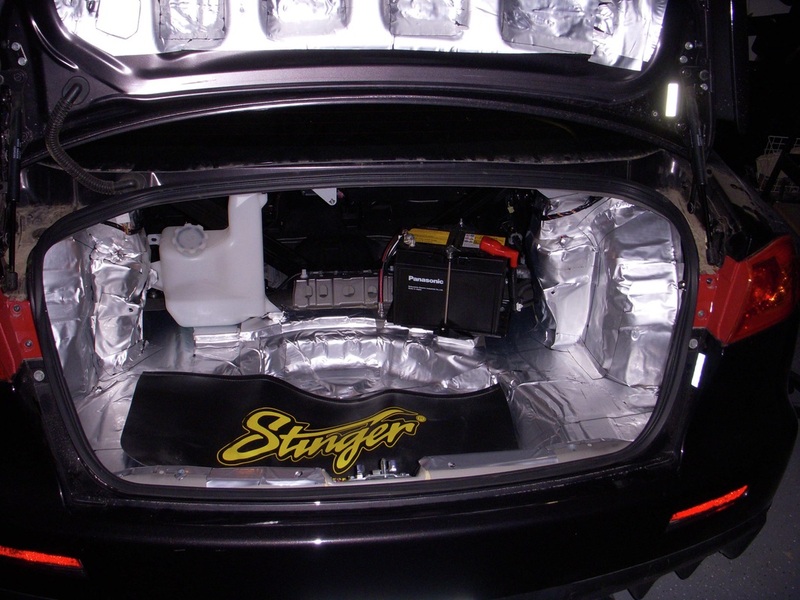 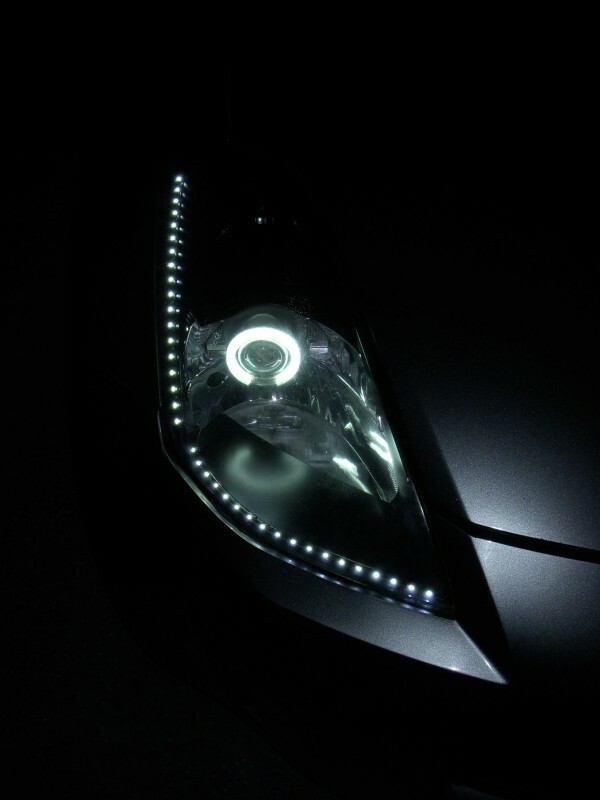 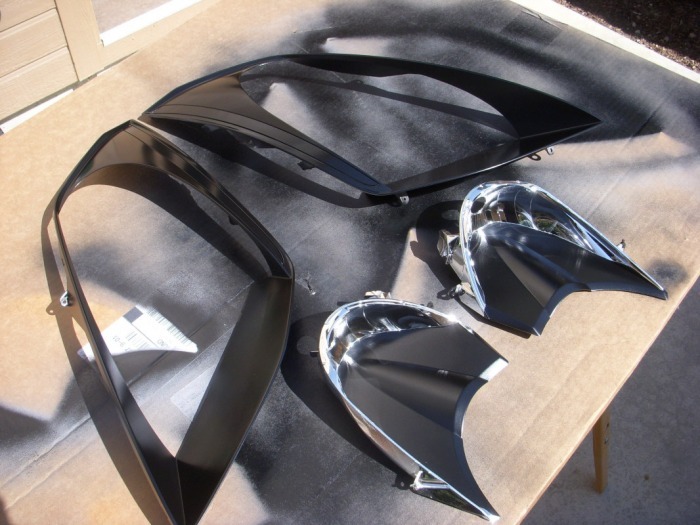 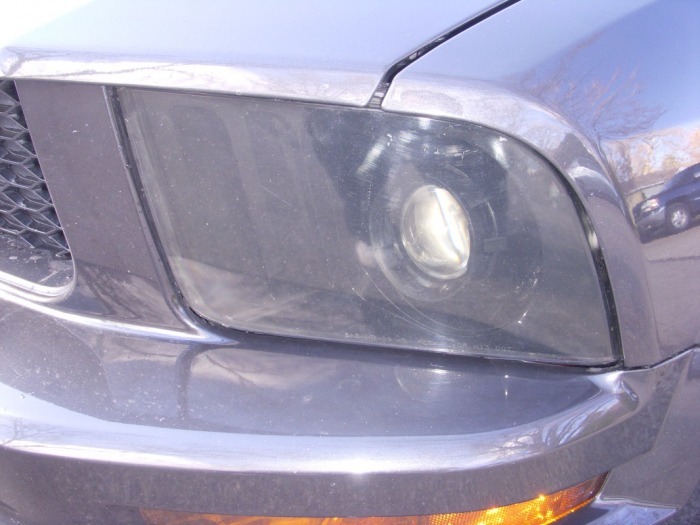 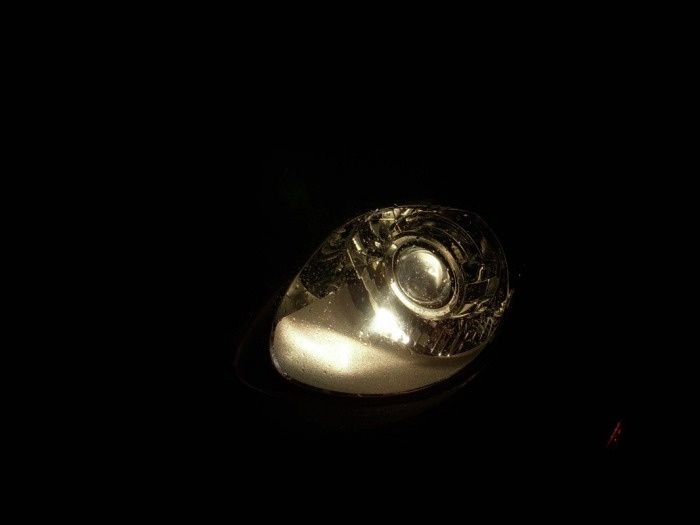 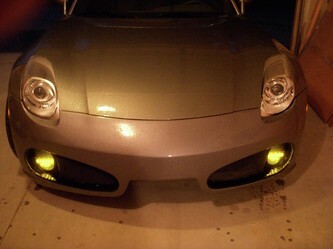 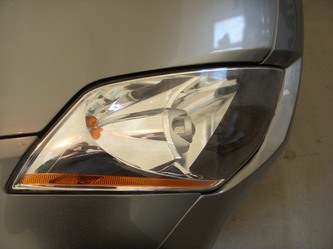 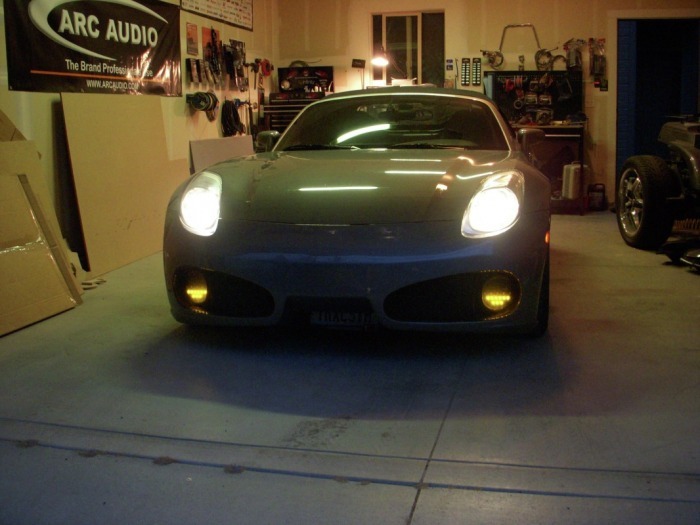 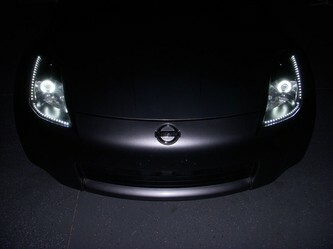 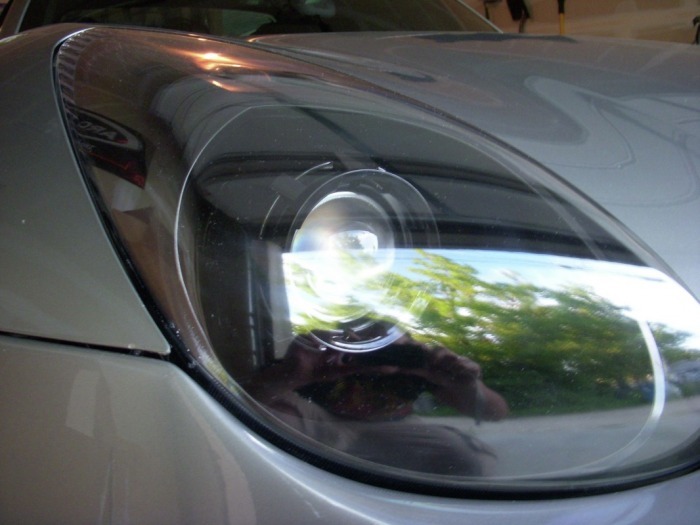 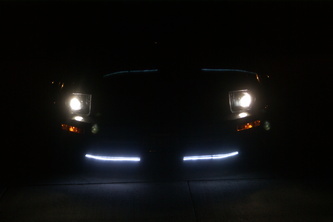 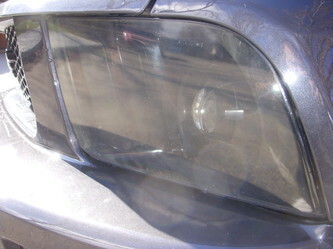 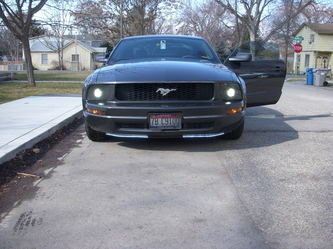 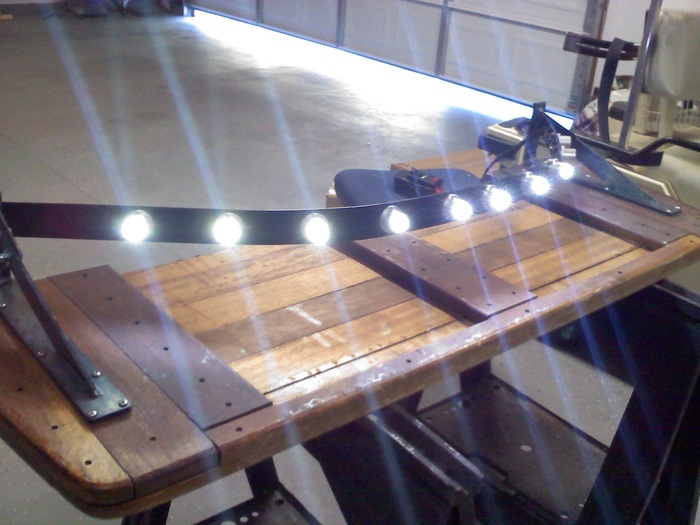 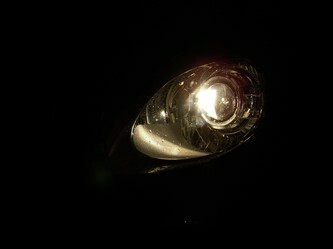 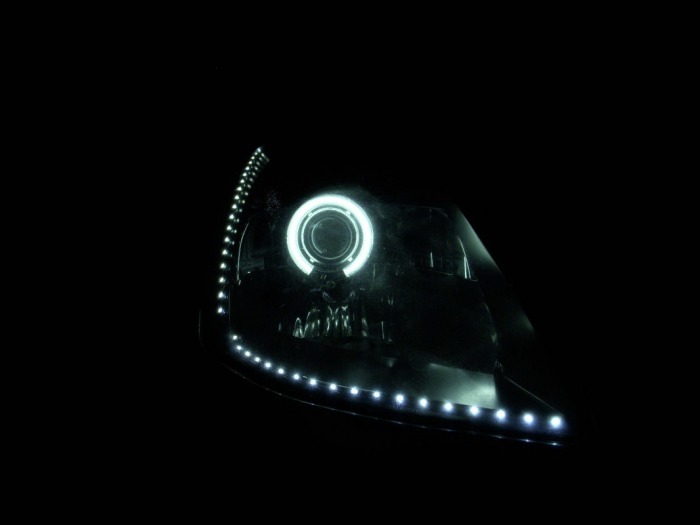 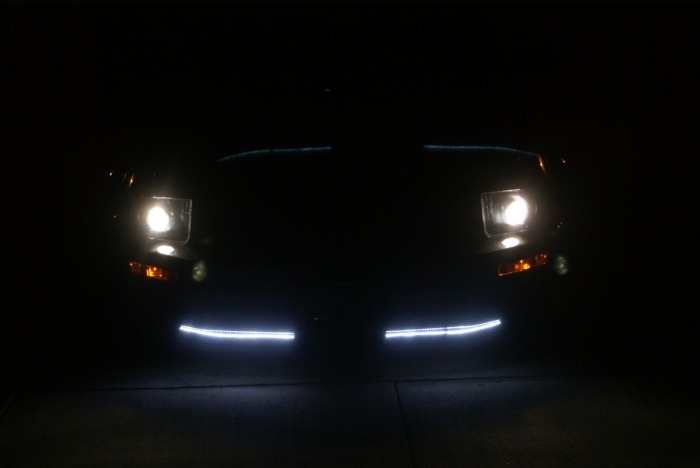 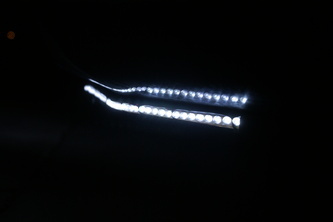 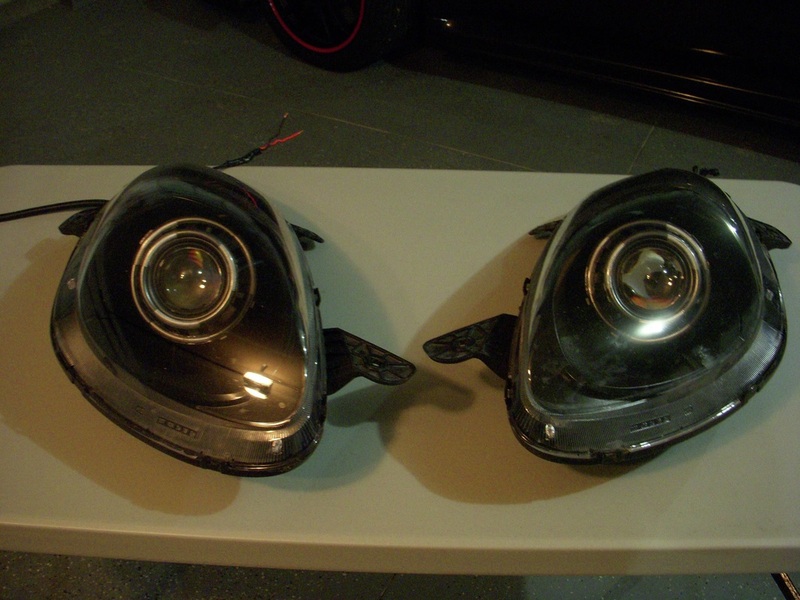 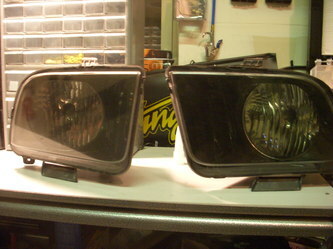 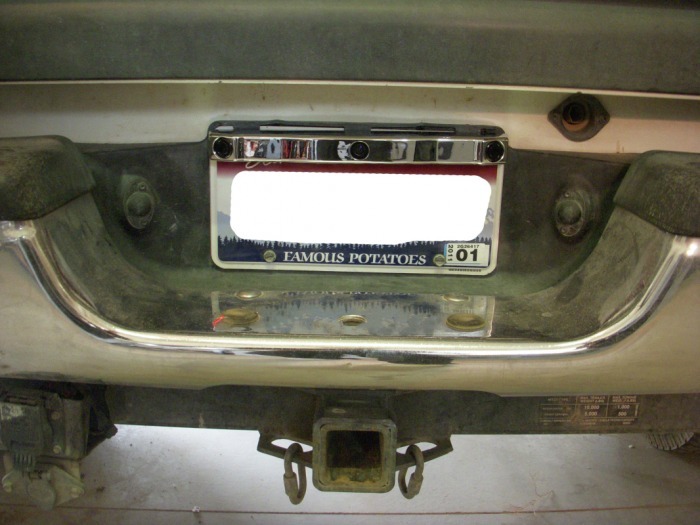 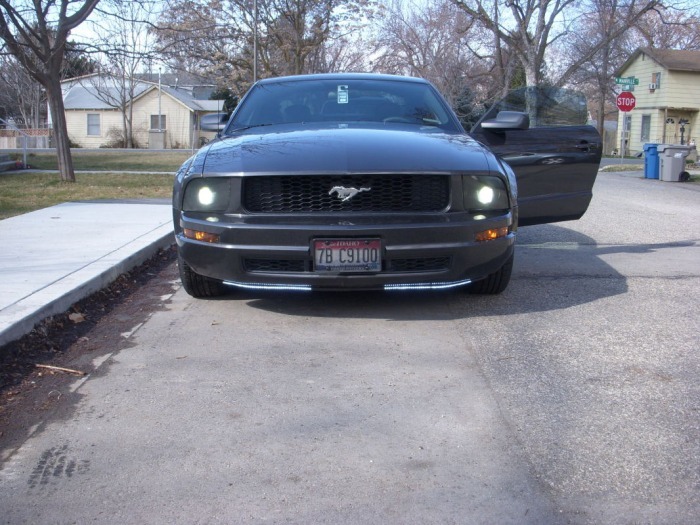 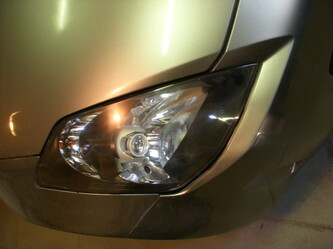 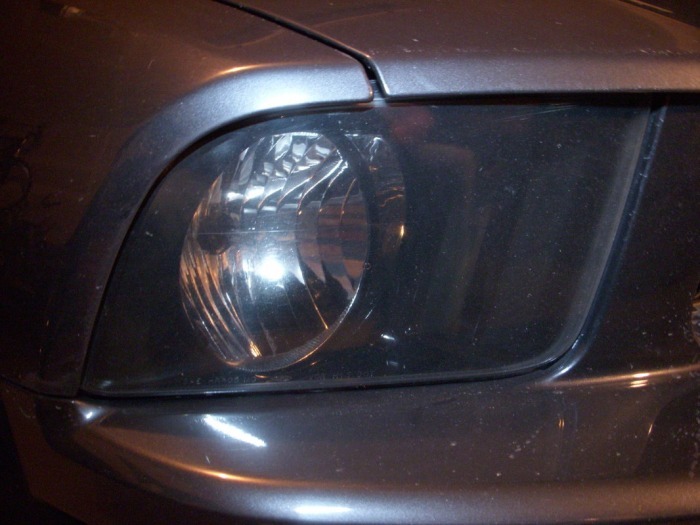 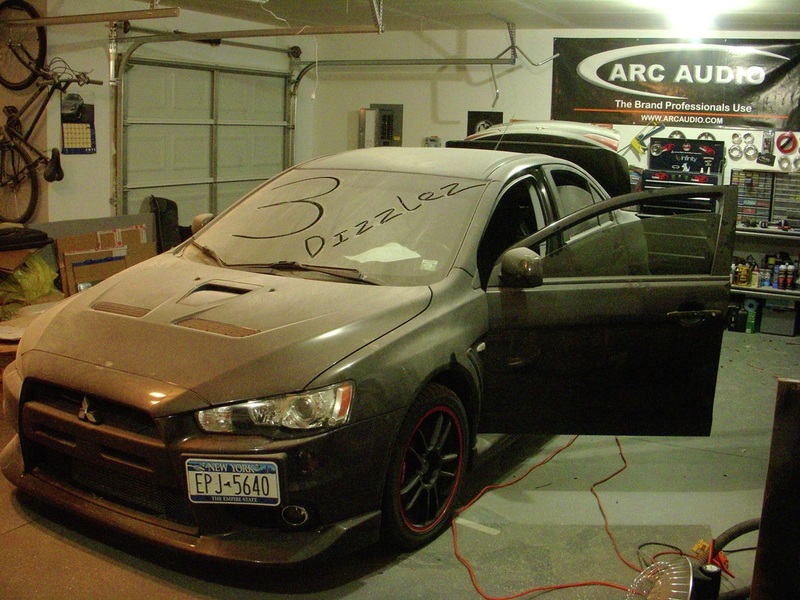 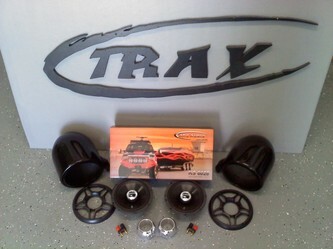 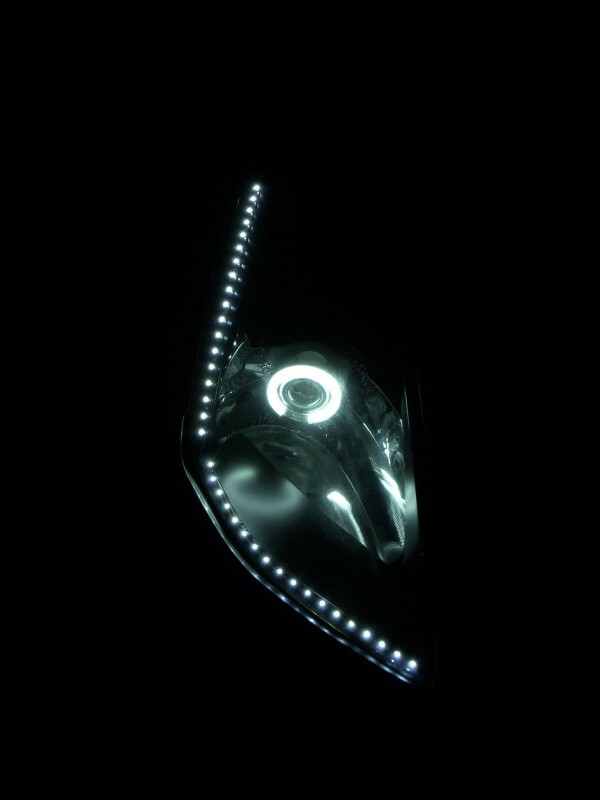 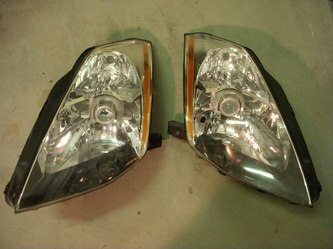 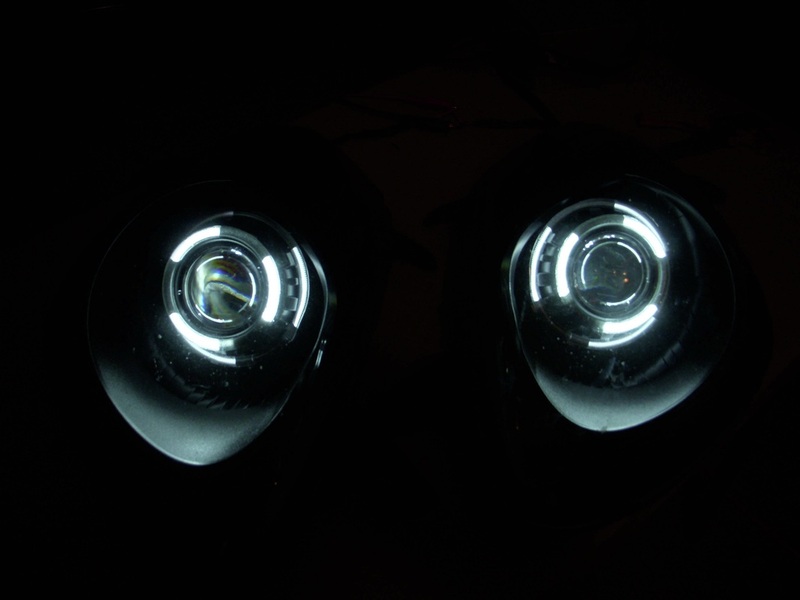 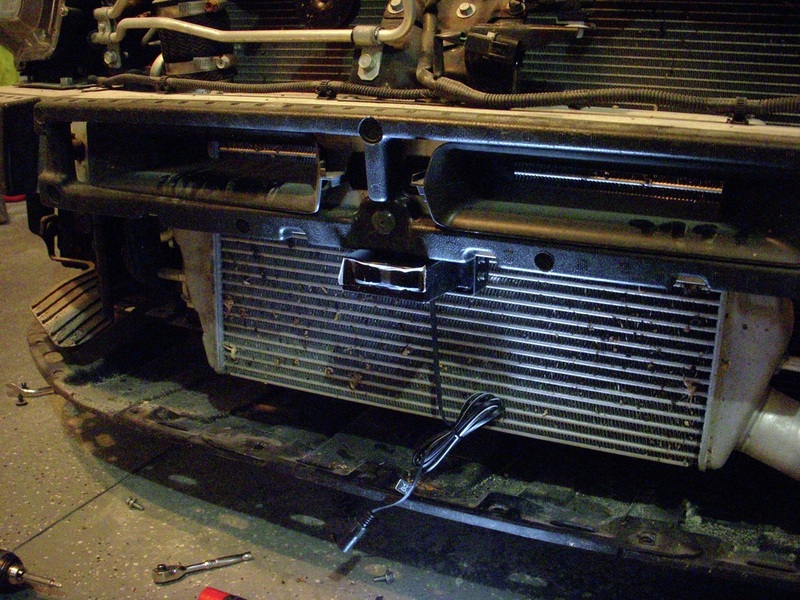 Need brighter, safer lights while providing a finishing touch to an already amazing project car. 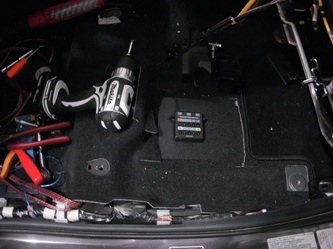 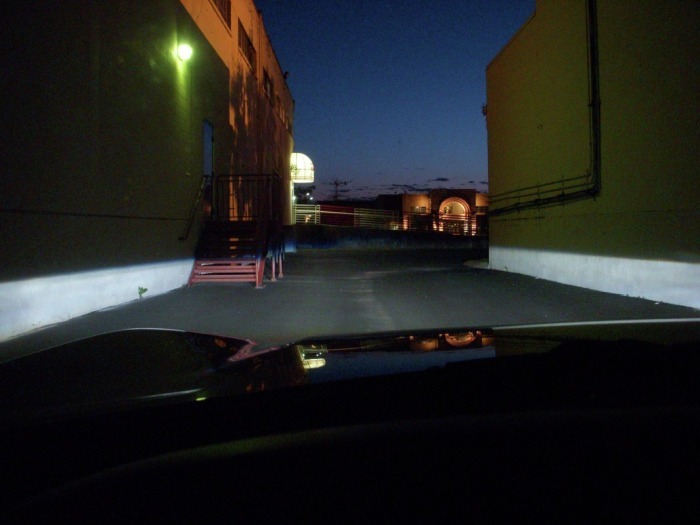 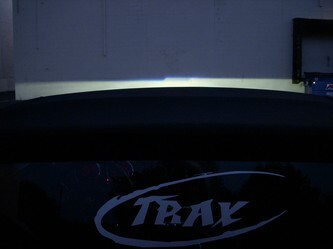 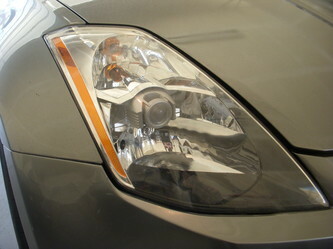 FX-R Hybrid Bi-Xenon Projectors with Gatlin Gun Shroud and RetroSolutions Halo lights installed behind them. 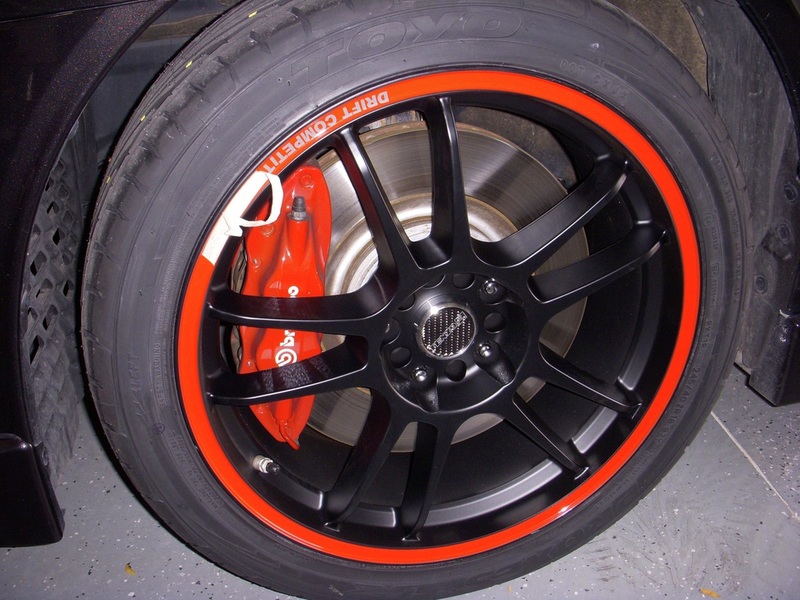 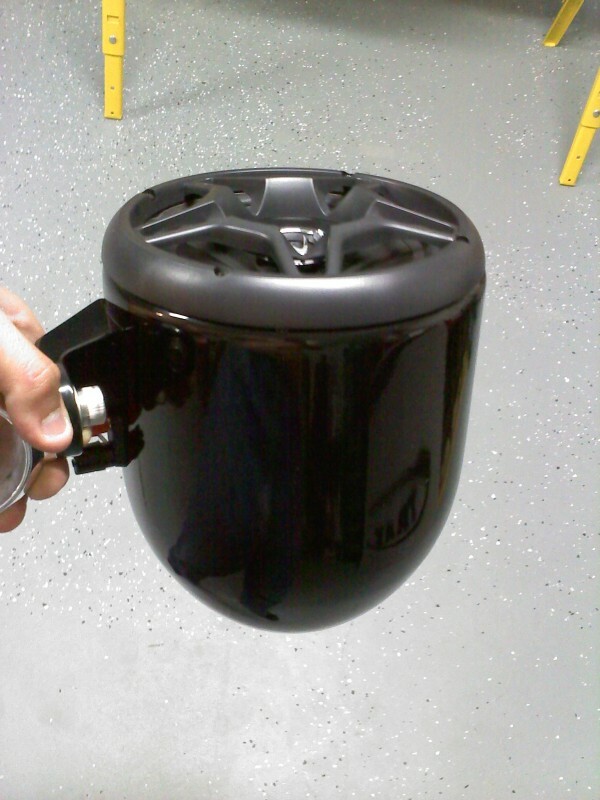 All painted black to match vehicle. 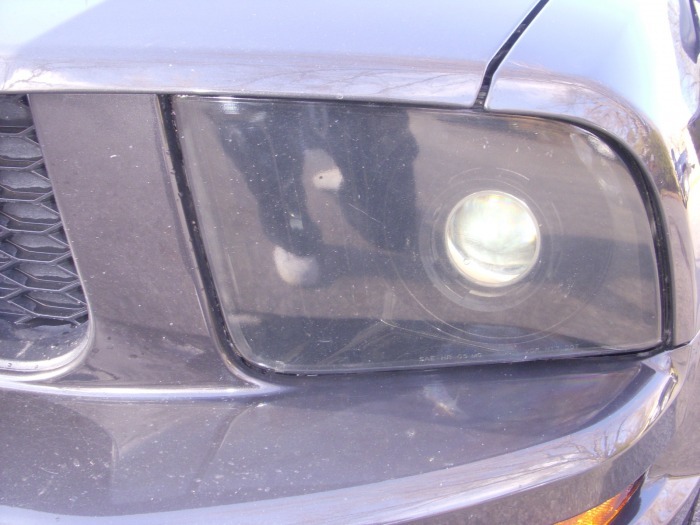 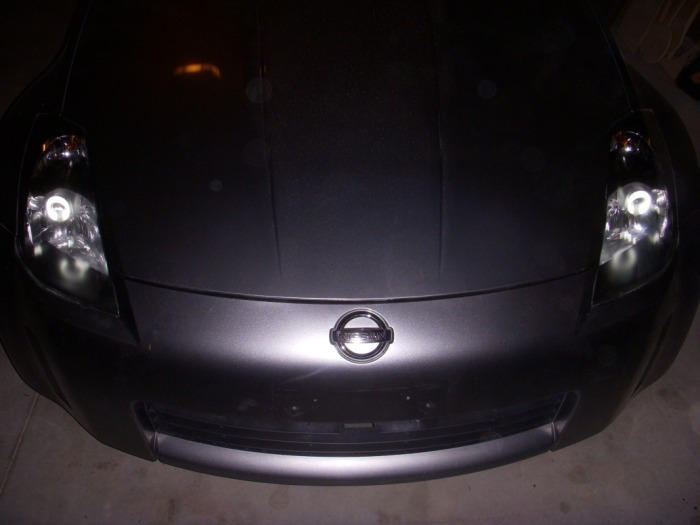 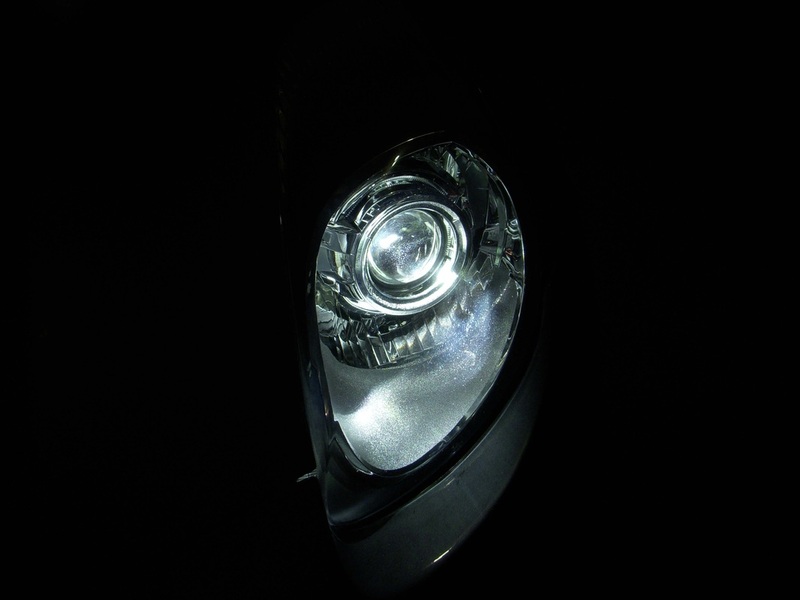 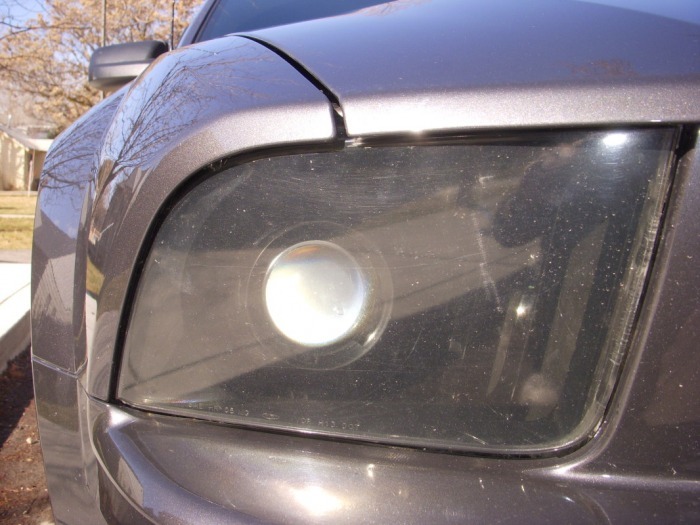 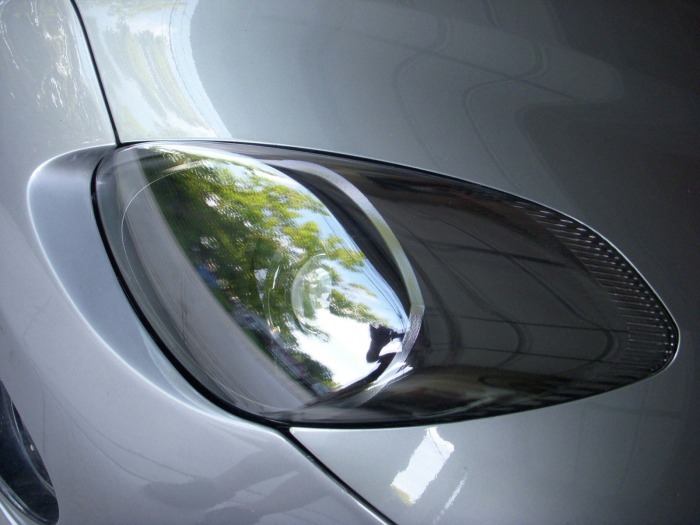 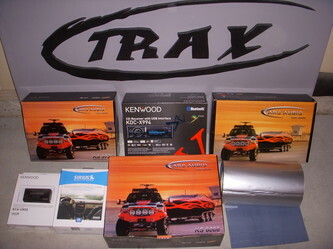 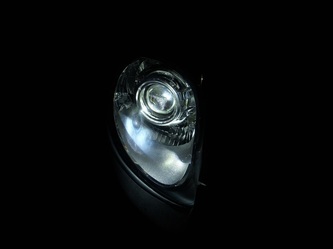 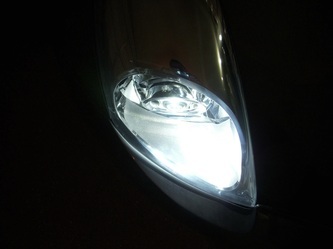 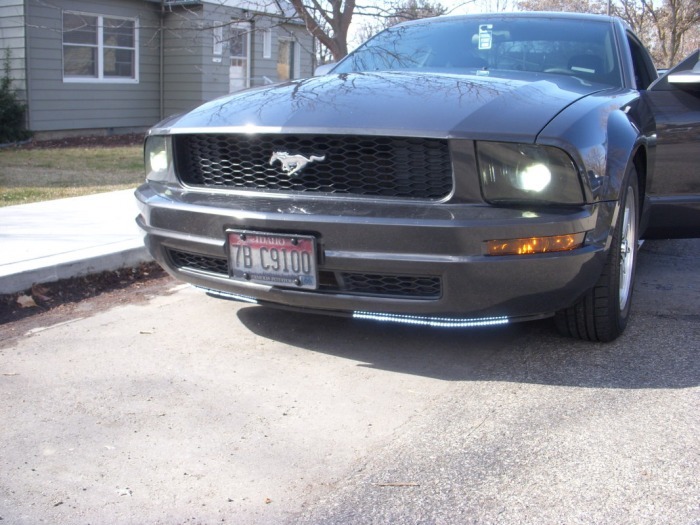 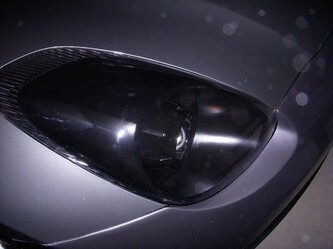 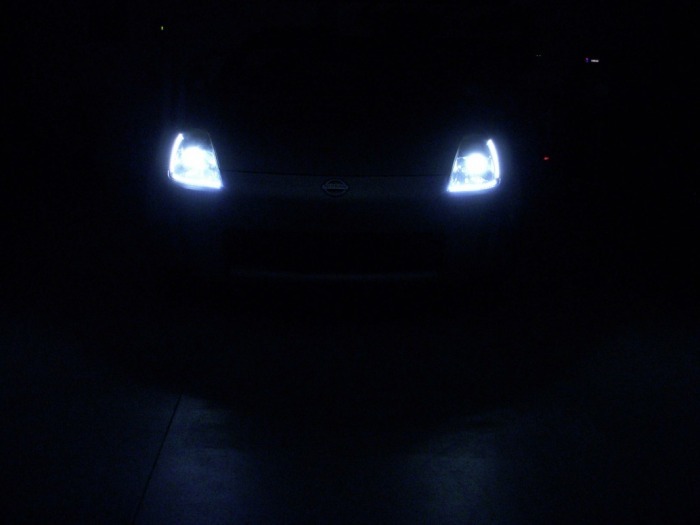 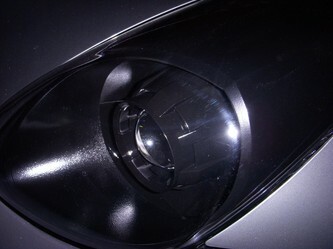 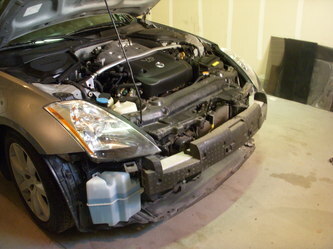 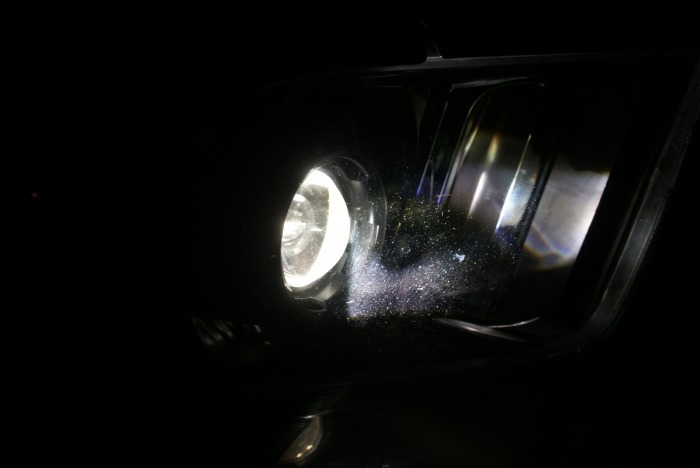 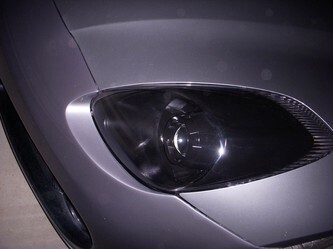 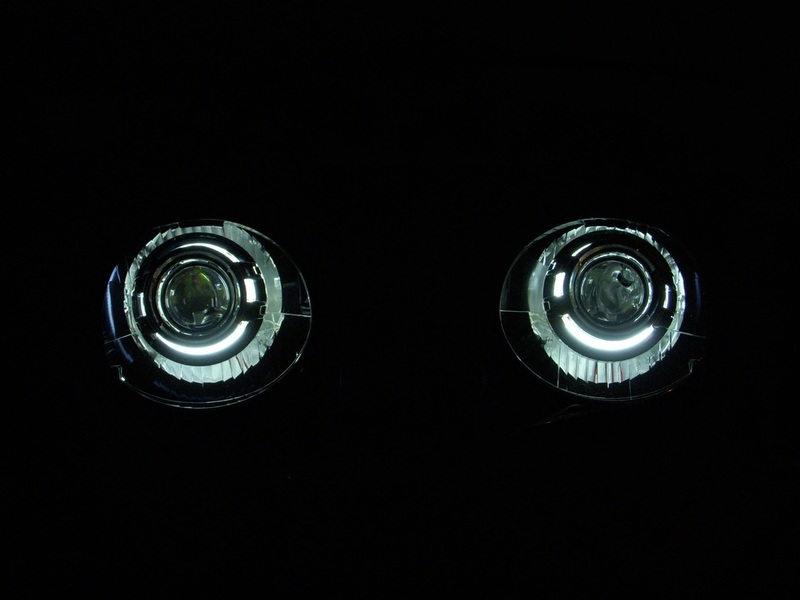 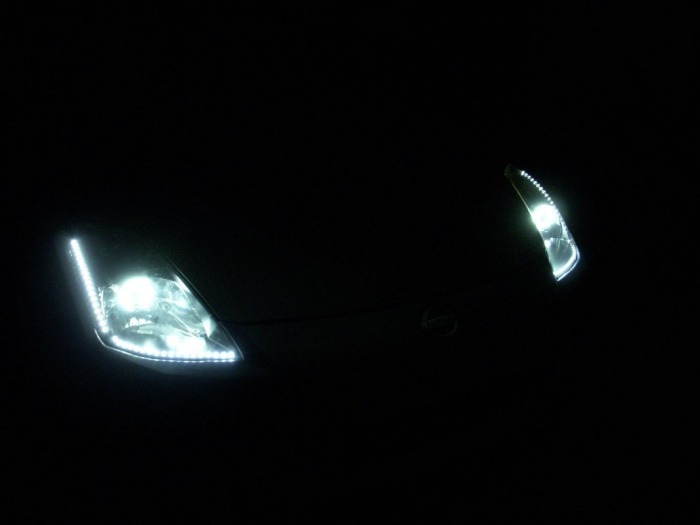 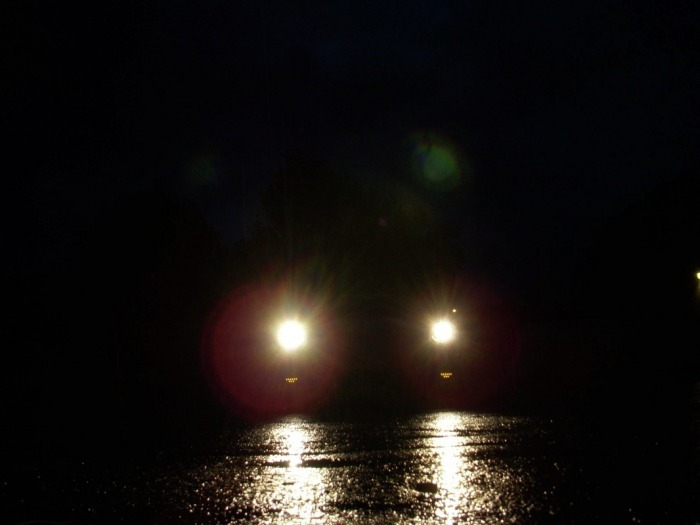 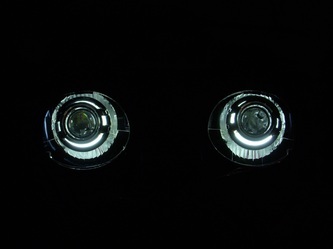 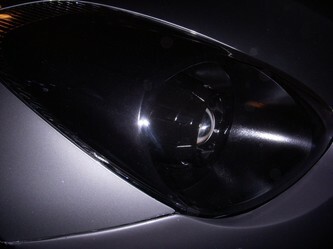 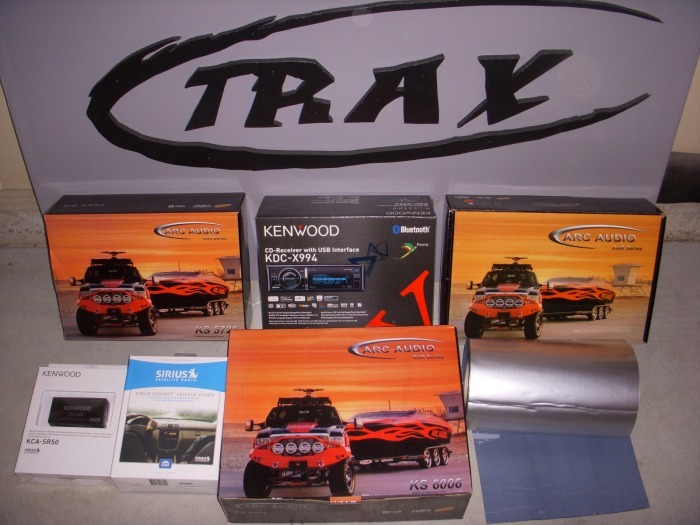 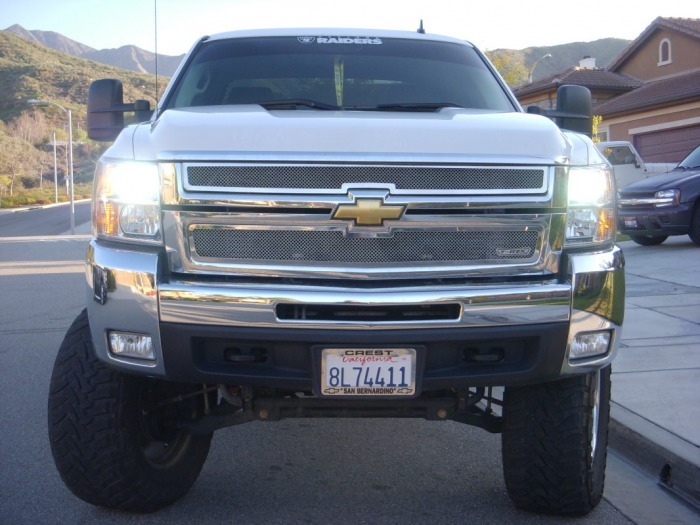 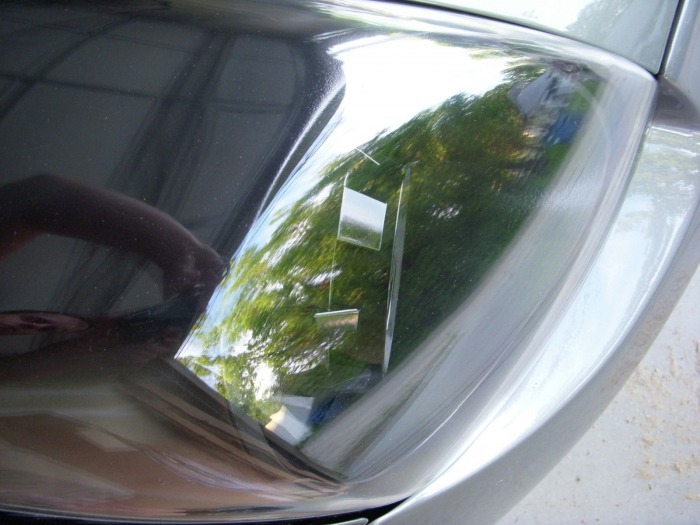 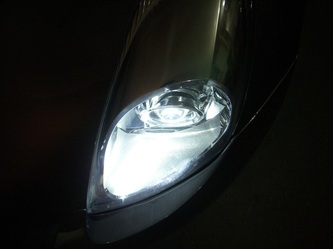 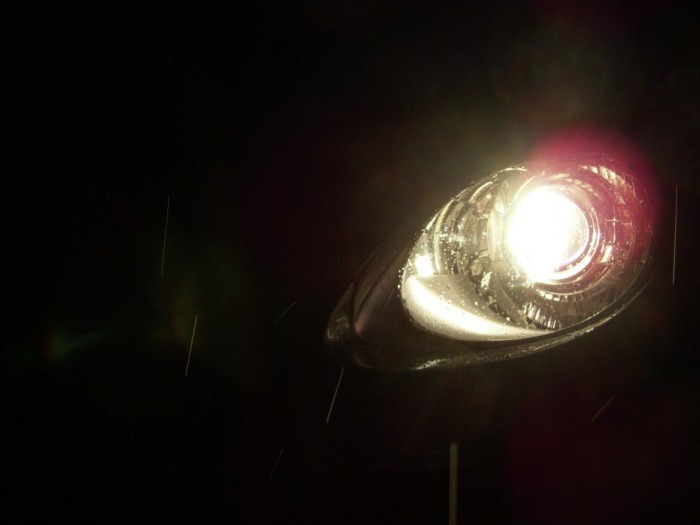 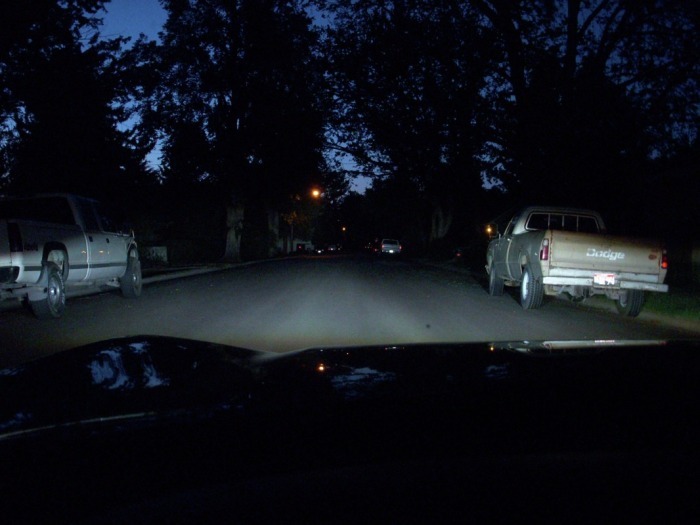 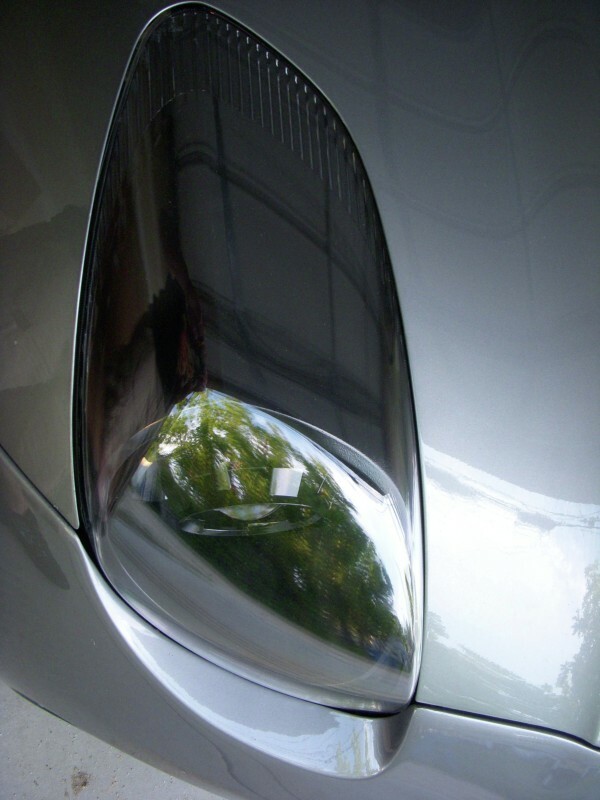 Need Headlights that have new technology in them, look stock, perform like higher-end cars, and can be upgraded to aftermarket HID kits in the future. Oh ya, and they need to be 100% True Plug n Play....install in less than 10 mins. 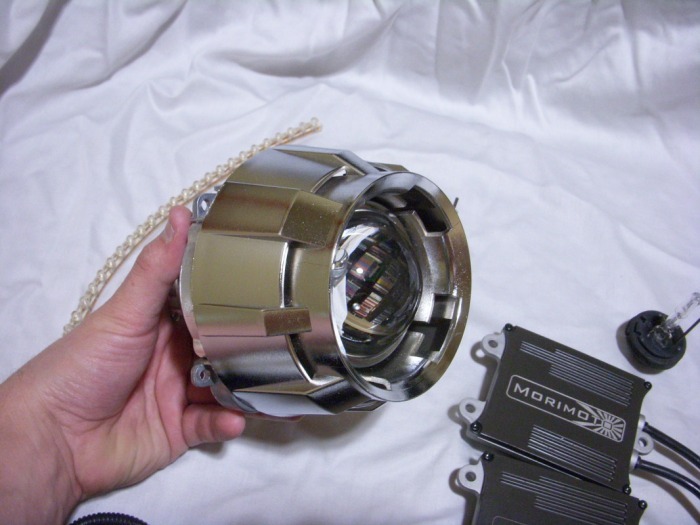 Morimoto Mini H1 Bi-Xenon Projectors, Apollo Chrome Shroud to cover everything up, Silvania SilverStar H1 Halogen Bulbs, World's First Custom Made One-Off 100% Plug n Play Bi-Xenon Harness for the Pontiac Solstice. 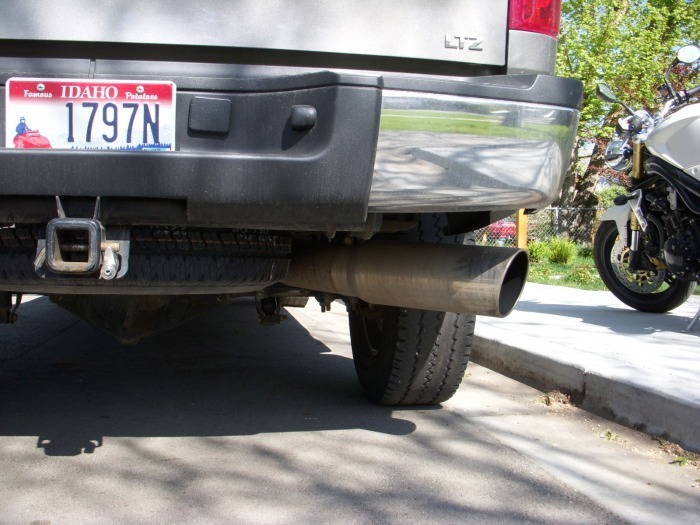 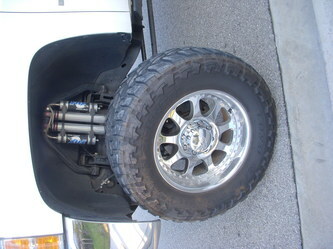 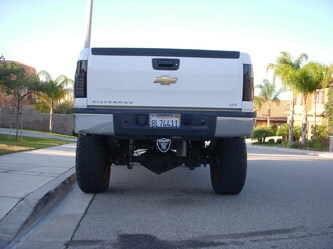 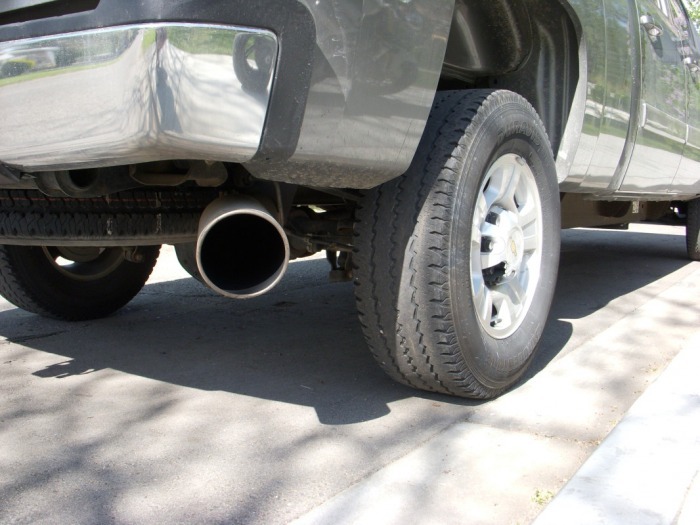 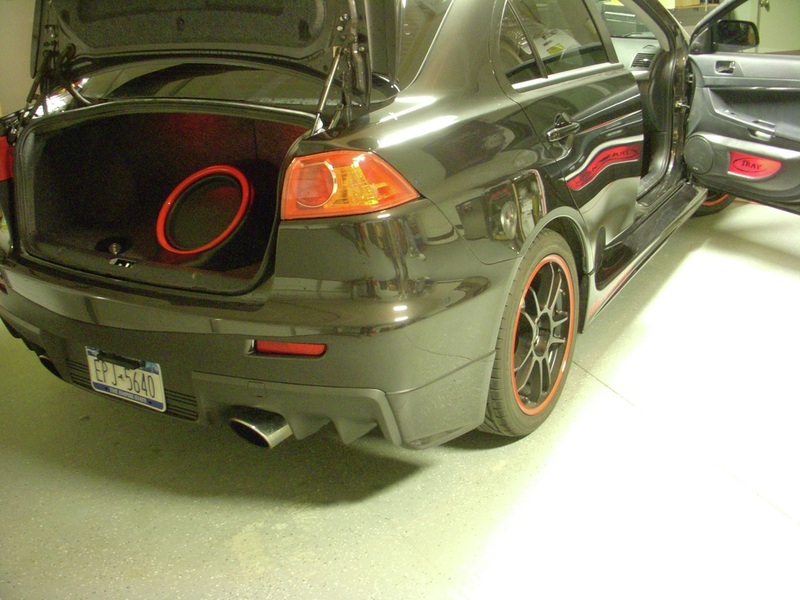 5" MBRP Exhaust with DPF Delete, EFI Live Custom Tune to factory ECM for more power and better gas mileage. 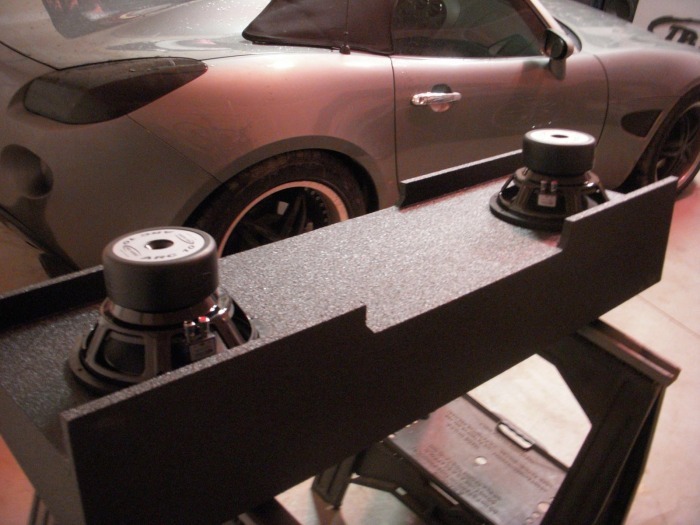 MTX Monoblock Amplifier, (2) 12" MTX Subwoofers in a custom made rhino coated box. 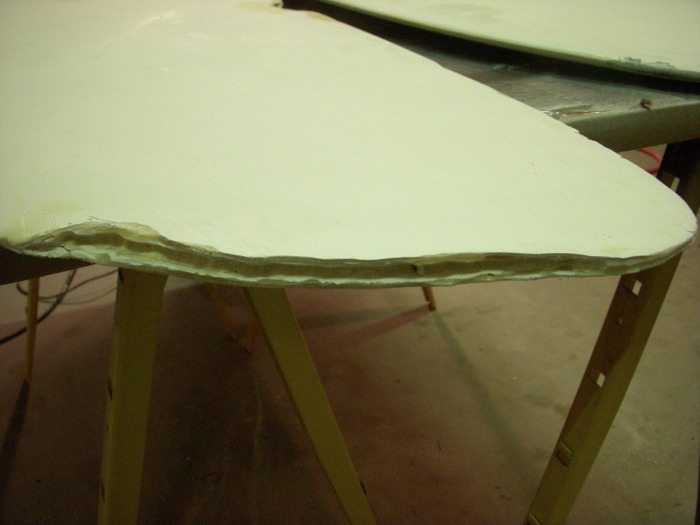 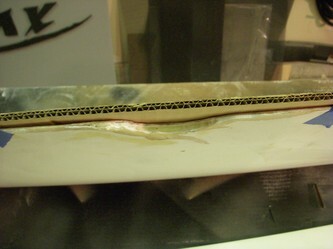 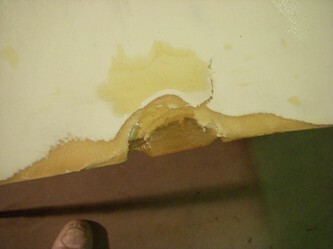 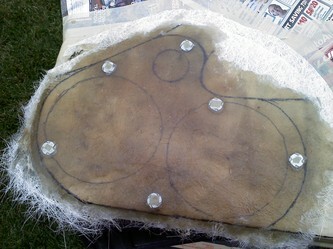 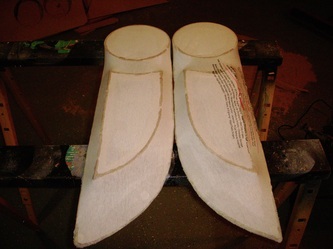 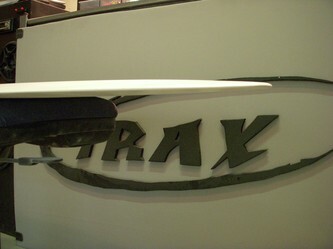 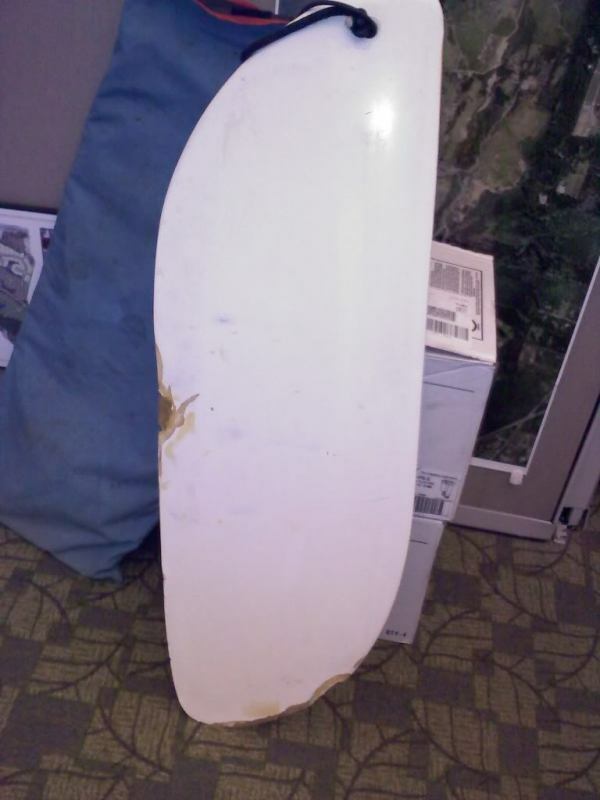 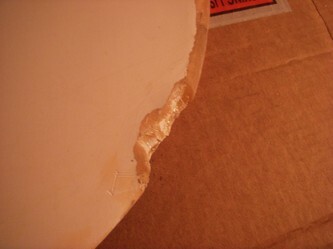 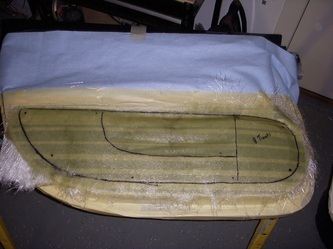 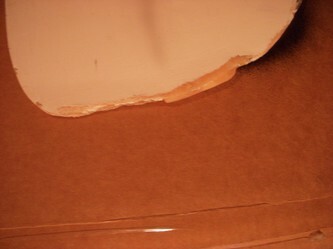 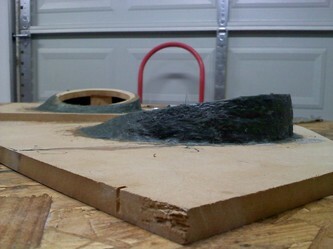 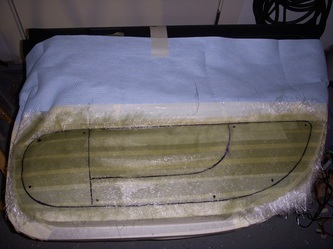 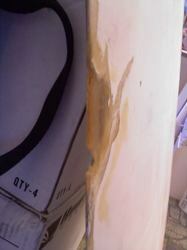 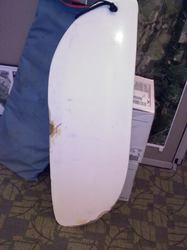 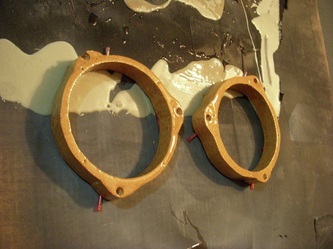 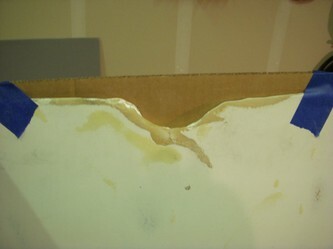 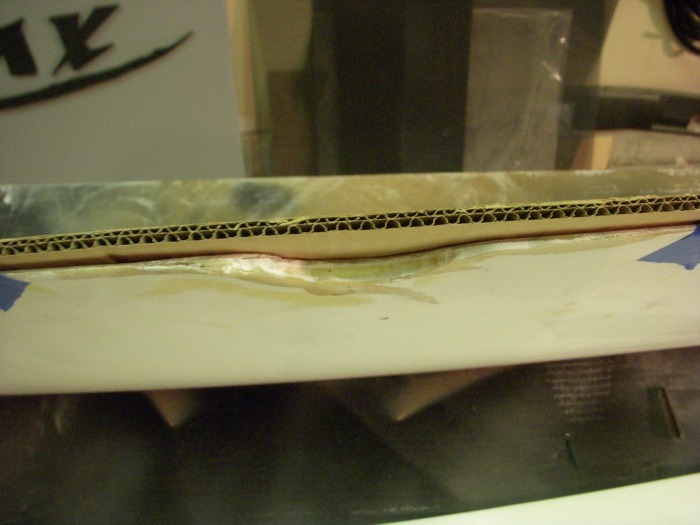 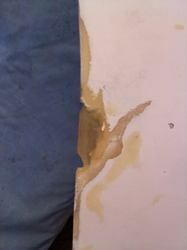 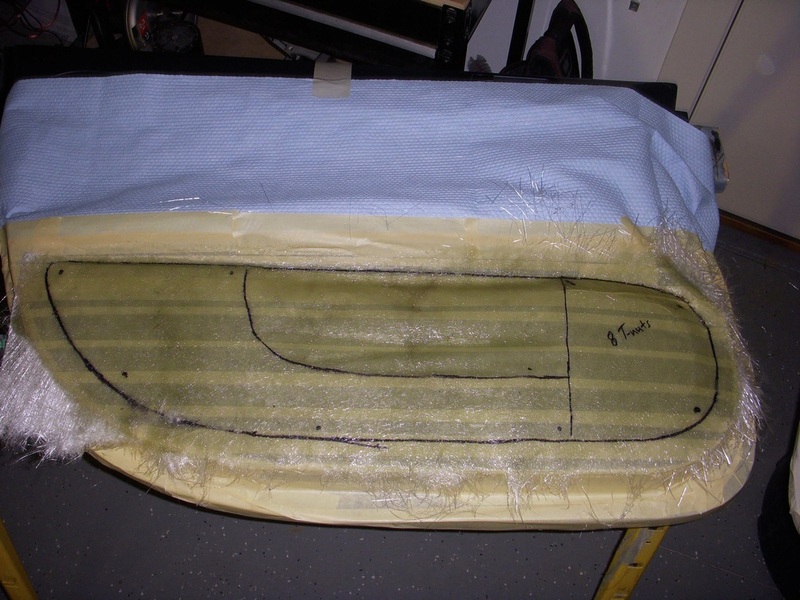 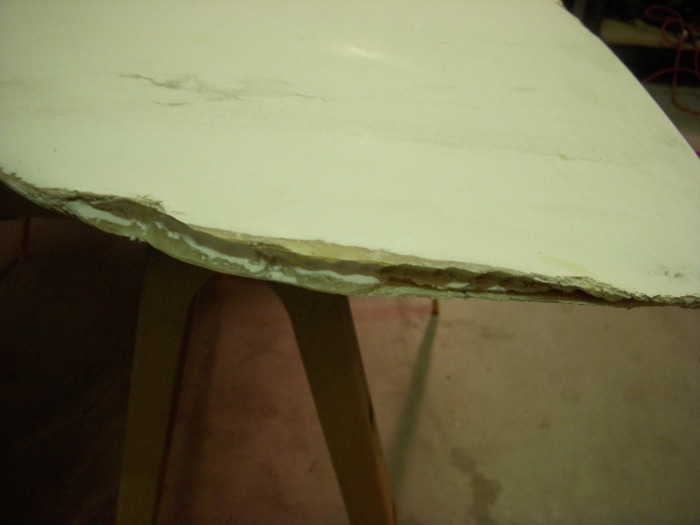 Damaged Dagger Boards for a Sail Boat. 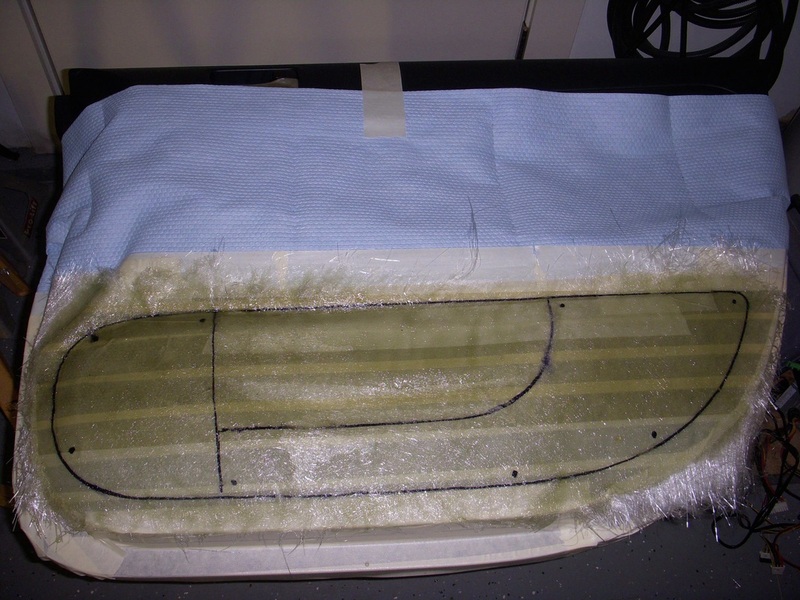 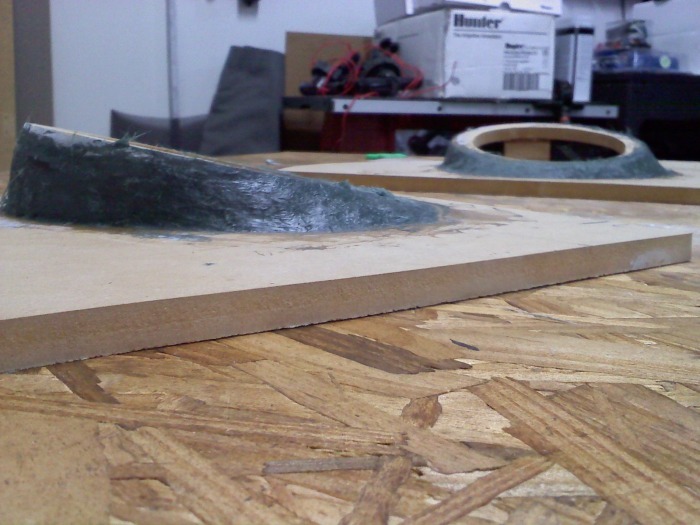 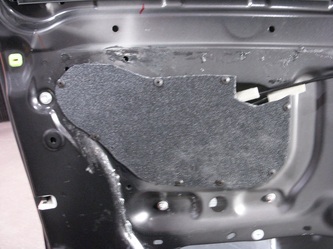 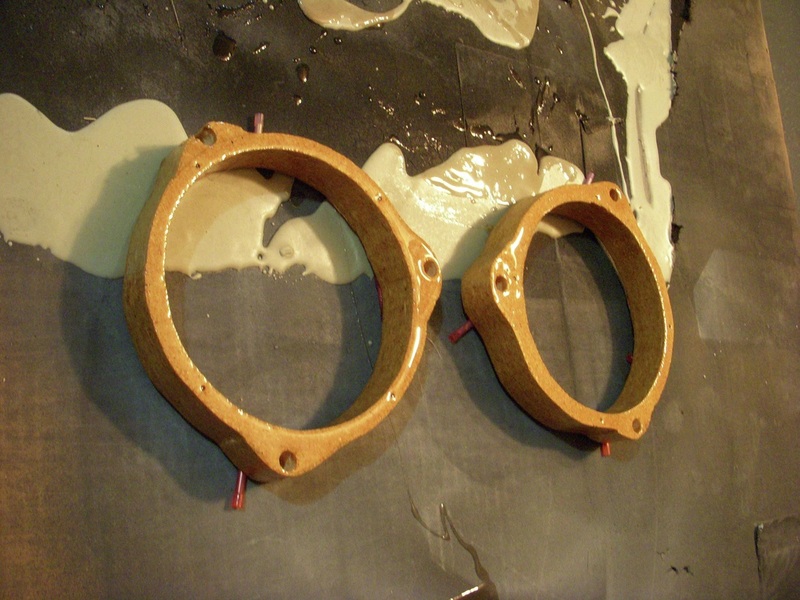 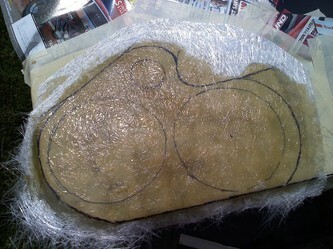 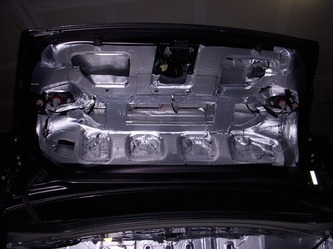 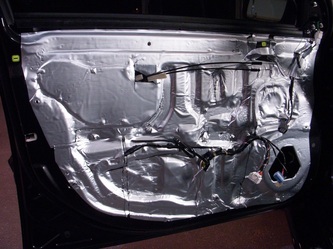 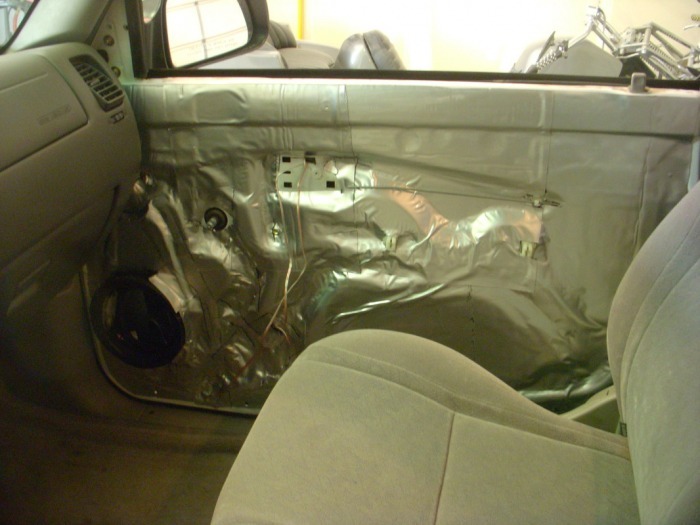 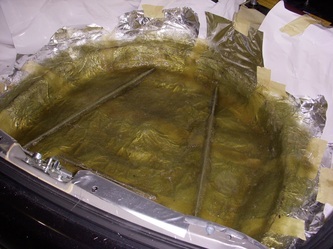 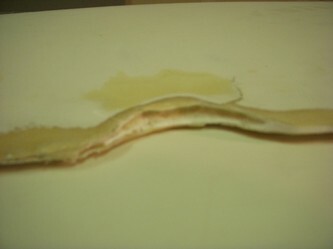 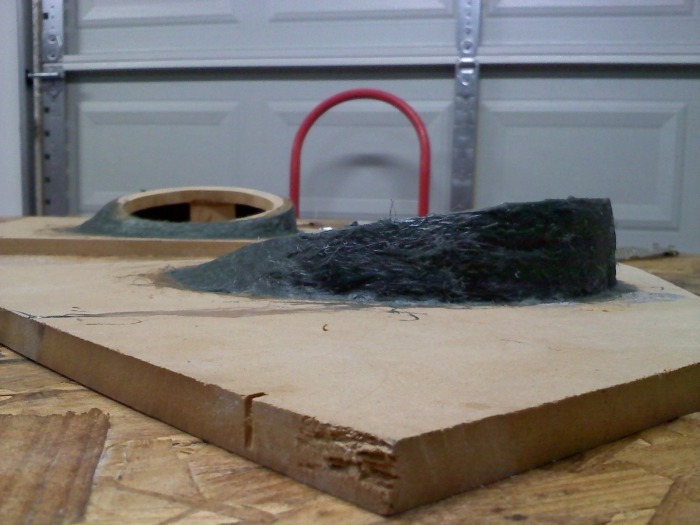 Fiberglass and Fiberglass reinforced body filler were the key ingredients. 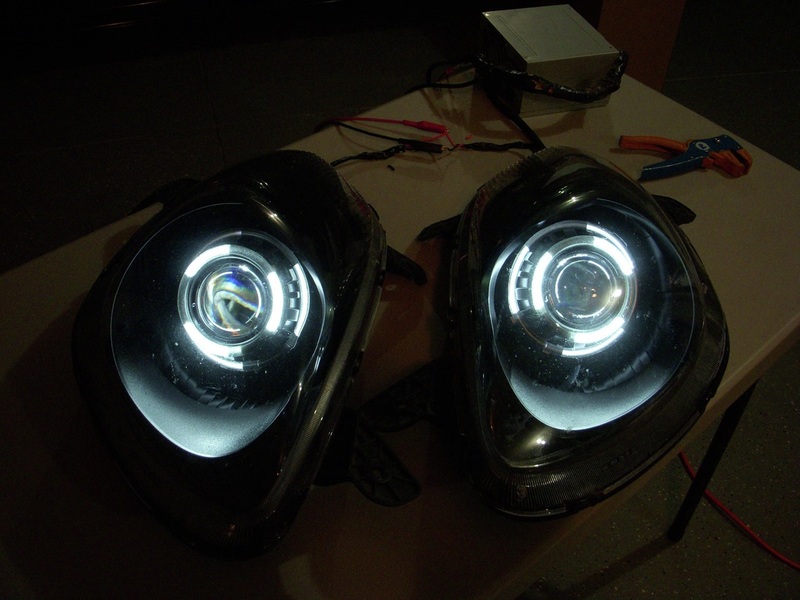 Version 2: Bigger/Brighter Halos, LED lights inspired by R8, more chrome painted. This has to be a tail-gating machine. Video, bass, and bling! 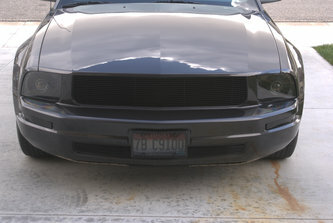 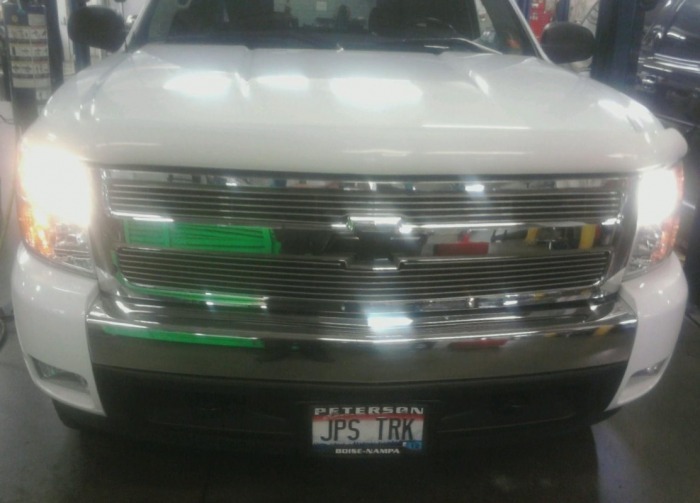 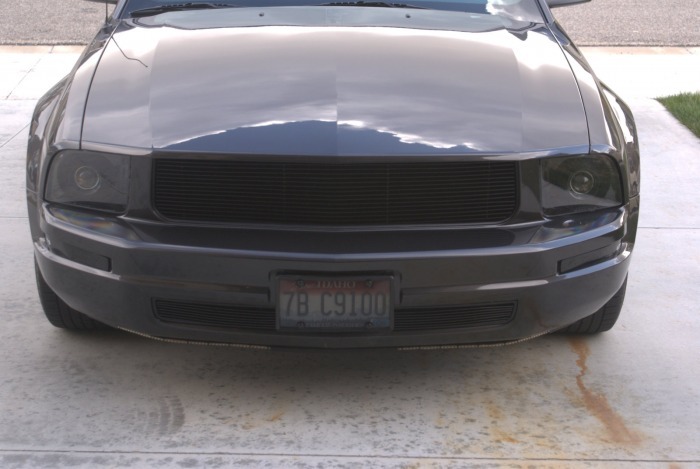 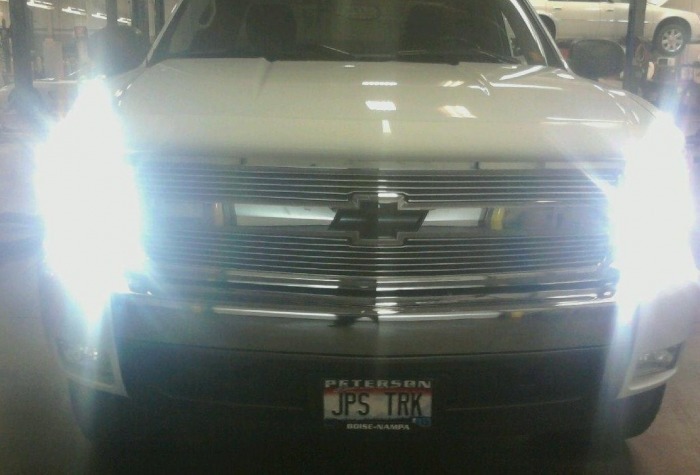 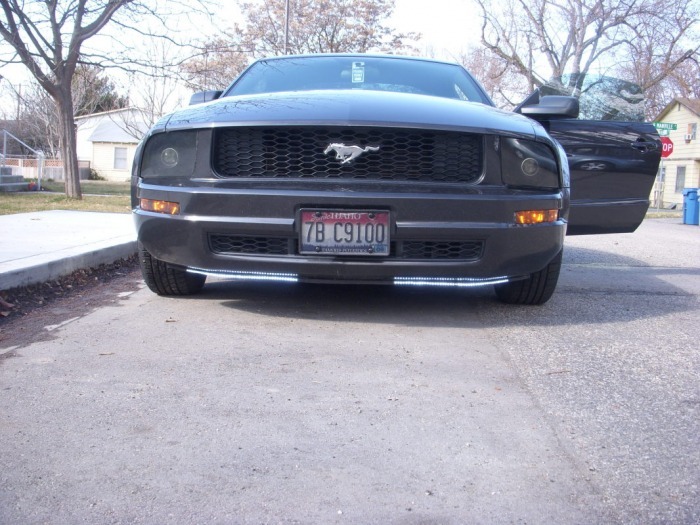 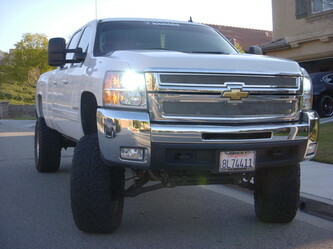 HID low and high beams, billet grill, and smoked LED taillights. 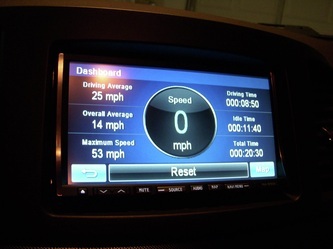 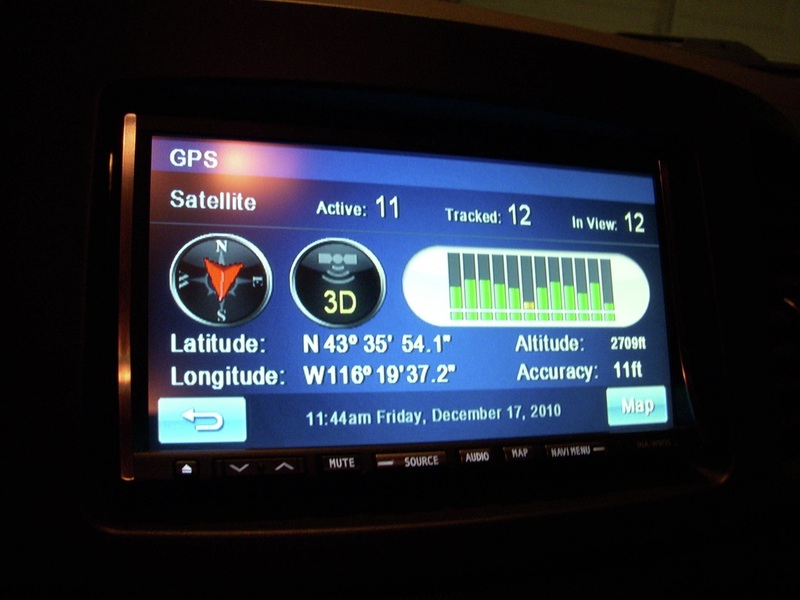 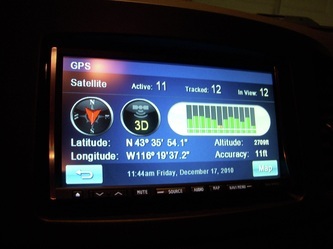 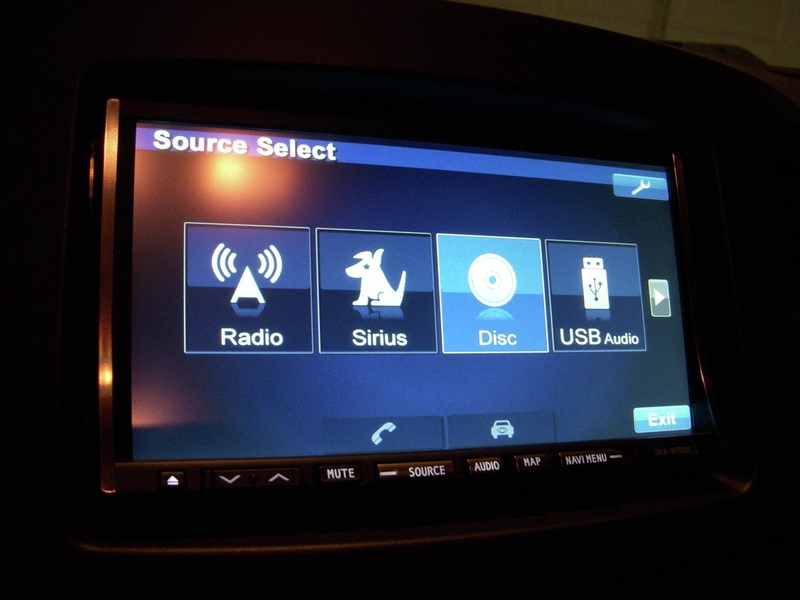 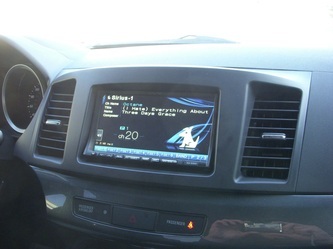 Alpine 7" Touchscreen, Satellite Radio, iPod, and Navigation controls. Arc Audio 500 watt amp pushing (2) Arc Audio 10" Subwoofers in a custom rhino lined box under the rear seats. 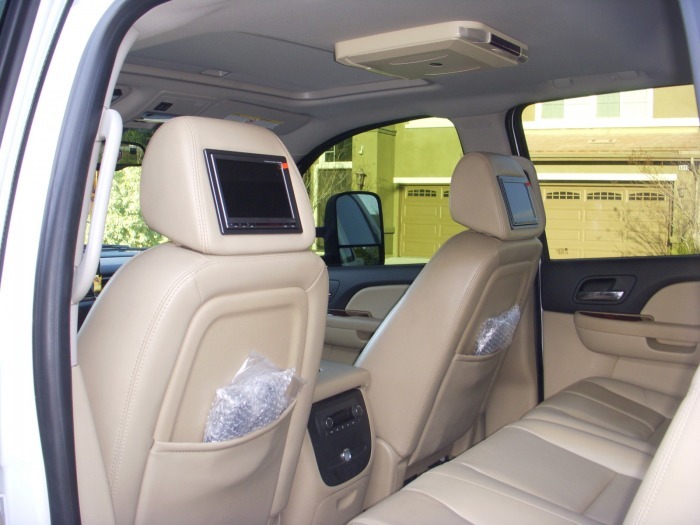 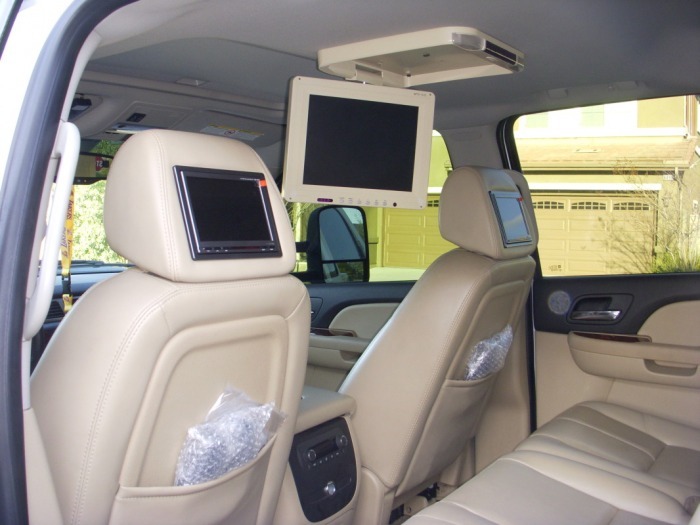 Alpine 7" headrest screens custom mounted in stock headrests, with a 15" Flip Down Overhead Video monitor that matches the interior. 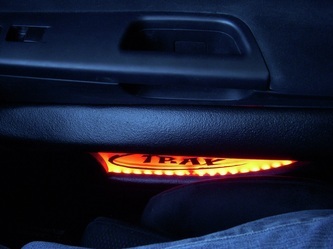 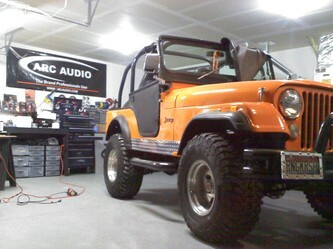 Custom Black Light LEDs under everyones feet to accent the interior at night! Want more bass, higher highs, and clearer sounding system. 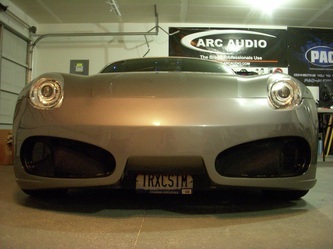 Arc Audio KS 6.5" Component System up Front, in custom made pods to accomodate bigger/better speakers. 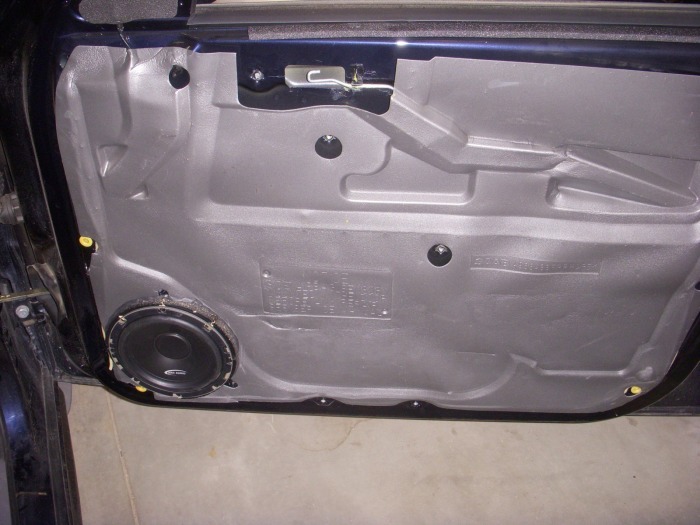 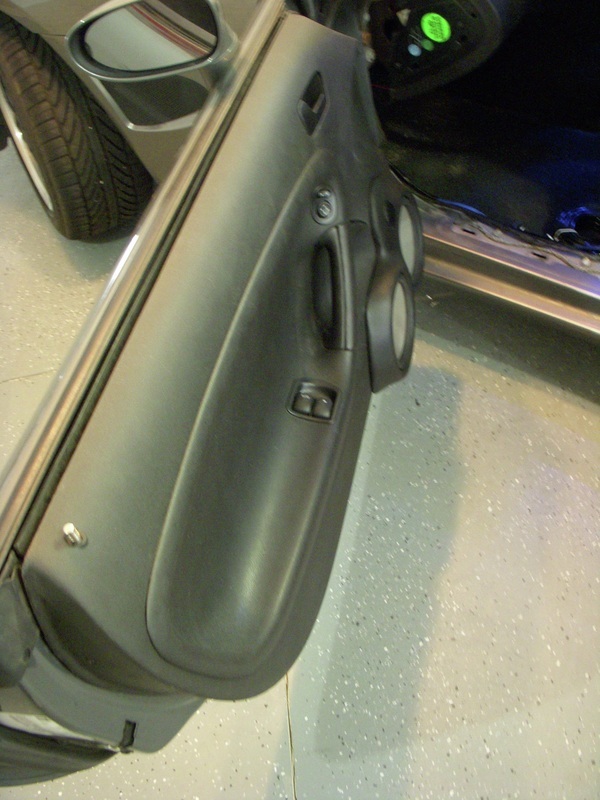 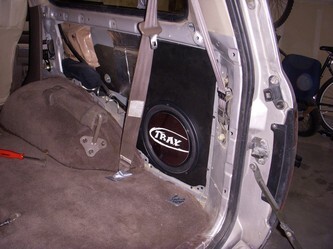 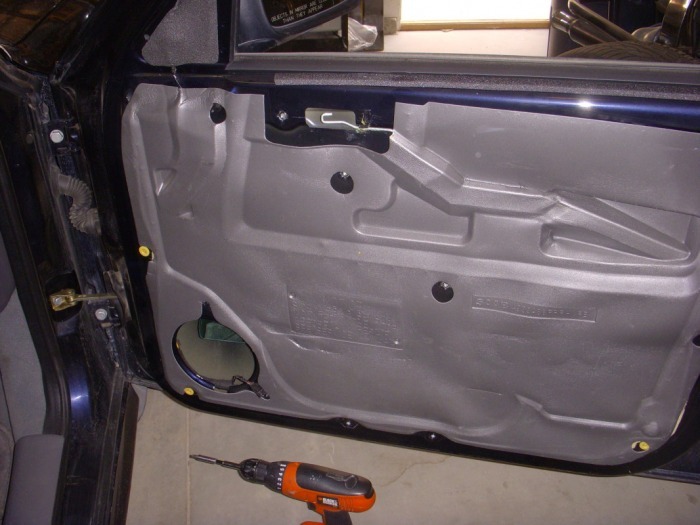 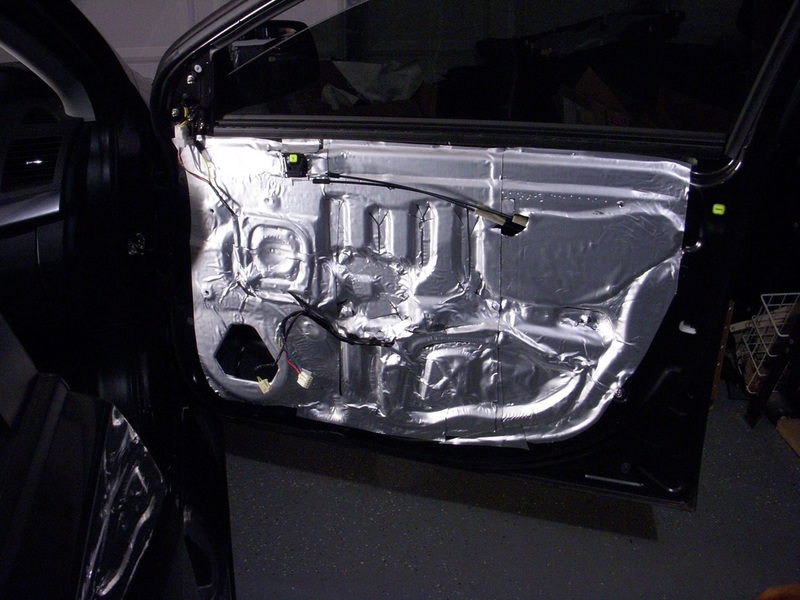 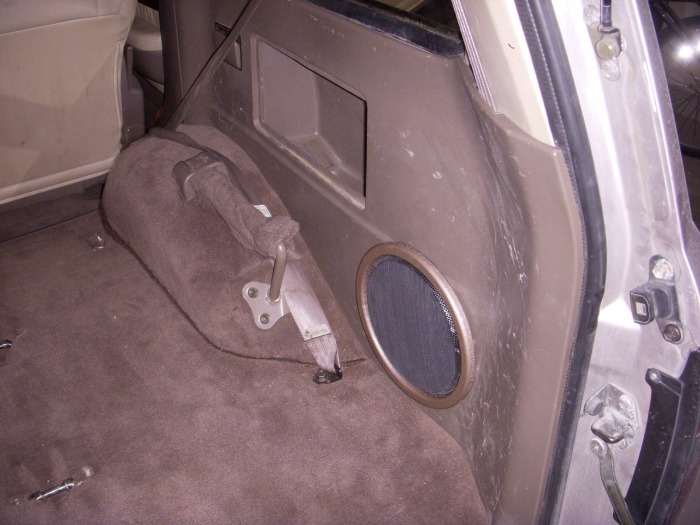 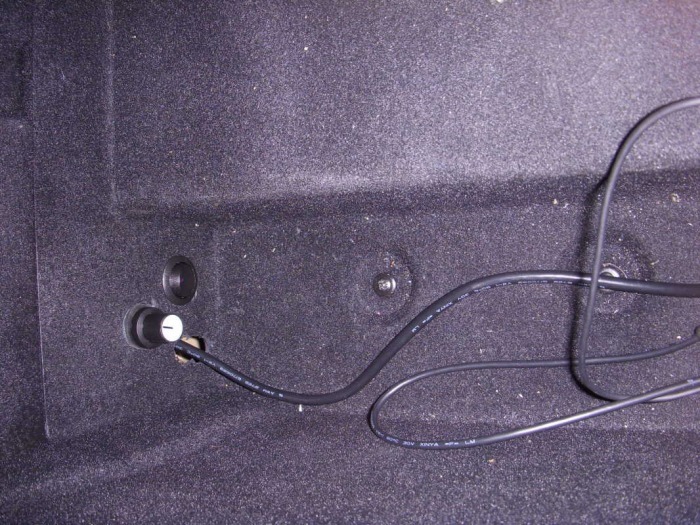 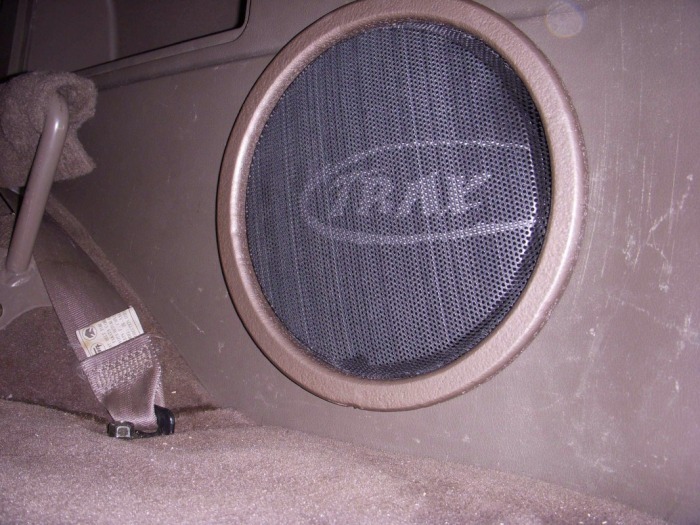 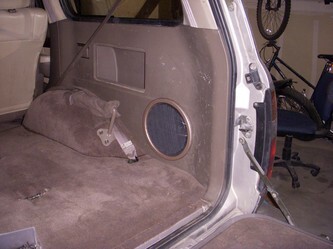 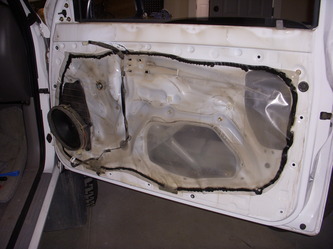 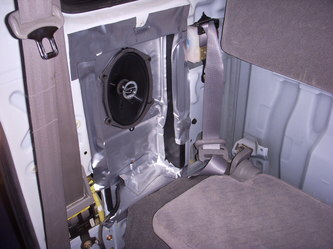 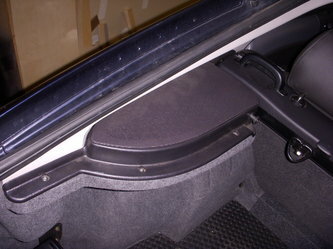 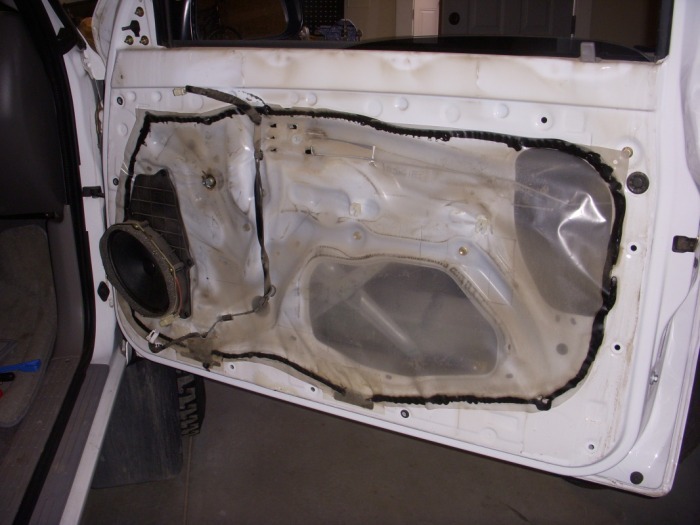 Doors completely sealed shut and completely sound deadened for improve bass response and vibration decrease. 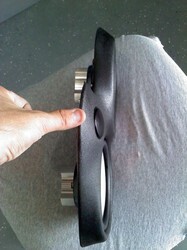 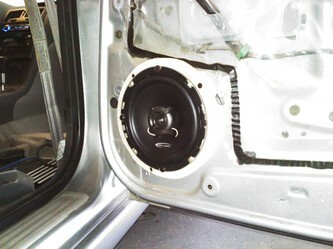 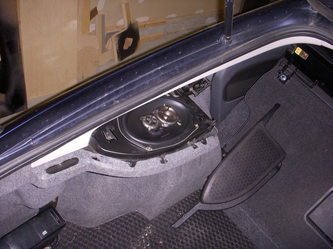 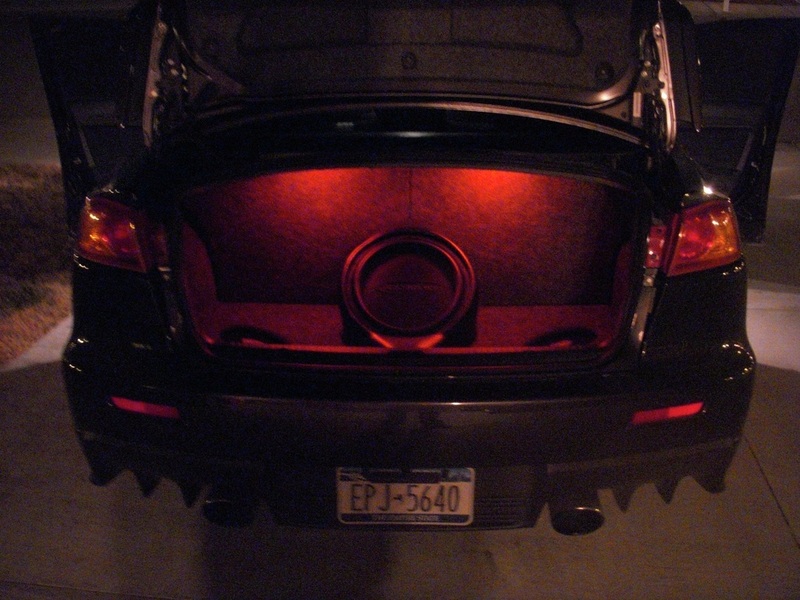 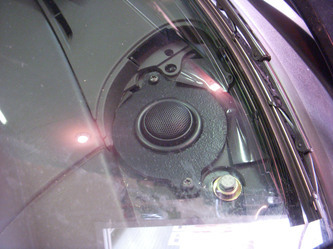 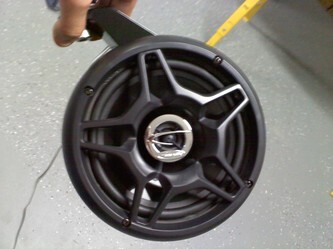 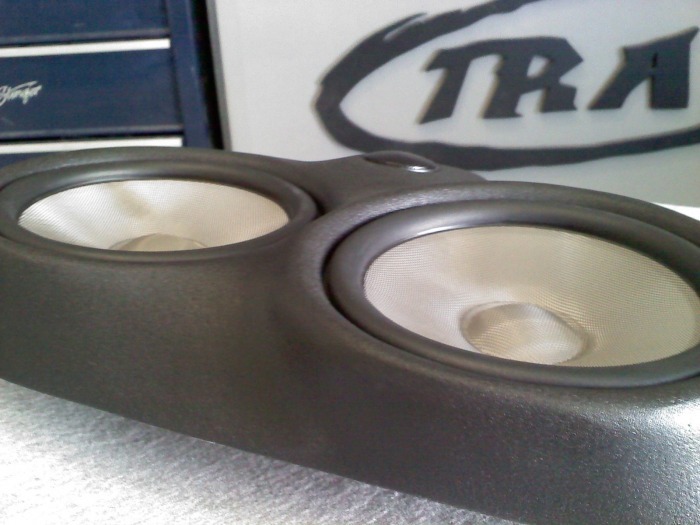 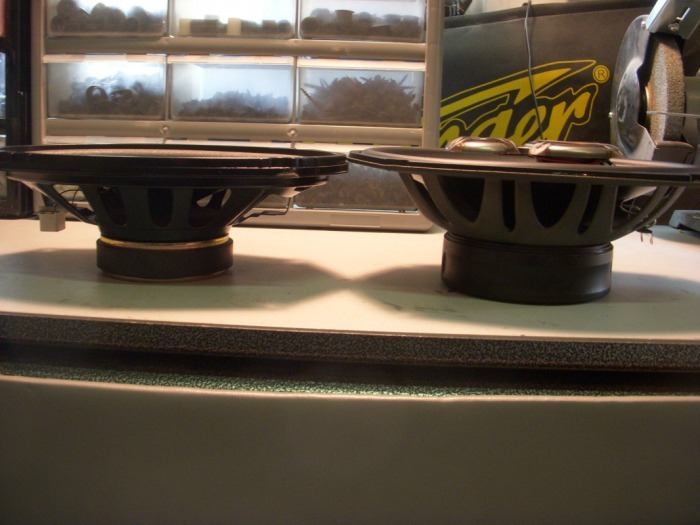 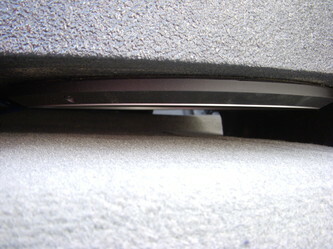 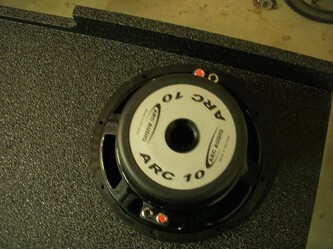 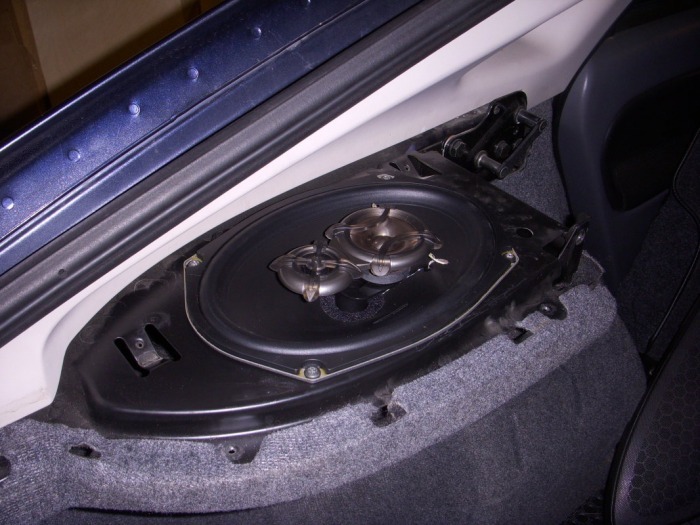 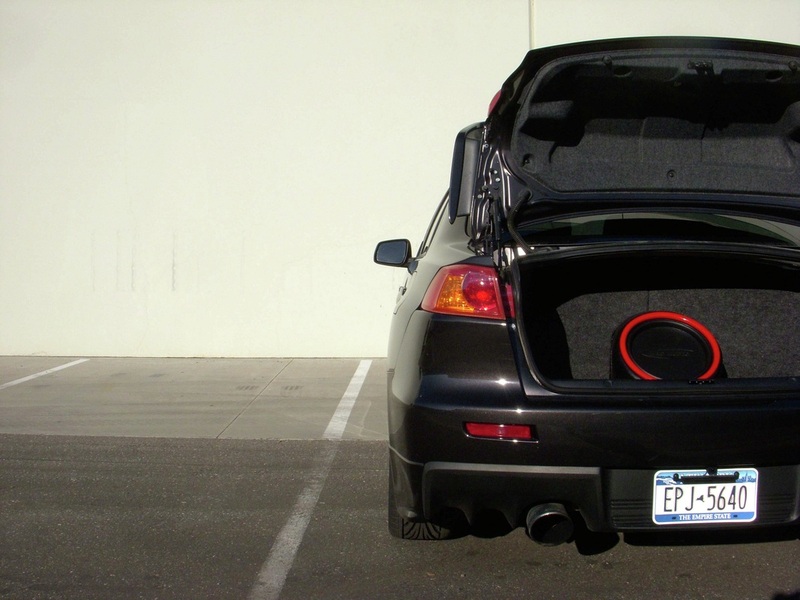 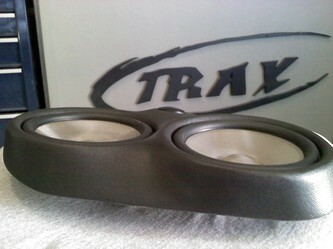 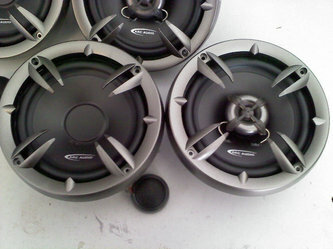 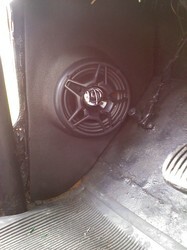 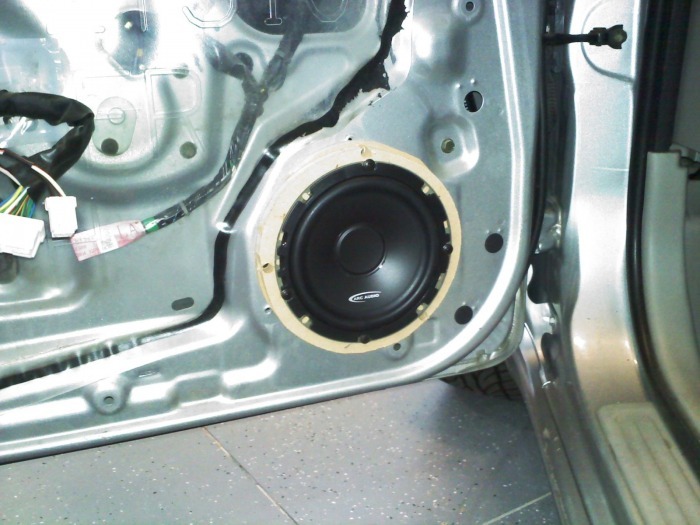 Arc Audio KS 5x7" coaxial speakers in the rear, completely sealed shut for better bass response and vibration decrease. Arc Audio KS 300.4, 4 channel amplifier running the rears and fronts. 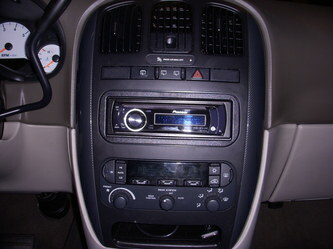 New Kenwood Excelon CD player with iPod integration, Sirius Satellite Radio and Bluetooth built-in. 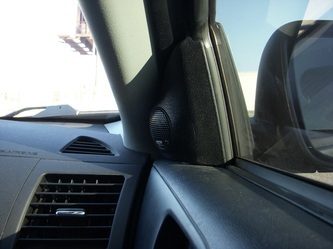 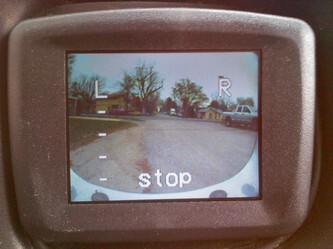 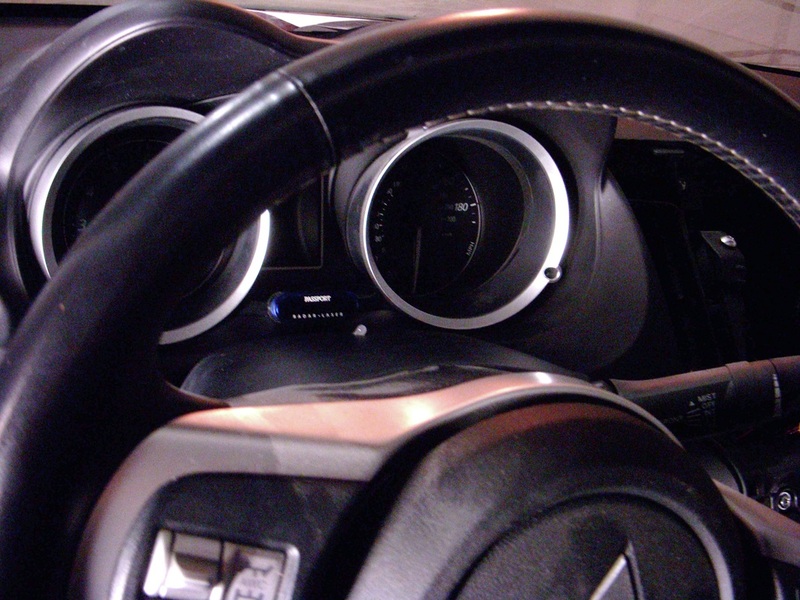 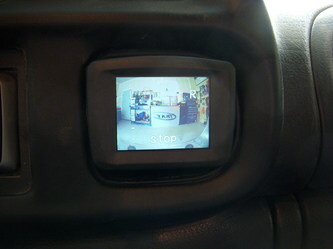 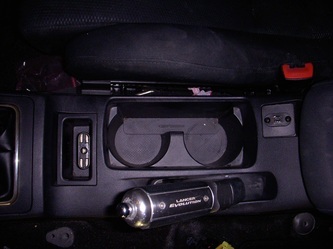 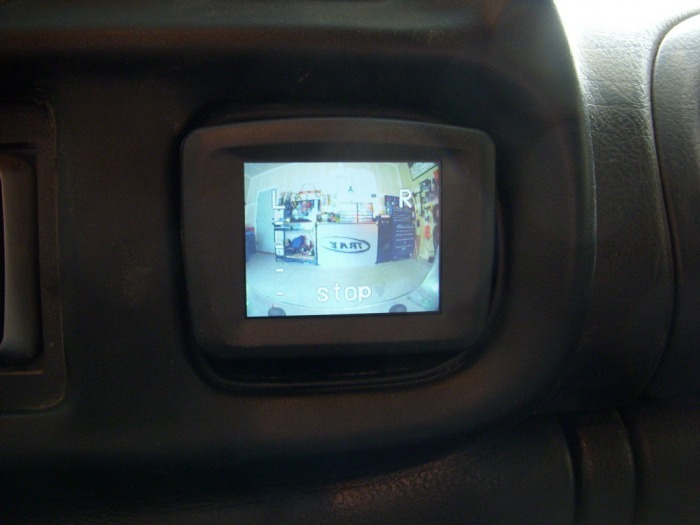 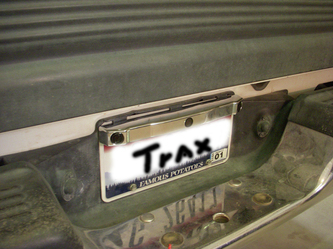 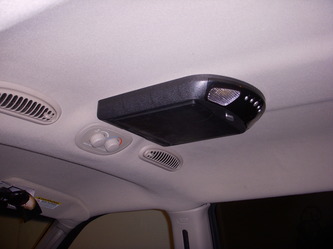 Audiovox Chrome Back-up camera bar with proximity sensors and a 3.5" Screen mounted in stock pocket on dash. Camera turns on when you put it into reverse. 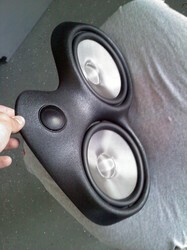 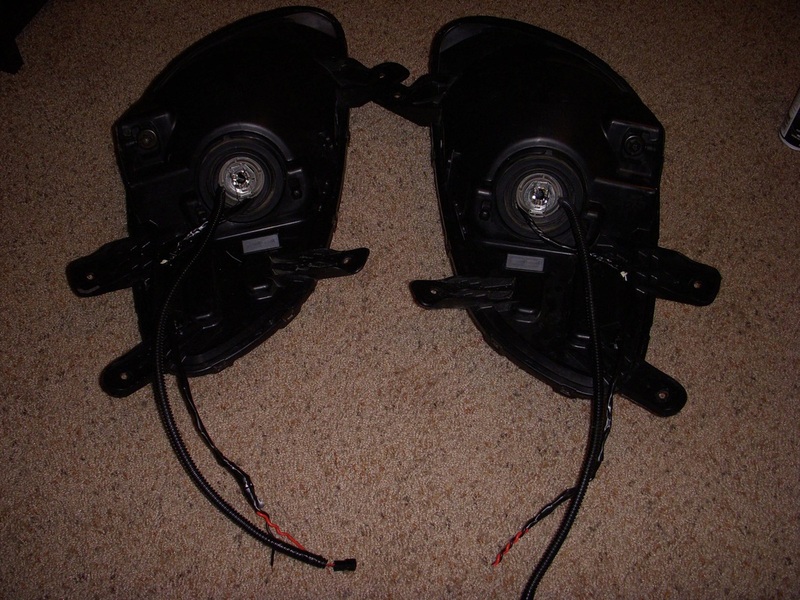 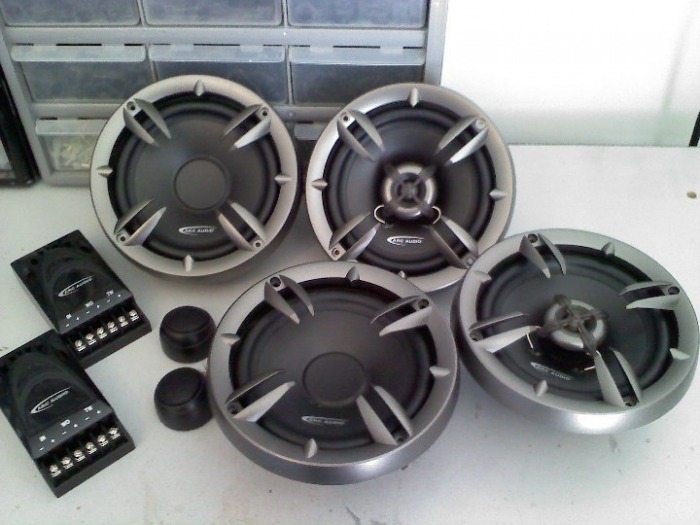 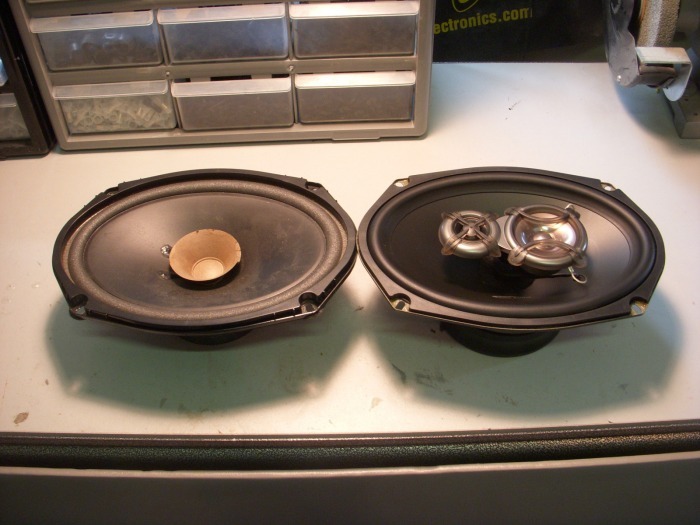 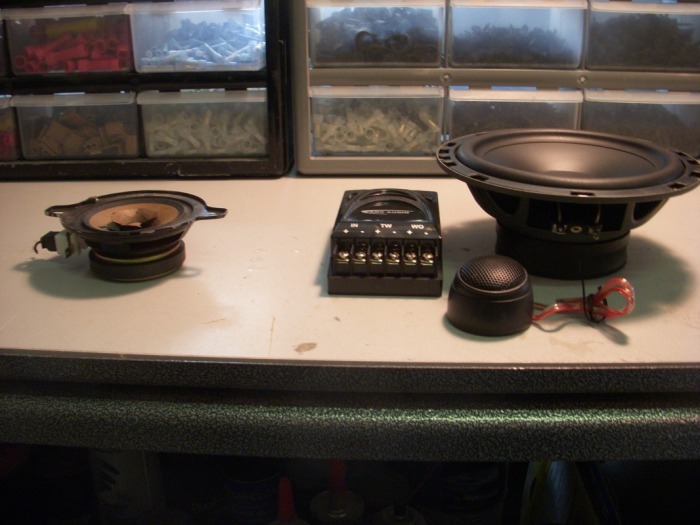 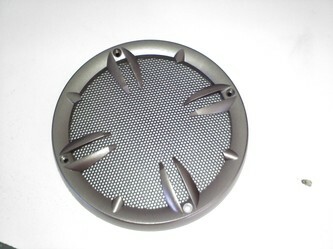 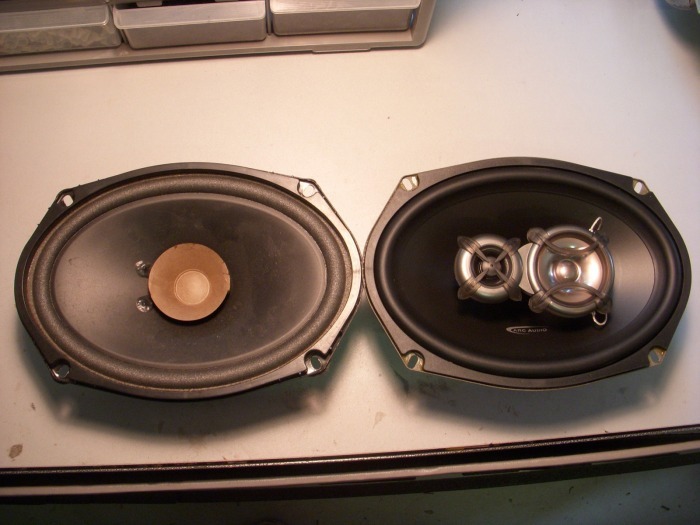 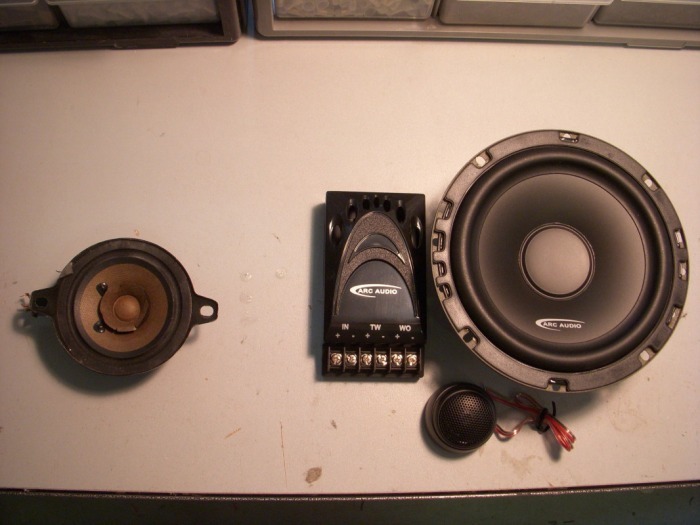 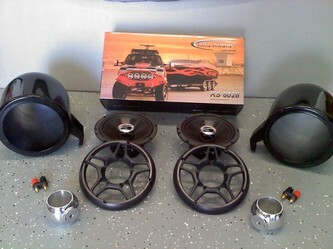 New Arc Audio XXD 6.5" component Speakers to replace the stock 3.5" dash speakers. 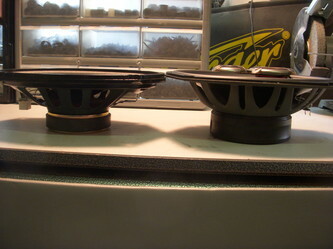 This comparison wasn't even a comparison. 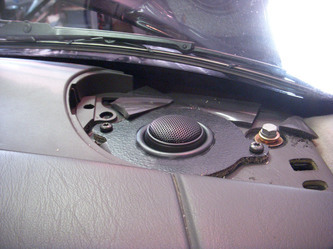 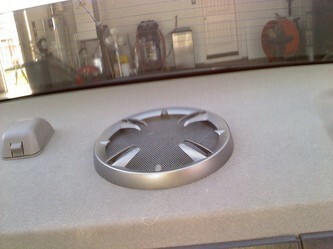 Put the tweeter up on the dash where the stock speaker was, then put the 6.5" in the door where NO speaker was. The bass in this thing with just upgraded speakers and no amp is amazing! Clarity is very impressive! 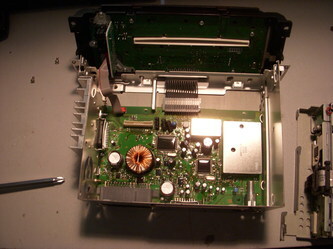 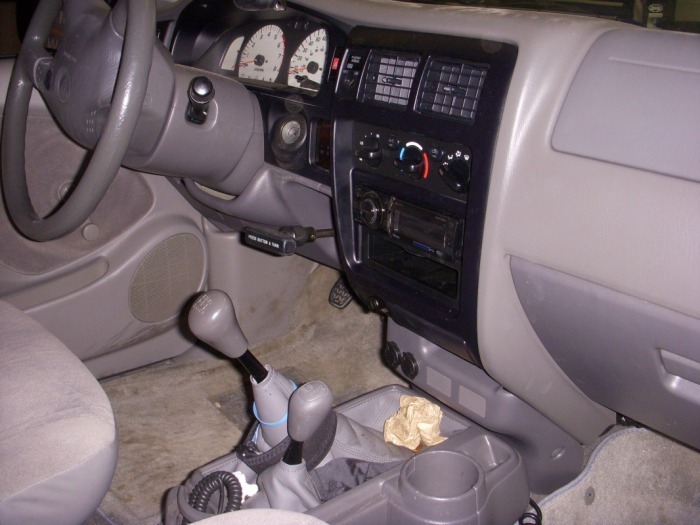 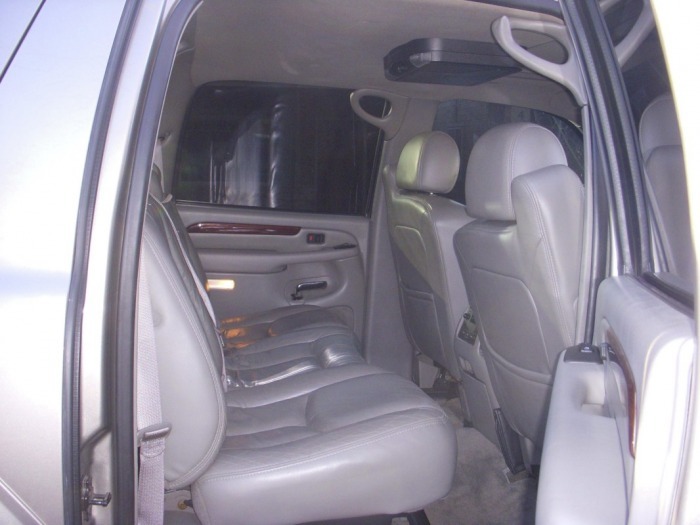 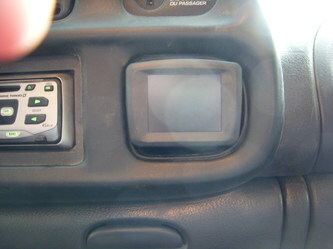 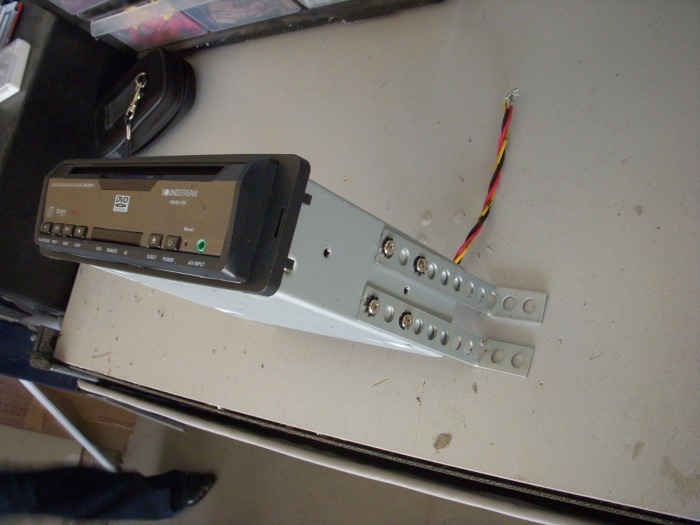 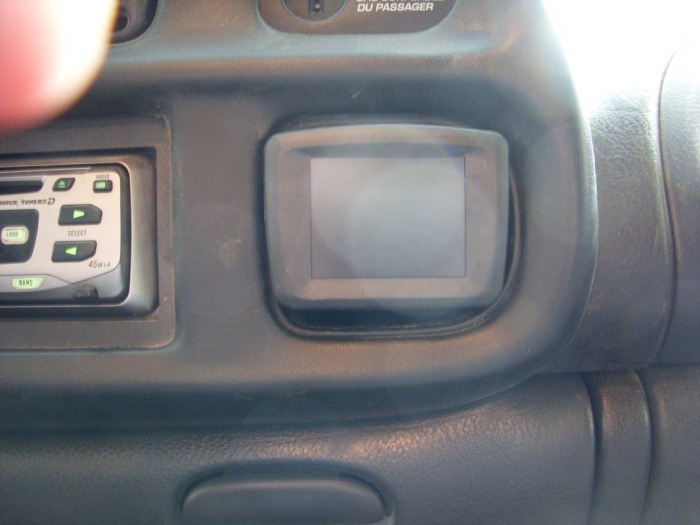 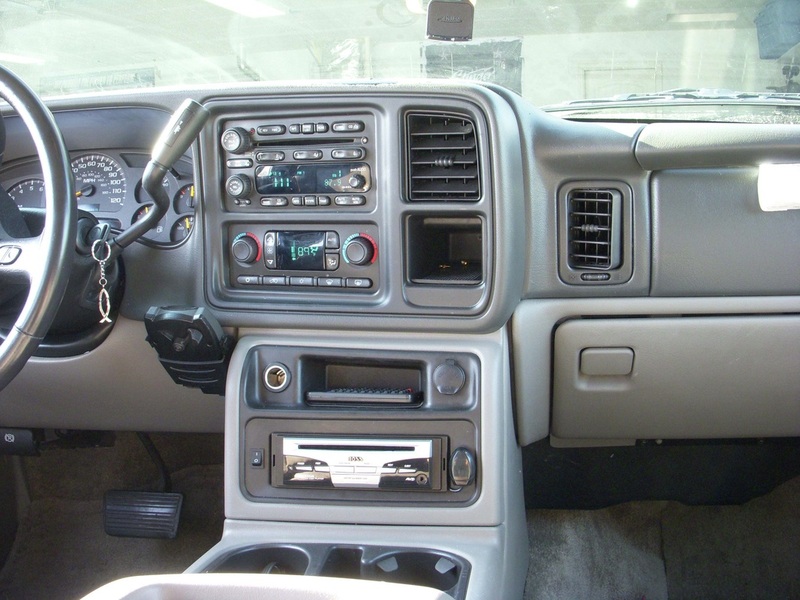 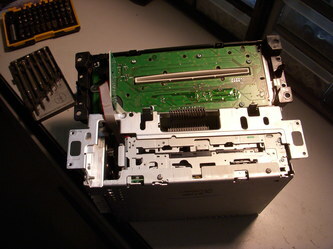 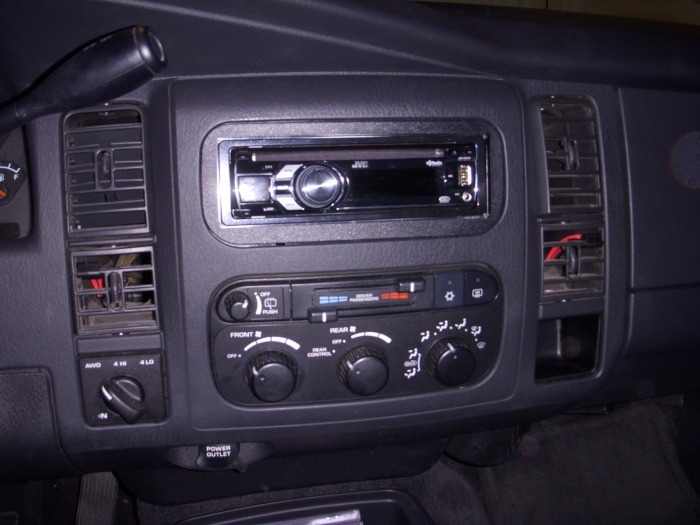 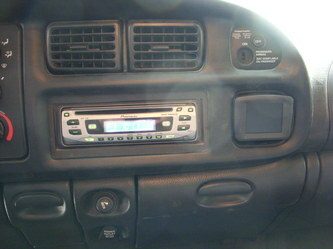 Save Barbara and 5 others from stock (broken) headunit, integrate Overhead Video and install new Pioneer headunit. 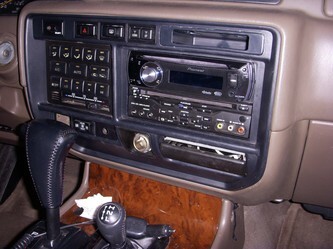 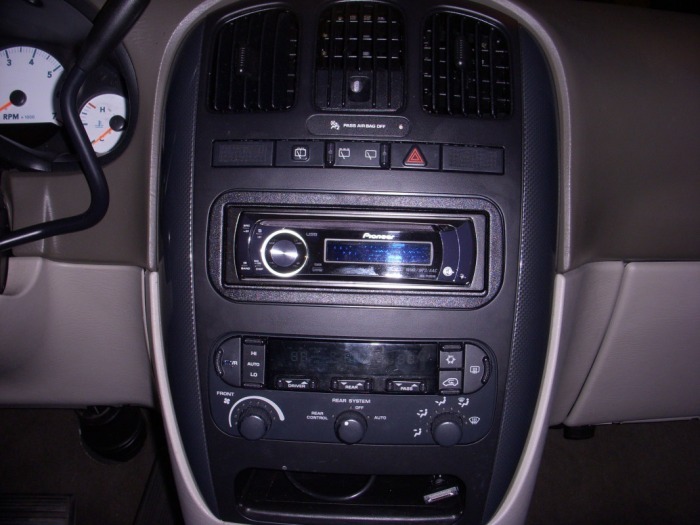 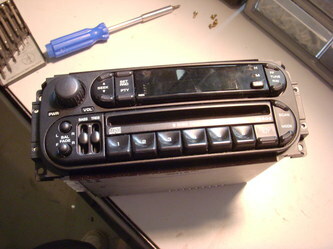 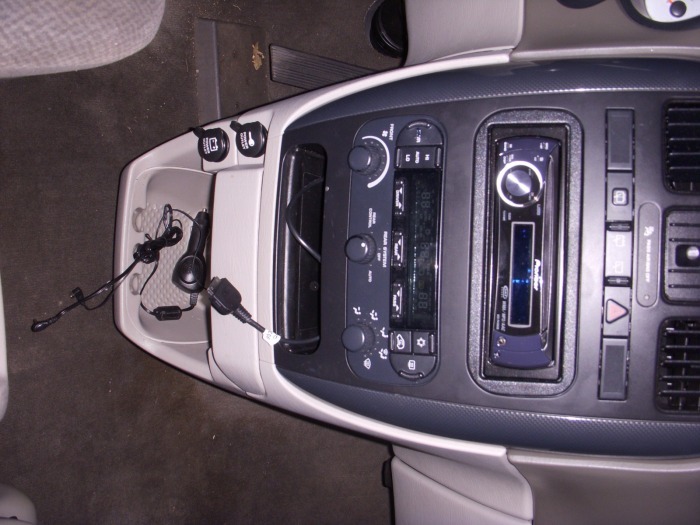 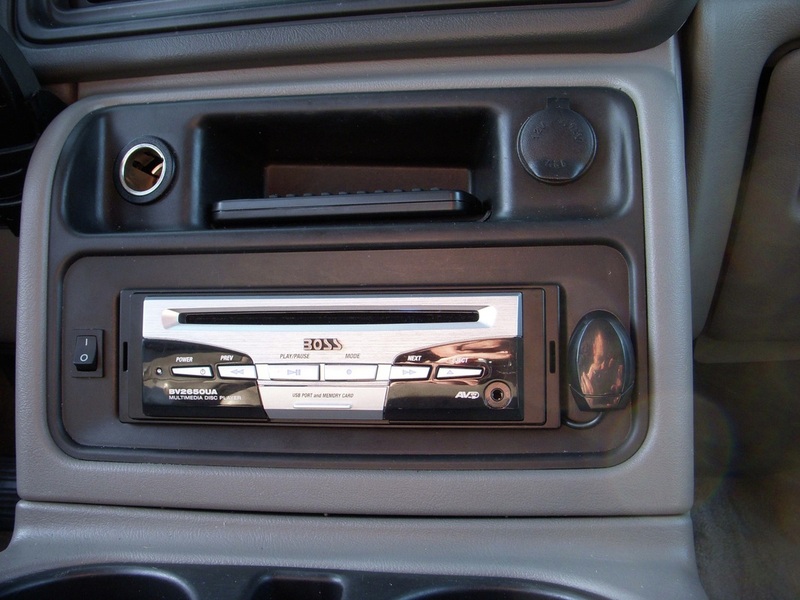 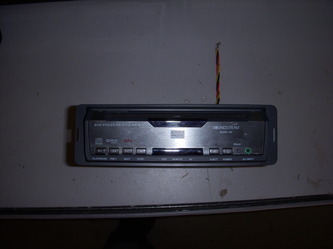 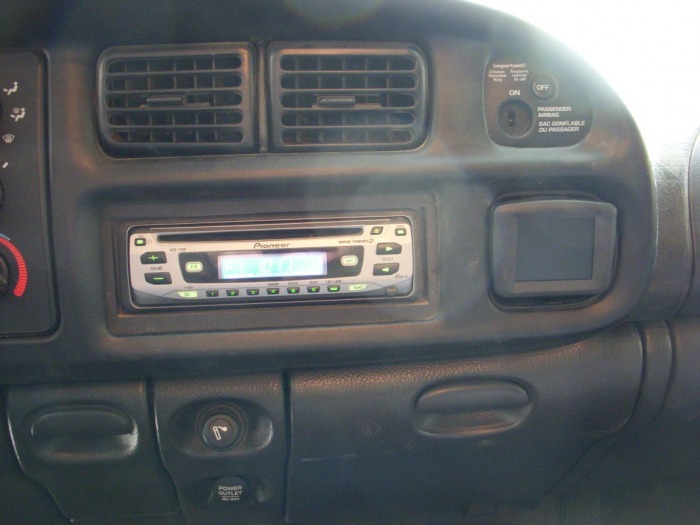 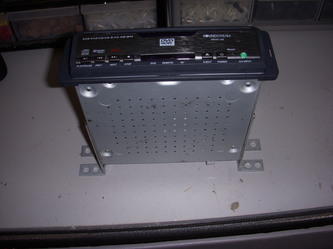 Pioneer CD player with Aux input for portable Satellite Radio and hidden iPod controls. 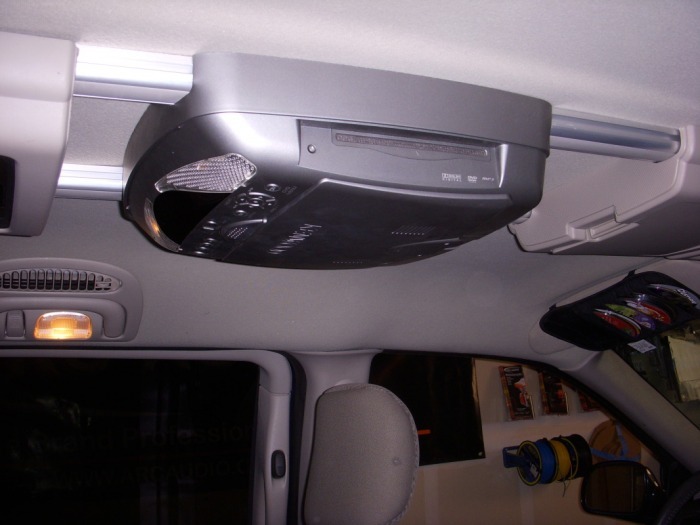 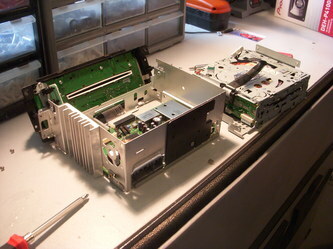 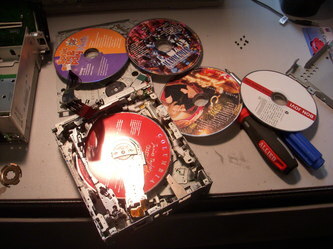 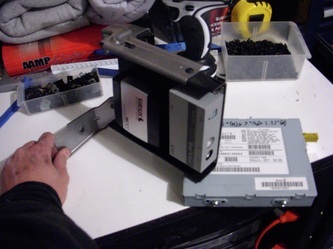 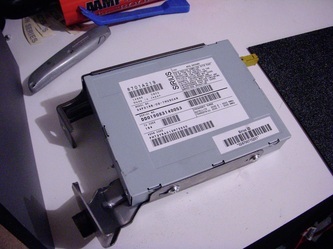 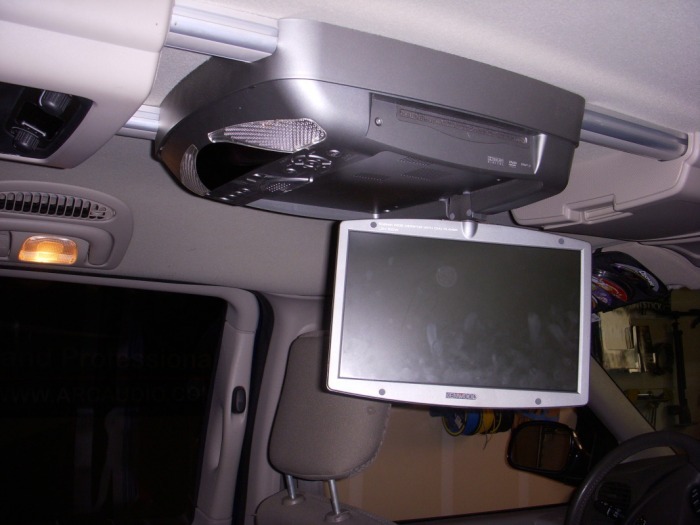 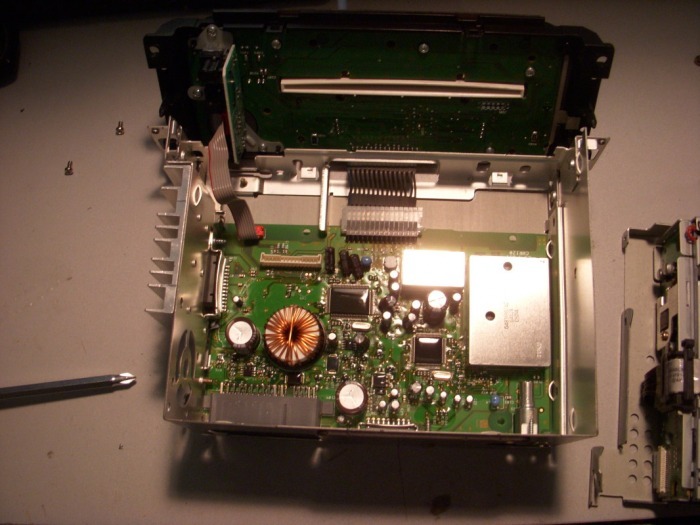 Overhead DVD player integration. 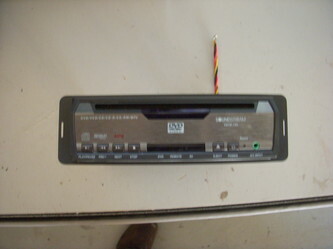 New Pioneer CD Player with Aux Inputs and iPod Controls. Soundstream Detached DVD player custom mounted in Center Console so the kids can't stick any thing other than a DVD into the unit. Soundstram 10" Overhead Video Display mounted to the roof. 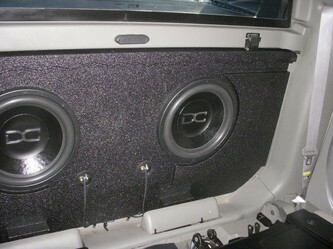 Has to have entertainment for the kids, but I want it loud when their not in the back. 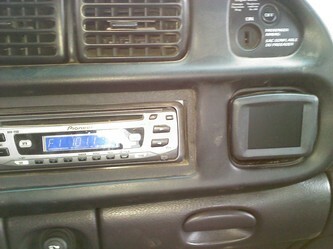 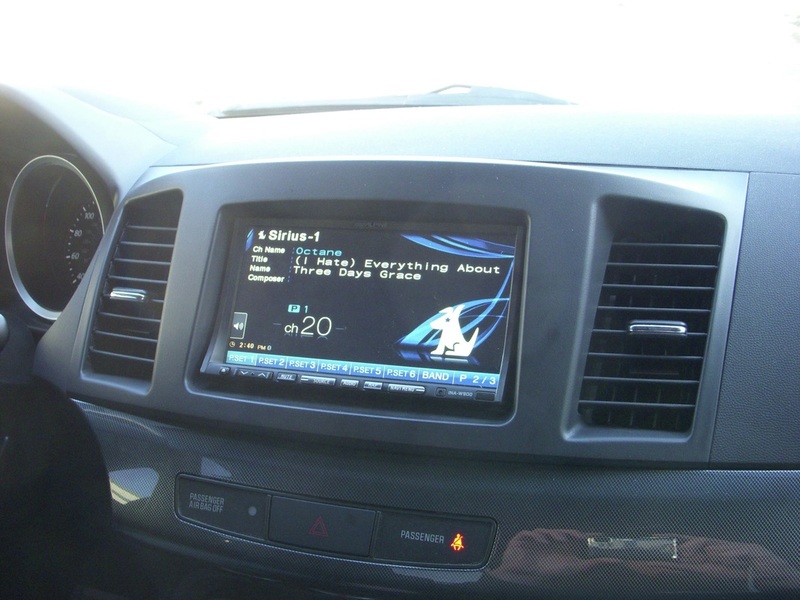 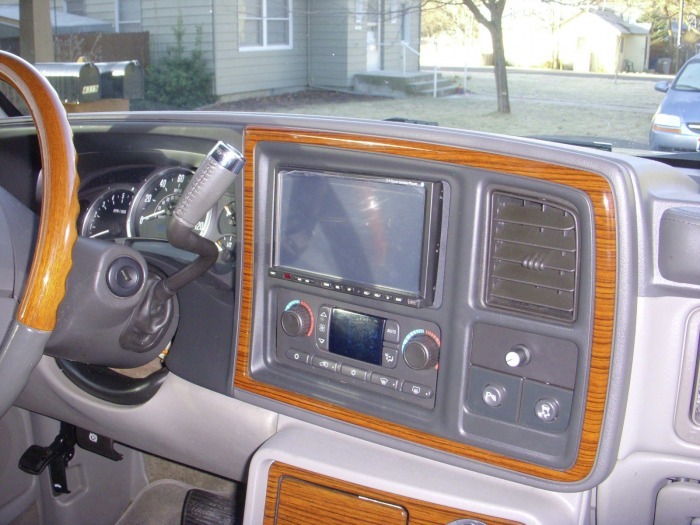 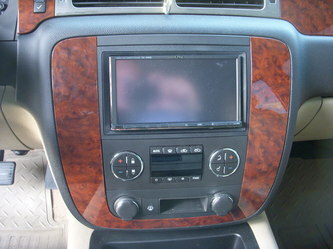 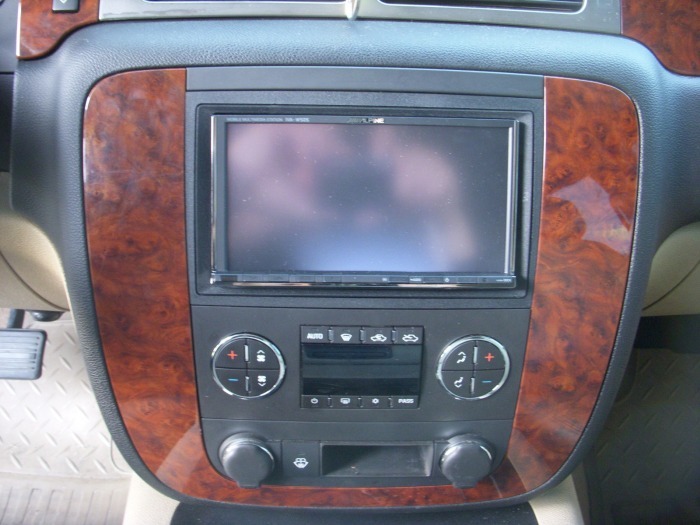 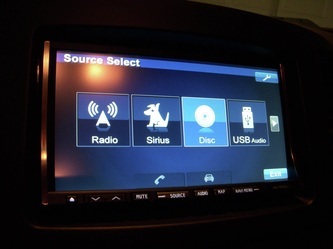 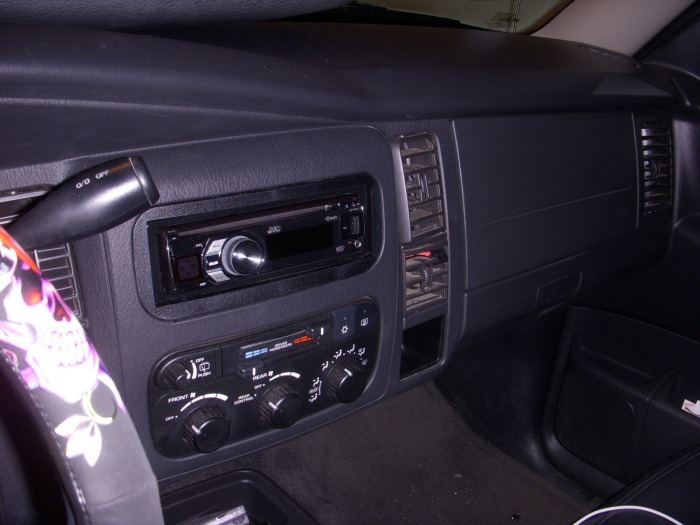 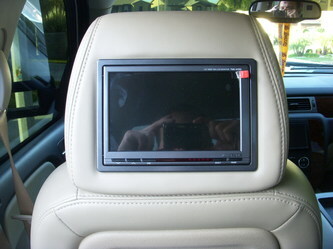 7" JVC Touchscreen DVD player custom fit into dash panel with iPod and custom iPhone mount. 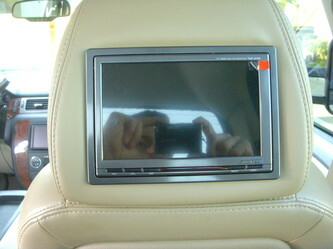 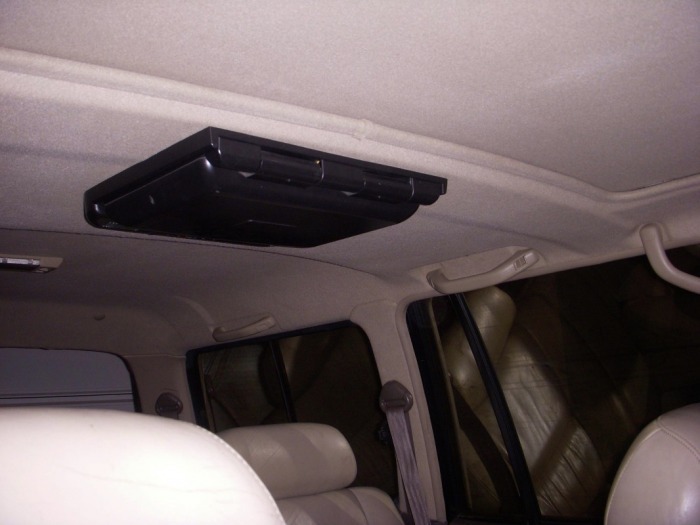 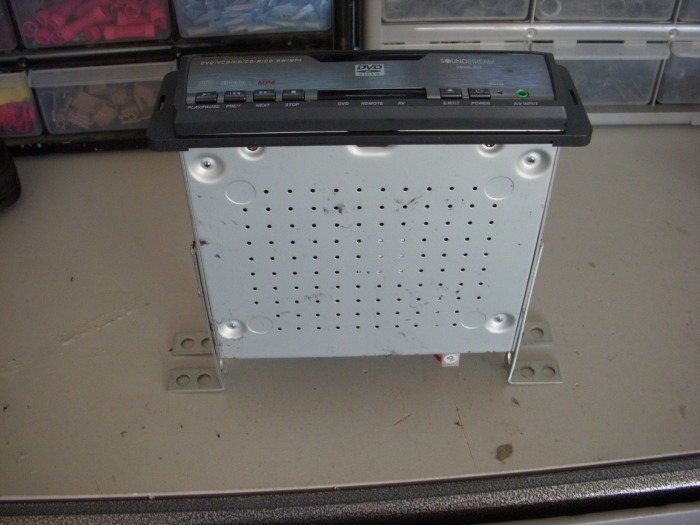 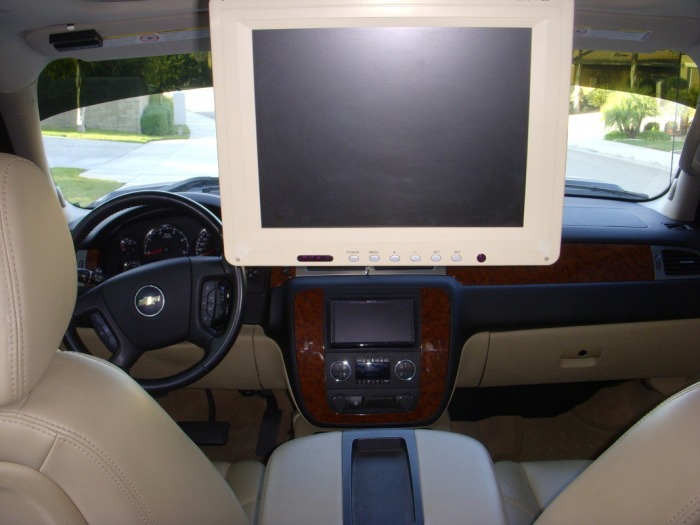 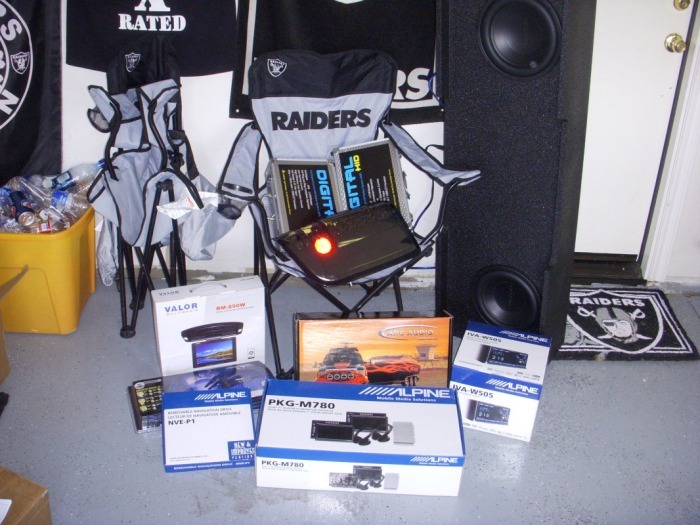 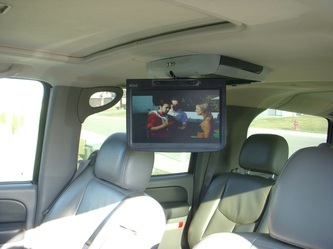 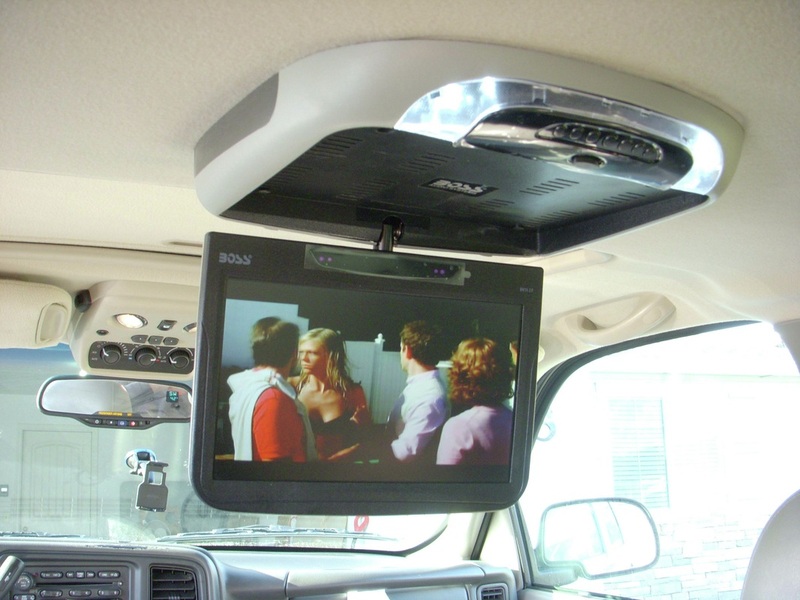 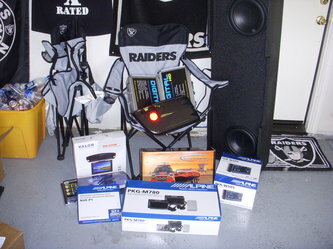 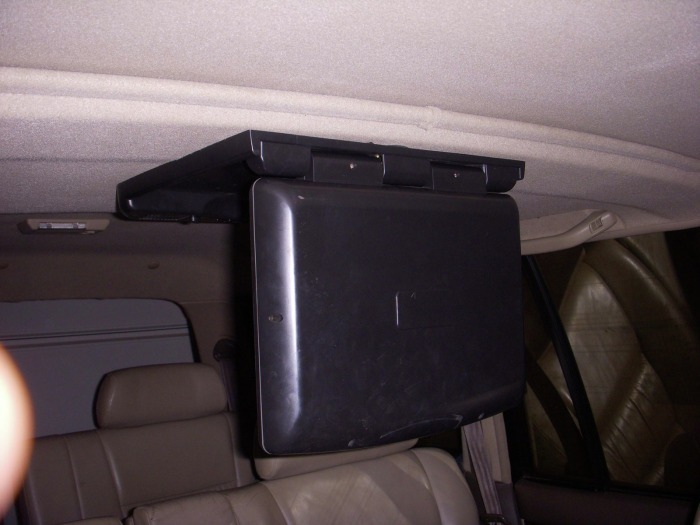 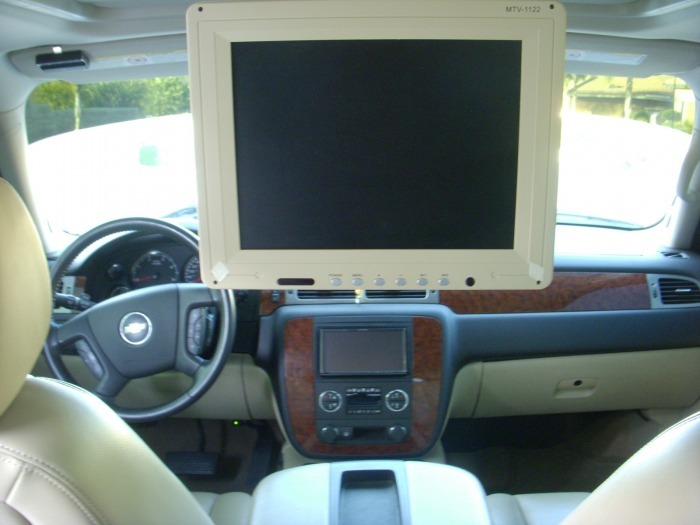 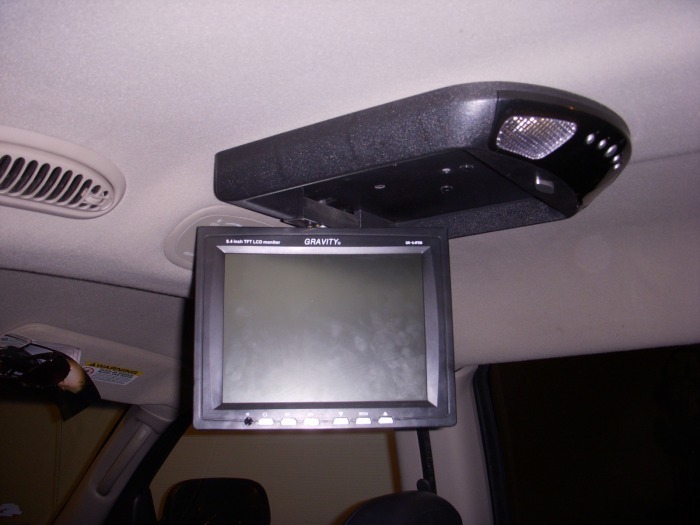 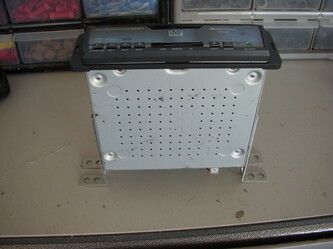 22" Drop Down Overhead DVD player and screen. Arc Audio 1000 watt amplifier pushing (2) DC Sound Lab 12" Level 3 Subwoofers in a Custom Rhino Lined Box that can still fold down to access truck bed. 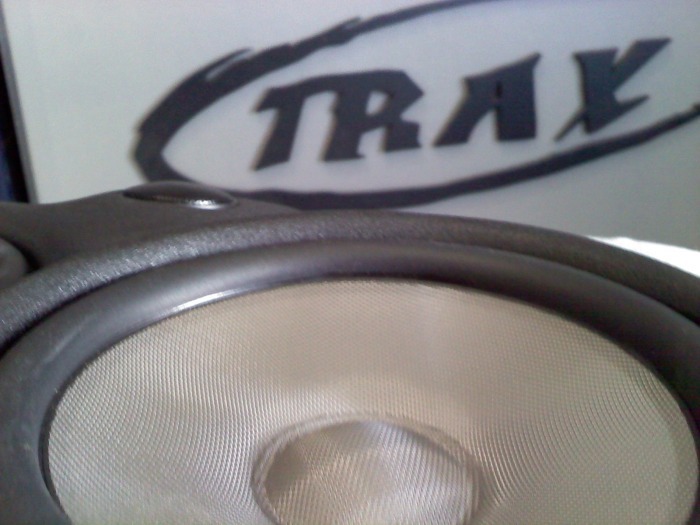 Take out the old equipment, put in some new technology, and add some bass! 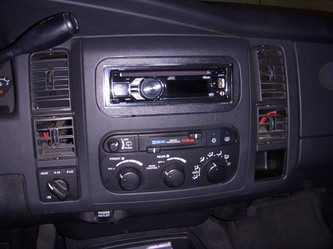 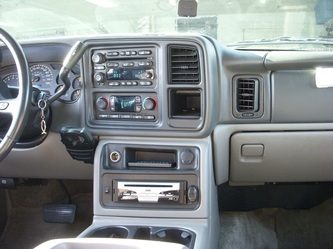 Pioneer Headunit with a new, custom mounted Power Antenna, with iPod and aux inputs. 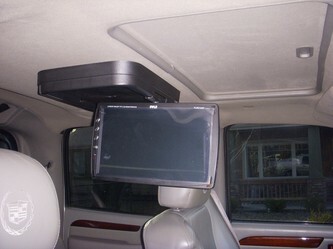 DVD player under the headunit, running a 10" flip down monitor on the roof. 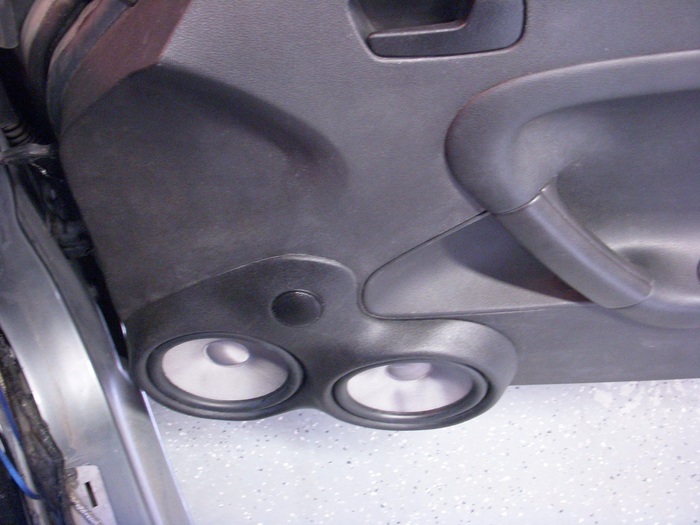 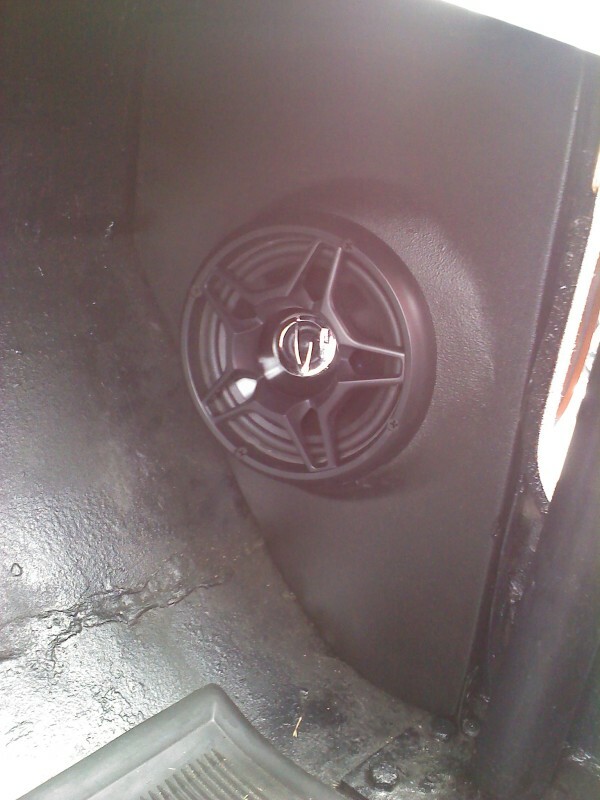 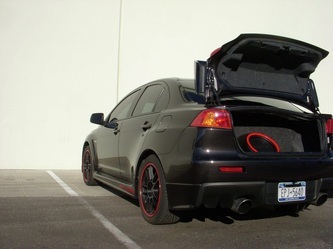 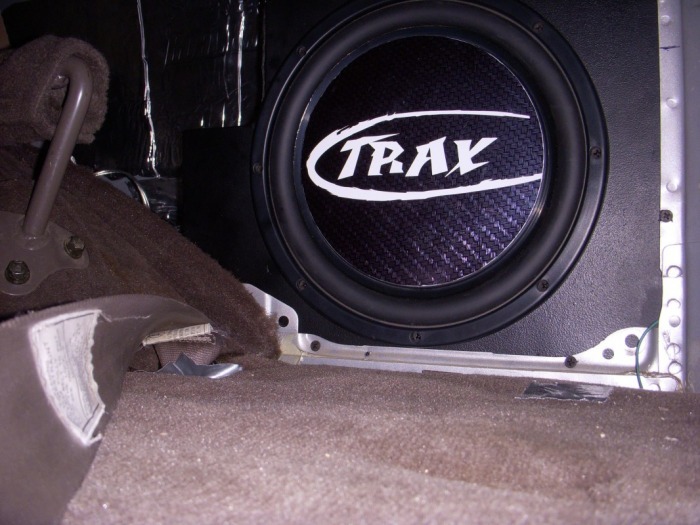 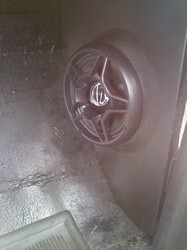 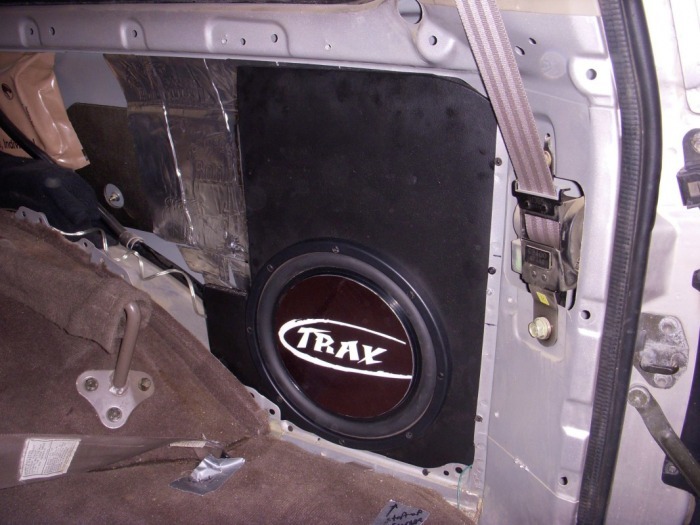 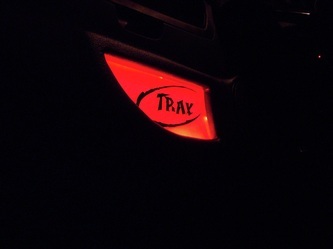 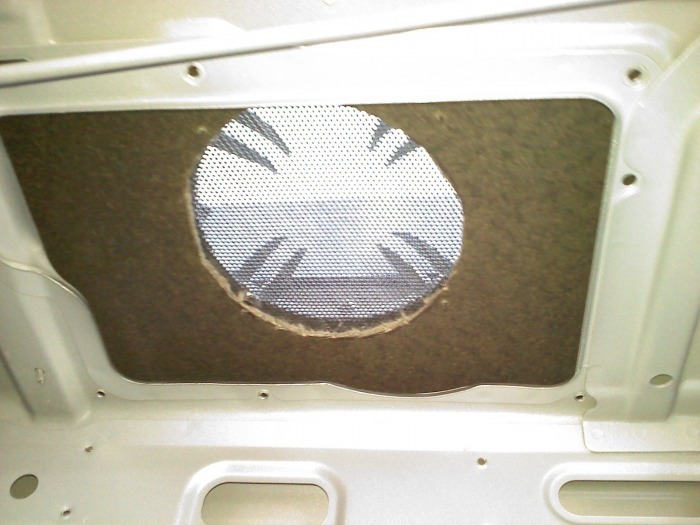 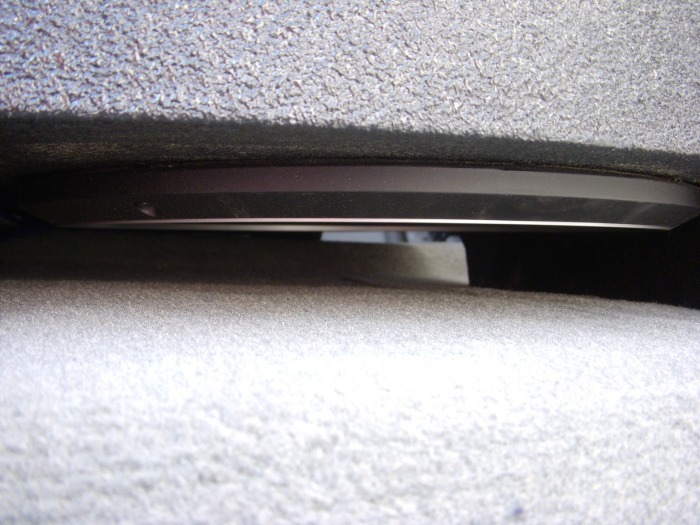 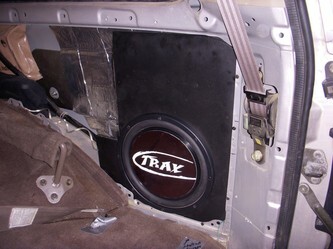 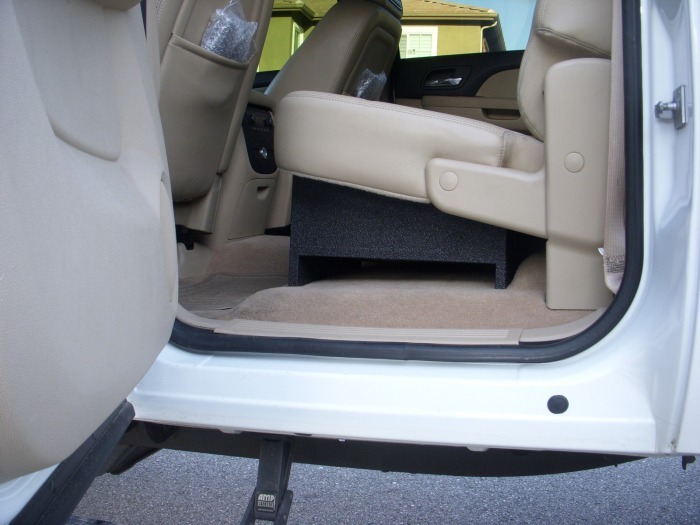 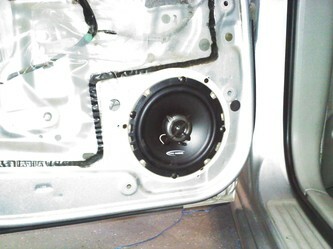 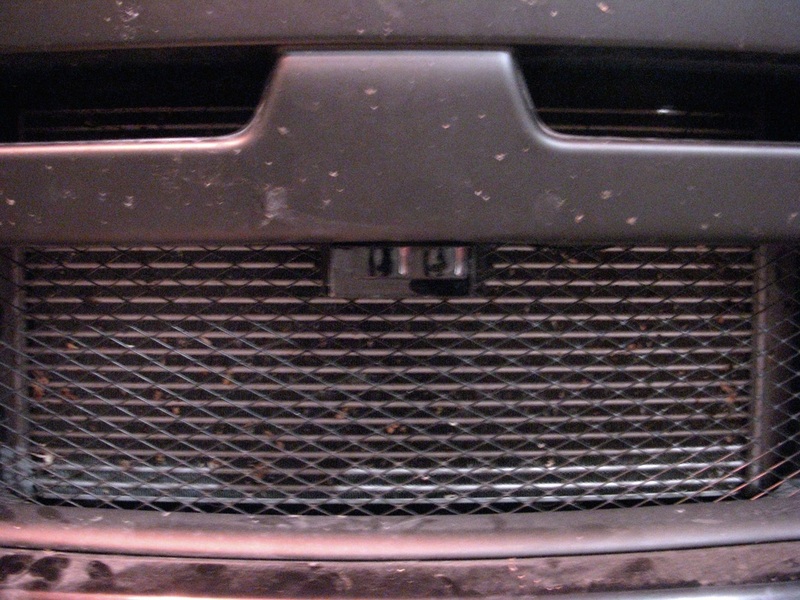 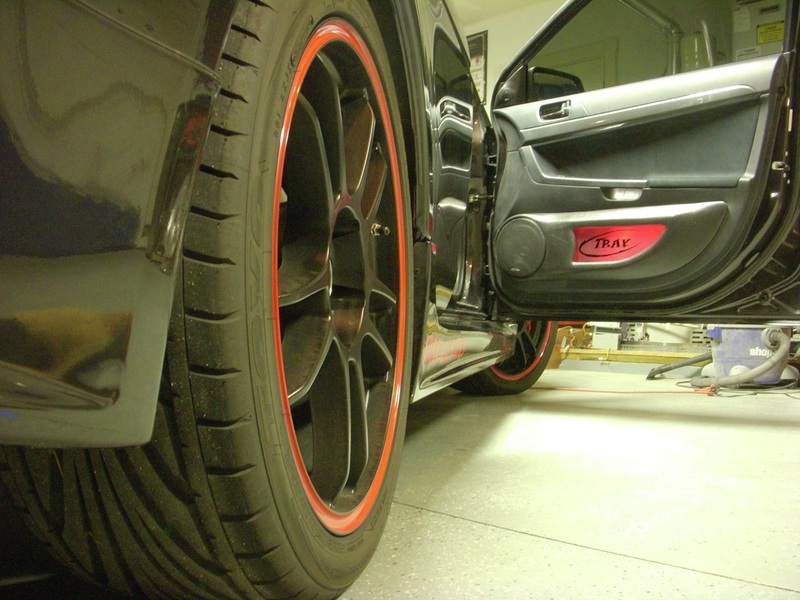 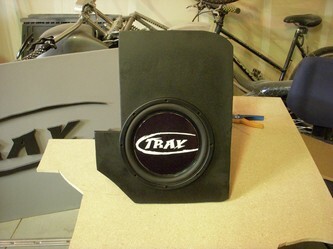 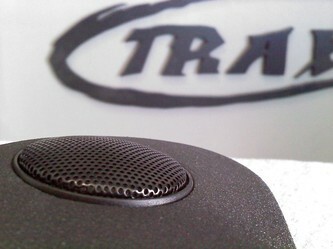 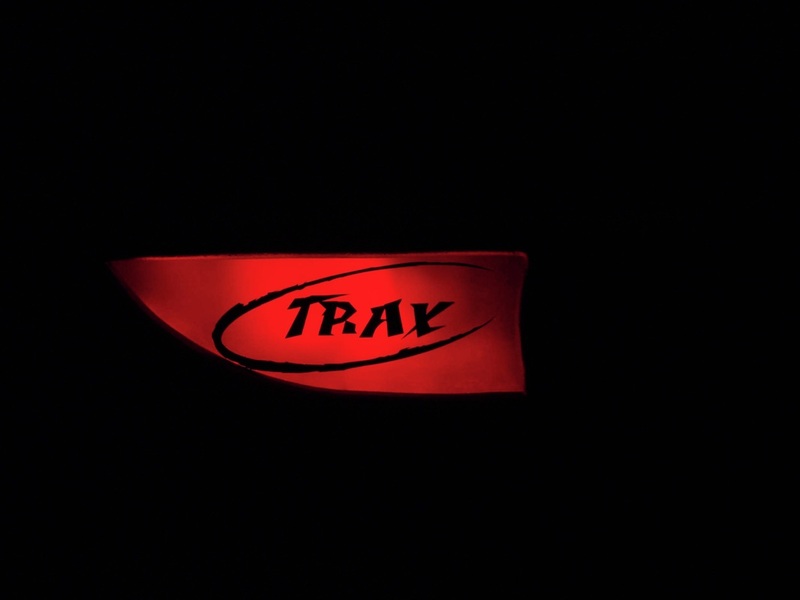 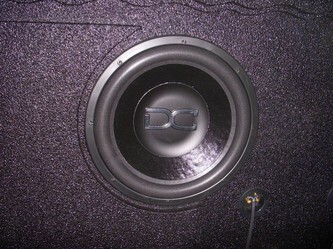 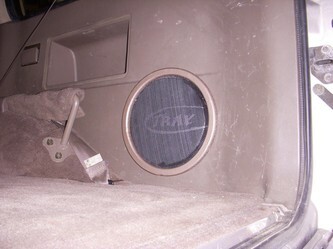 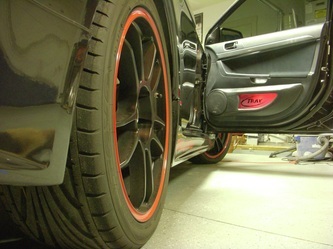 Custom Made and fitted Stealth subwoofer box in rear quarter panel, with a custom subwoofer grill to protect it.